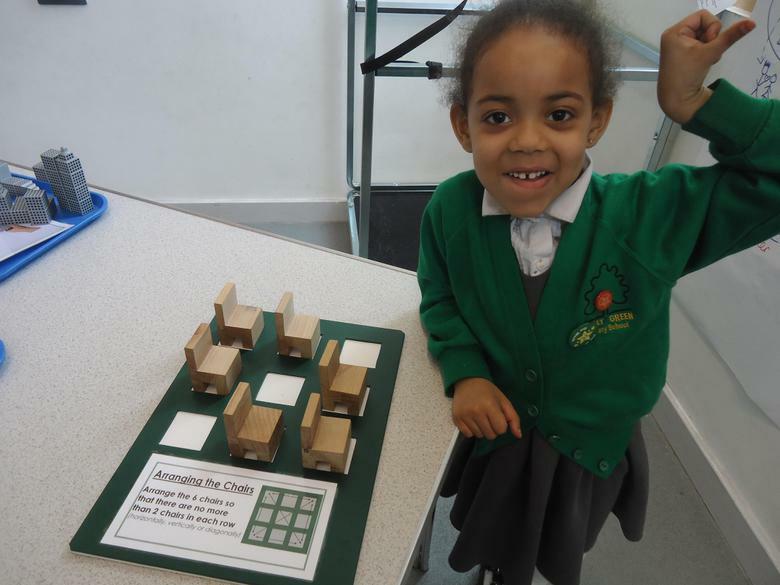 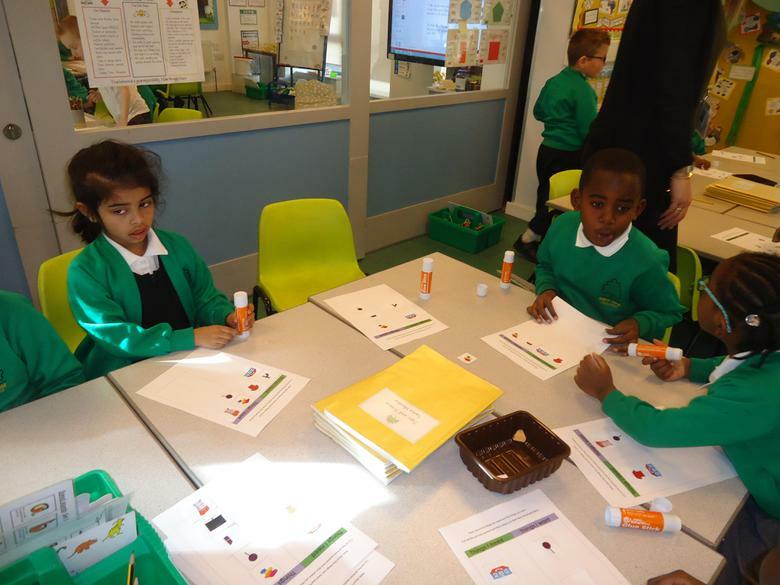 Welcome to Maths at Henley Green! 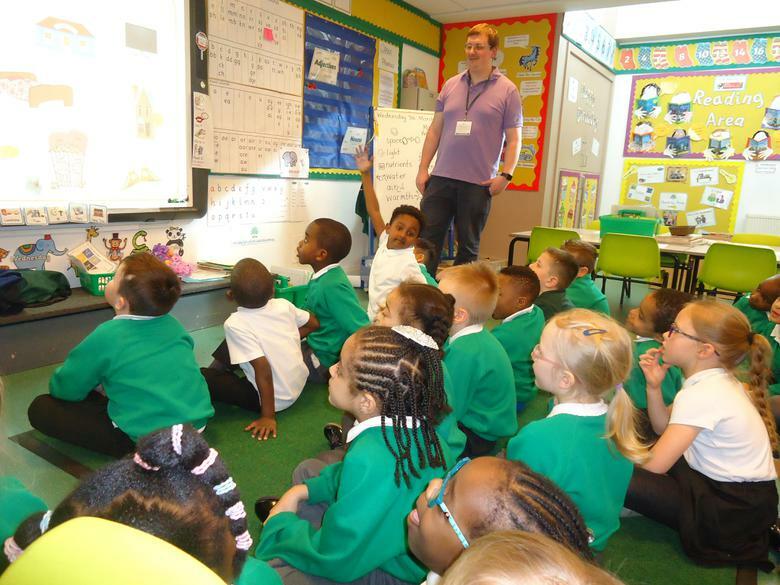 From September 2014, a new National Curriculum was introduced. 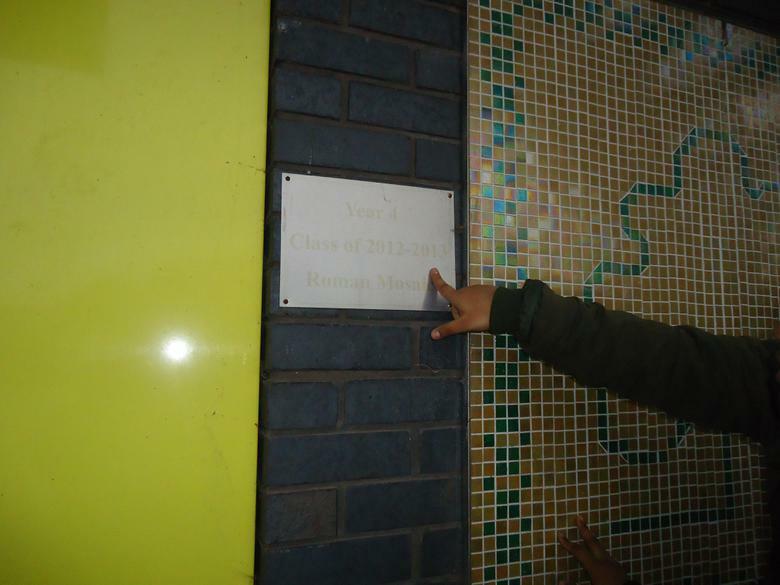 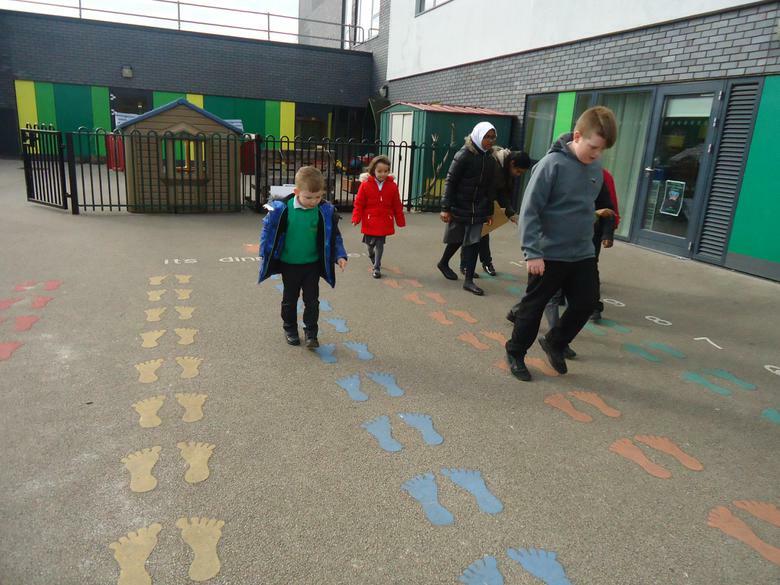 This is now in place for all children in Years 1 to 6. 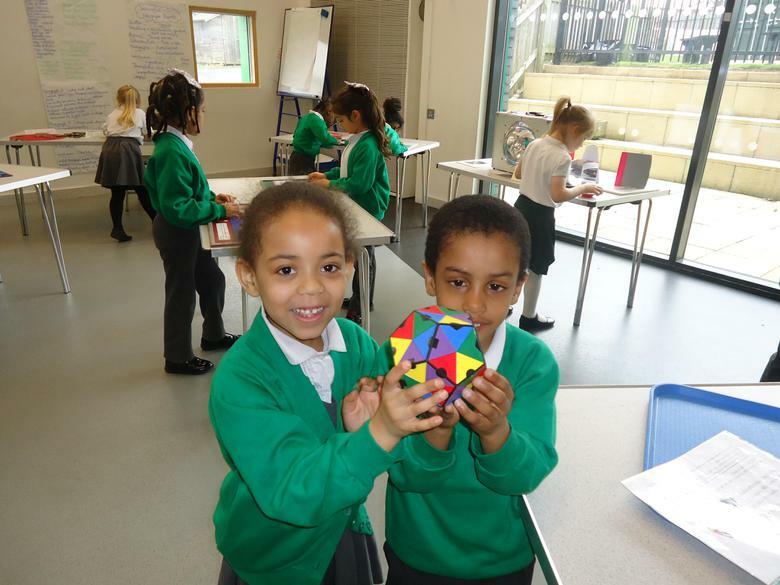 Please click the link below to see the key areas of learning in the new curriculum. 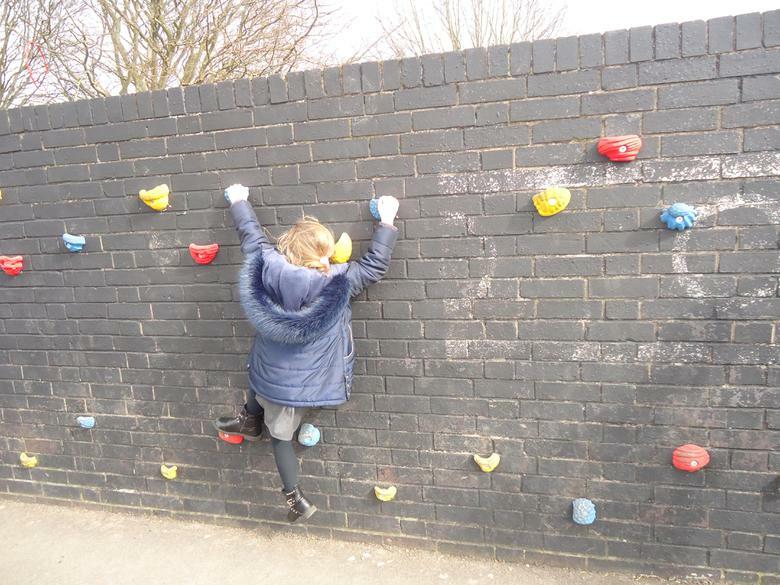 We will be striving to achieve these when working with your child at school and we appreciate any support you can give in supporting your child with these outcomes at home. 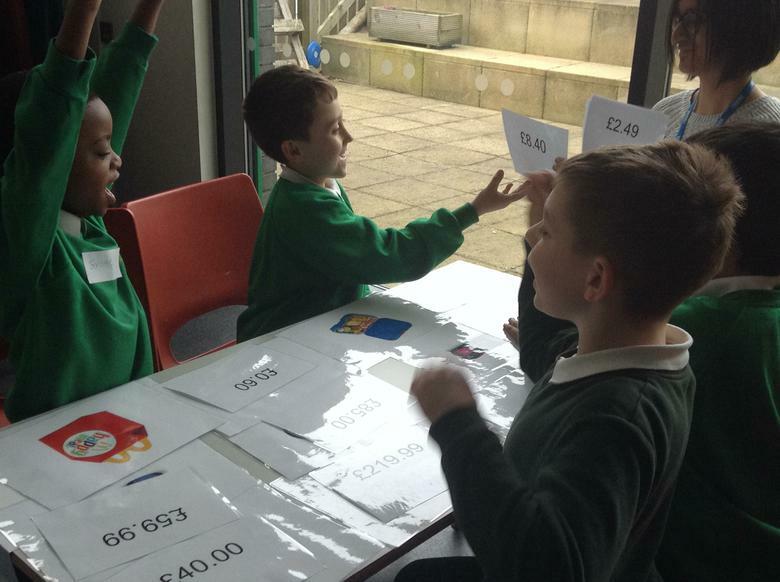 Times Tables Rock Stars Competition! 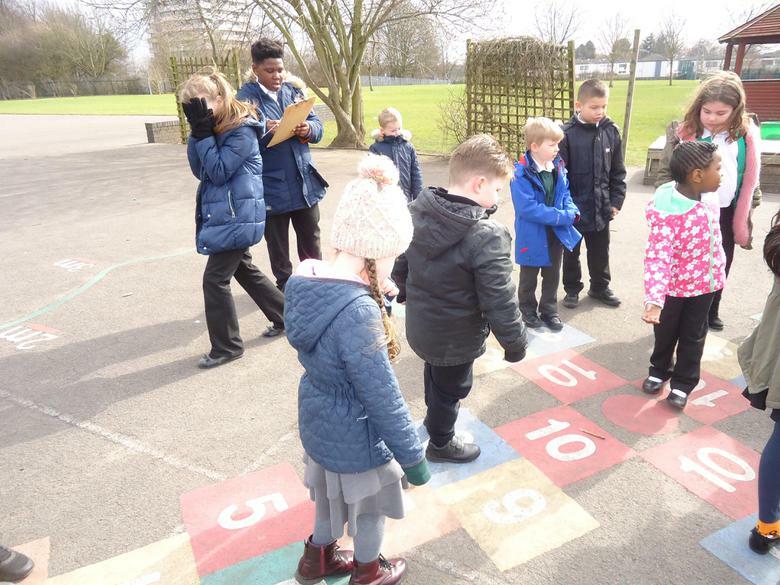 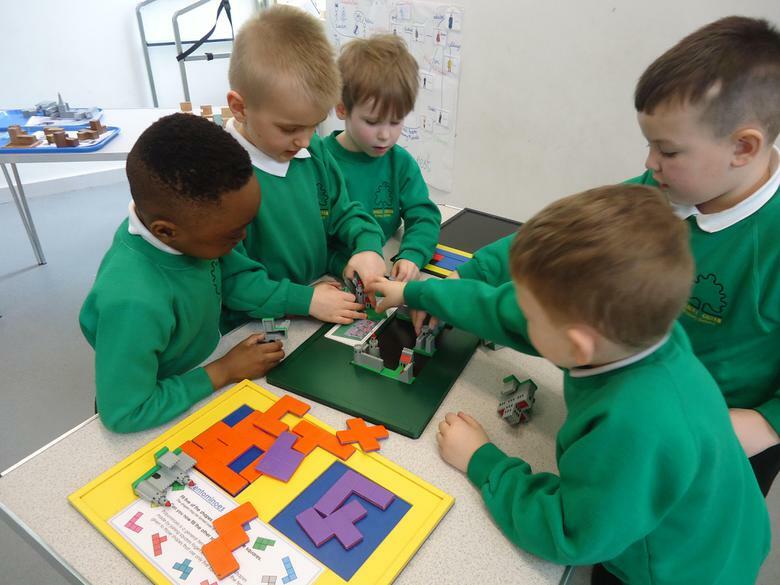 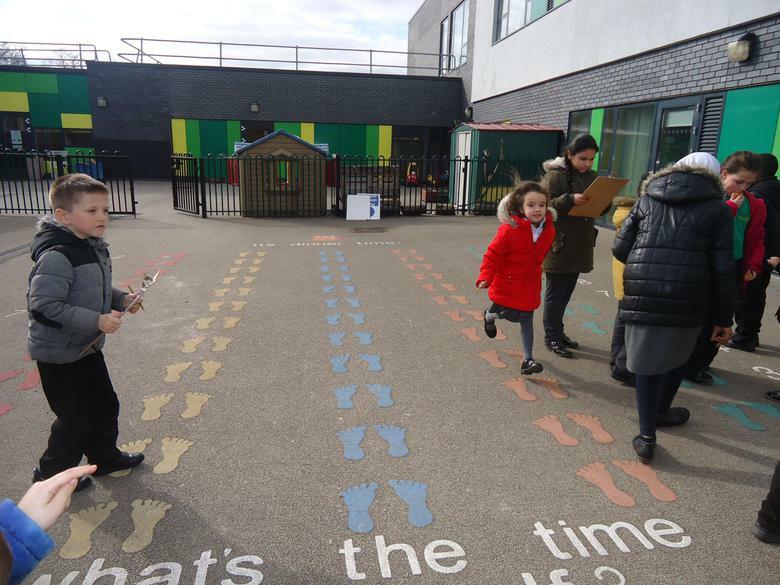 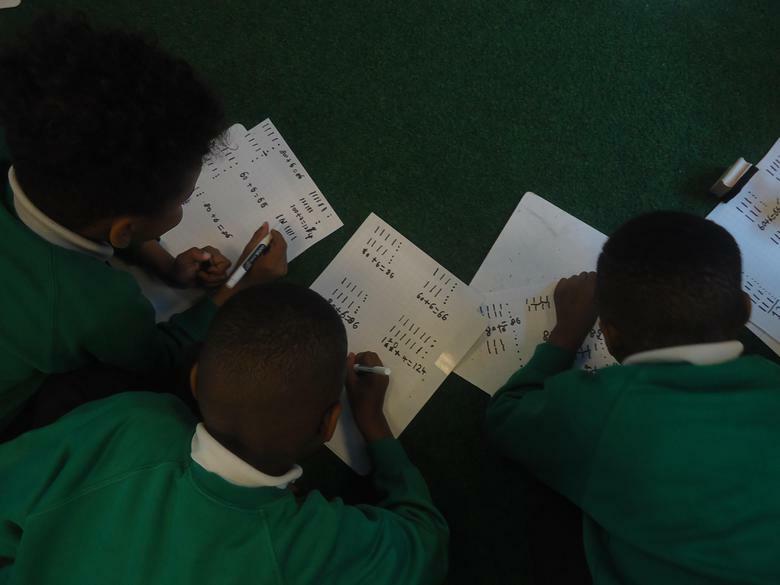 Children in KS2 have taken part in our fourth TTRS Competition, finding out who the fastest mathematicians are in Years 3 and 4 and Years 5 and 6! 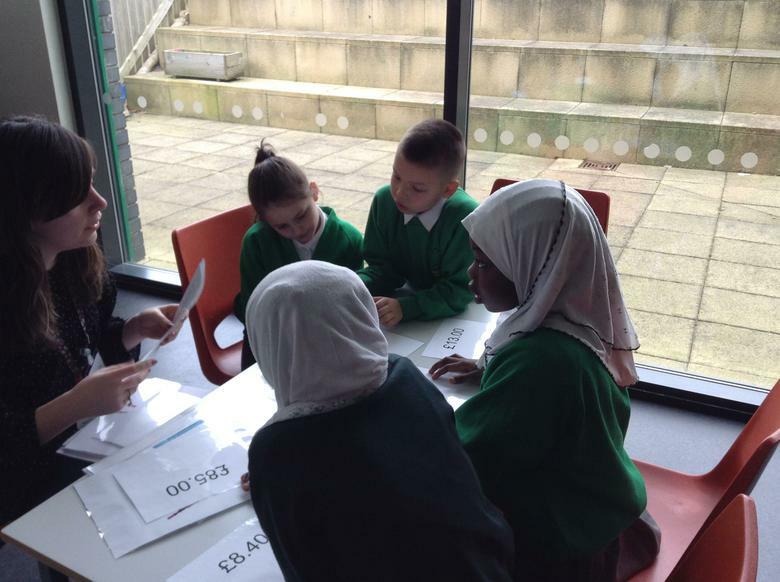 All pupils got to take part in the heats and three children from each class went through to the final. 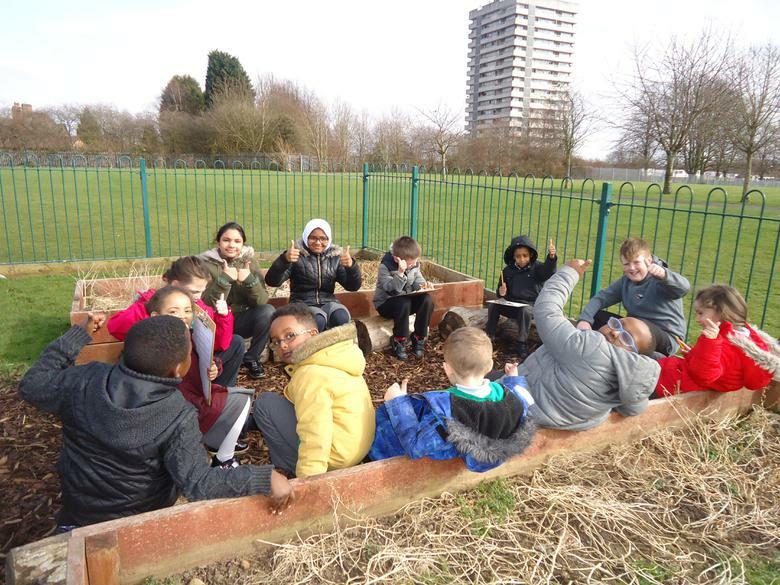 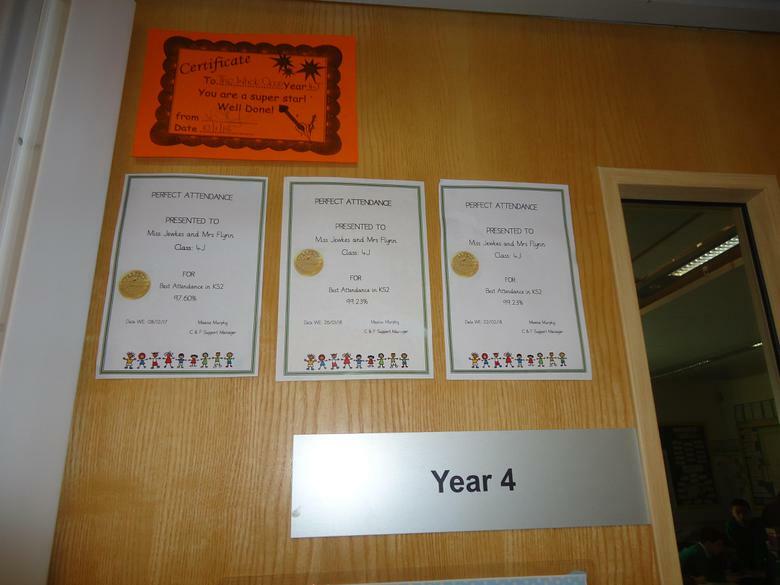 Children's scores have improved brilliantly - the practise has paid off, well done! 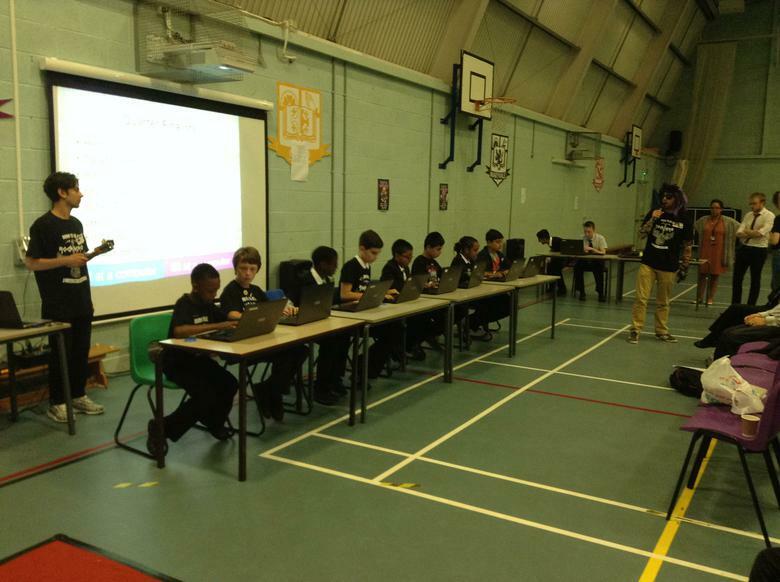 The Grand Final was closely contested with most pupils answering a question every second or even faster! 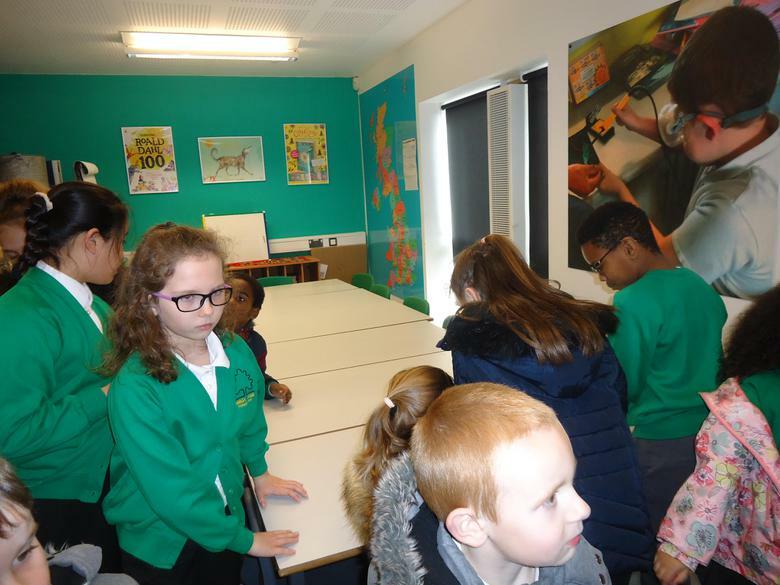 The winner in Year 4 answered an amazing 63 questions in a minute with the winner in Year 5 answering an astonishing 75 questions! 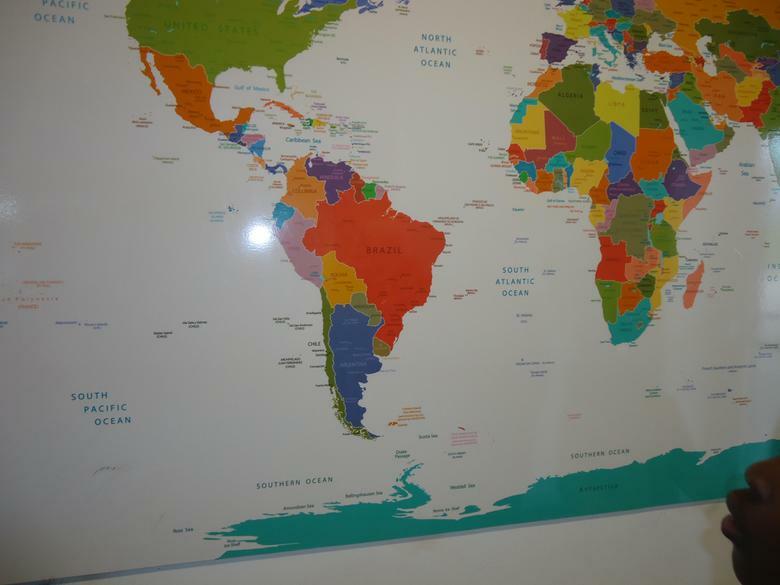 Who will be the next TTRS Champion? 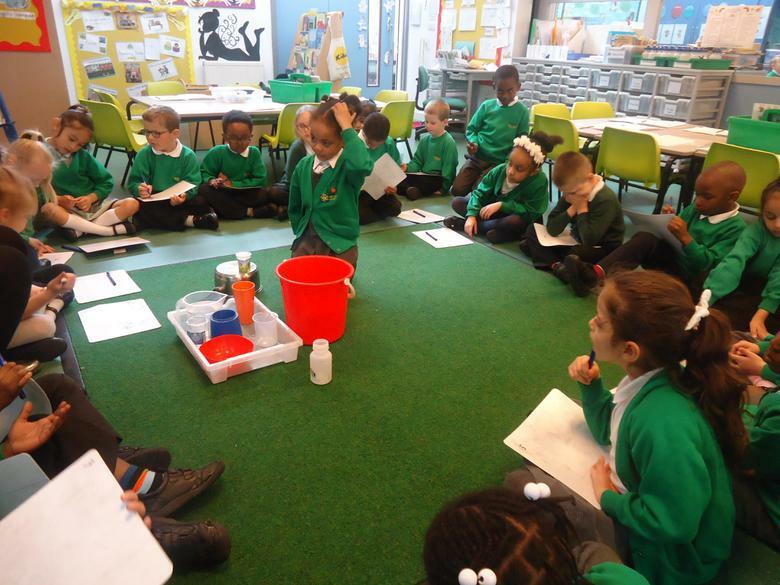 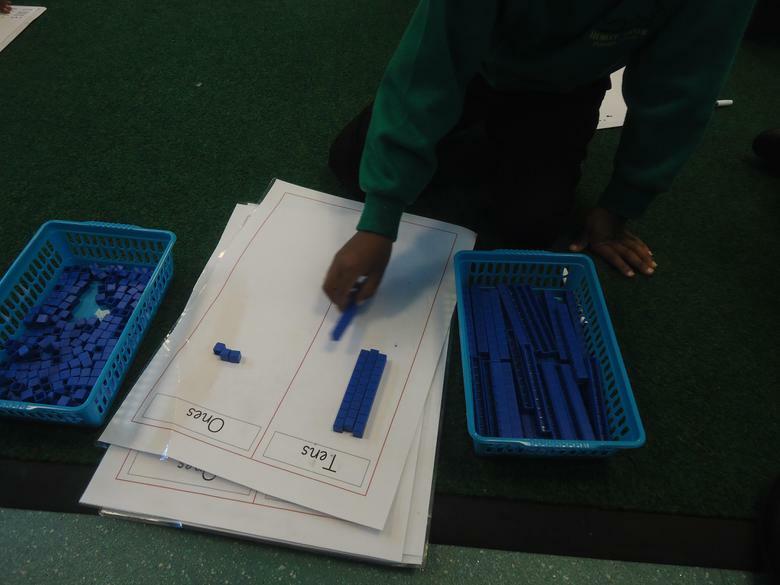 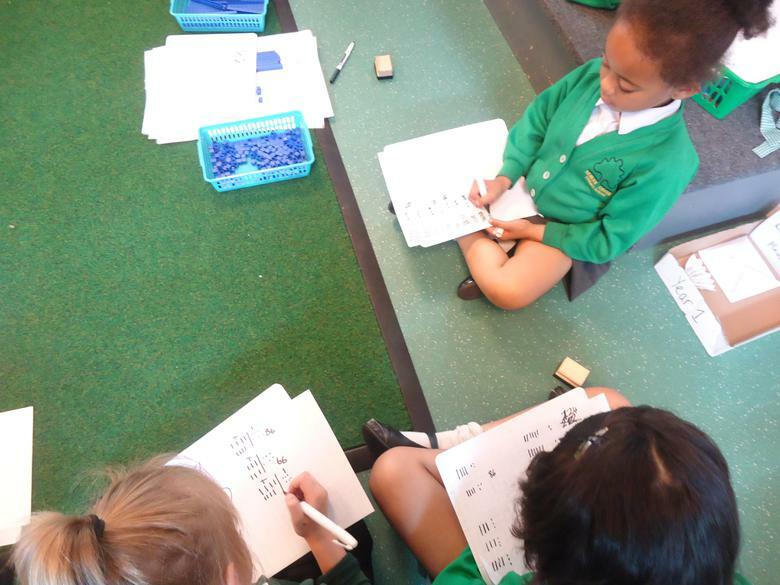 Year 1 have been doubling numbers using Tens and Ones by drawing jottings. 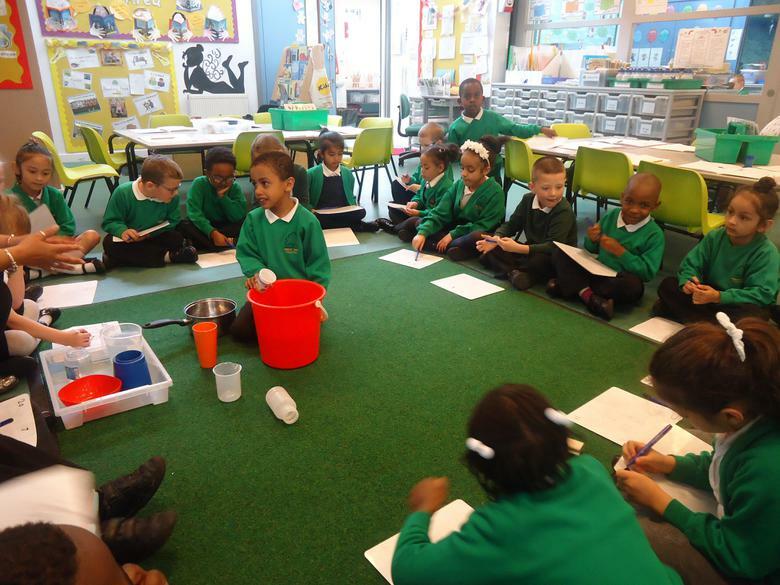 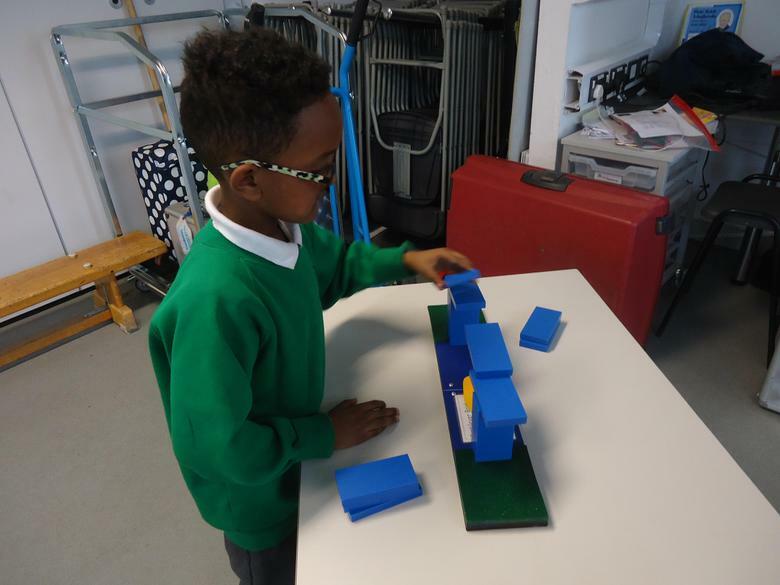 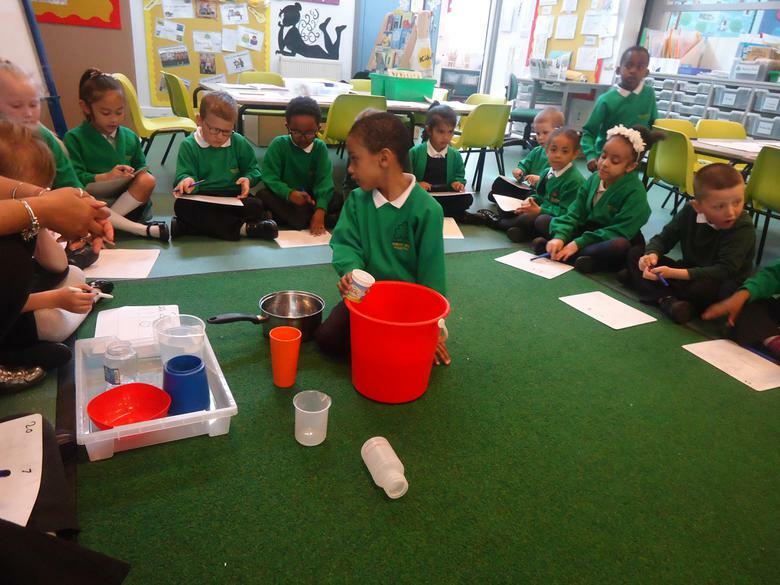 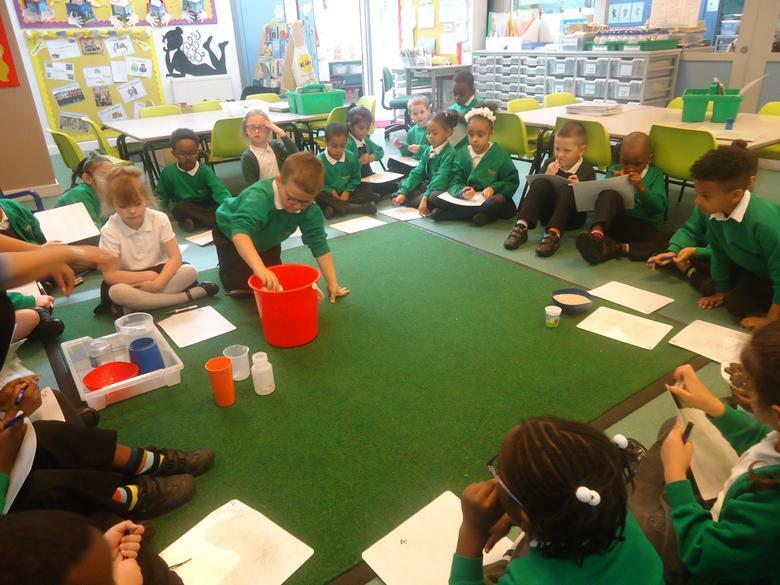 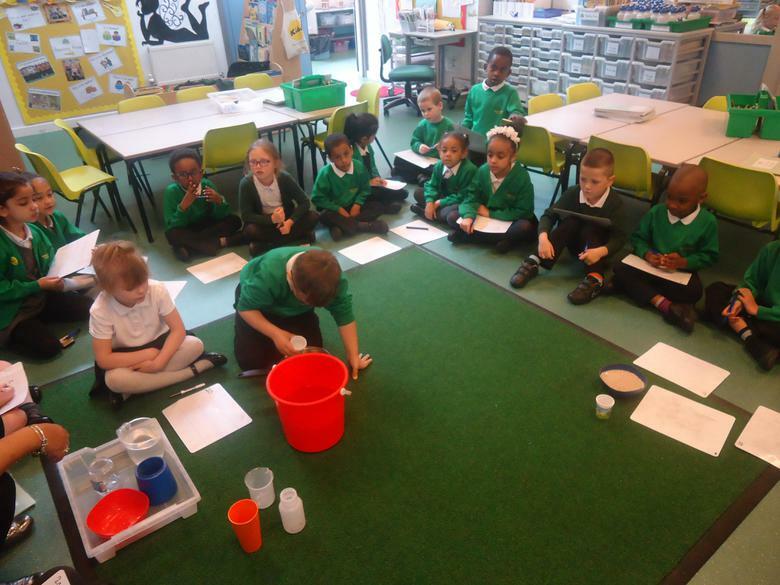 1S have been exploring capacity this week. 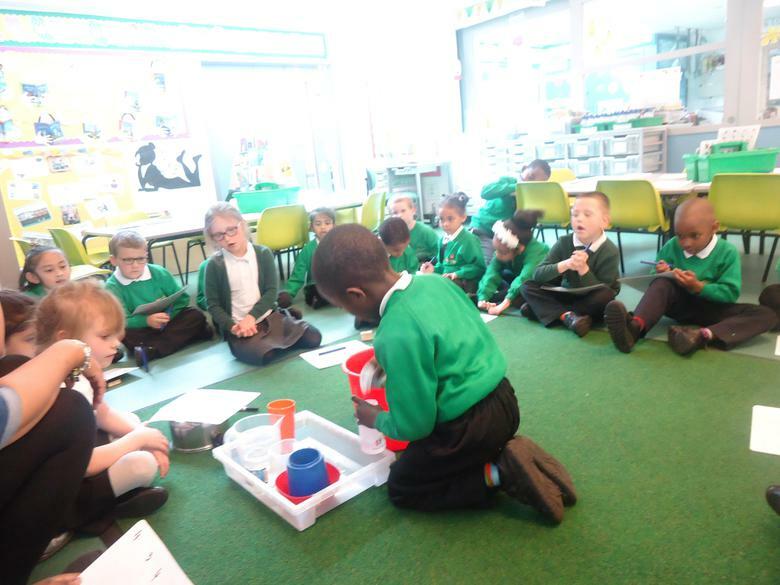 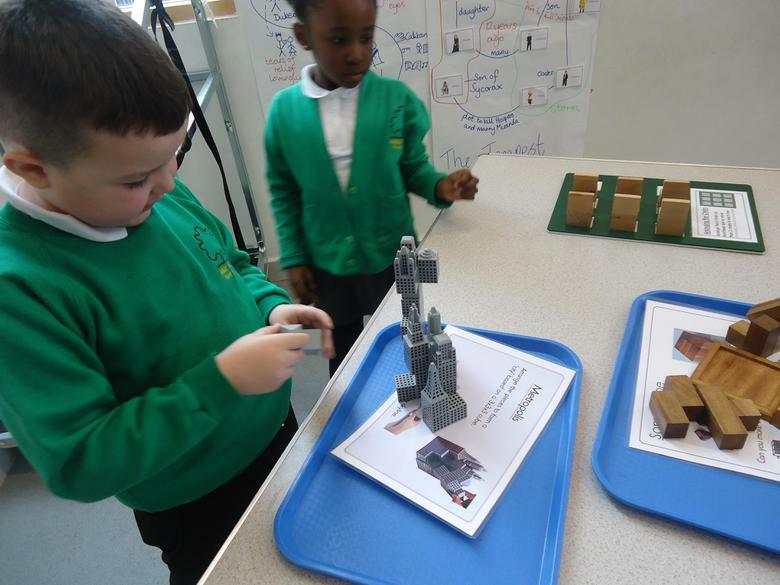 1S enjoying the challenges in 'Maths in a suitcase'. 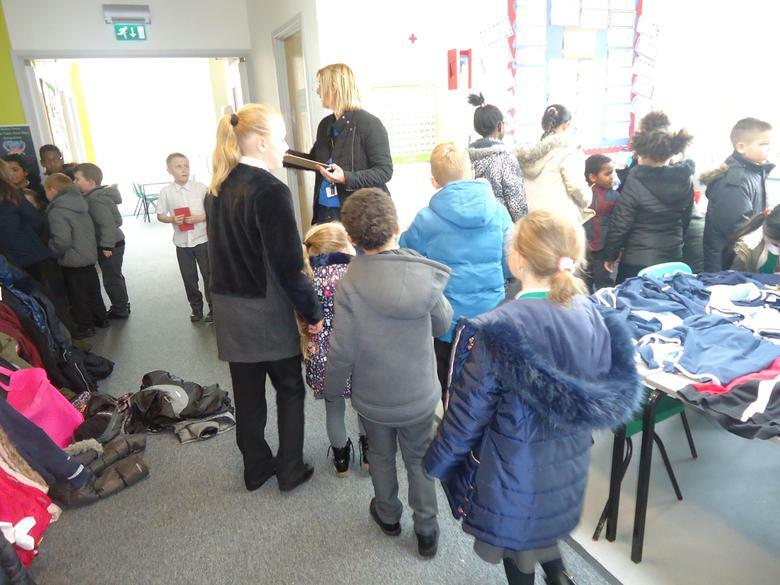 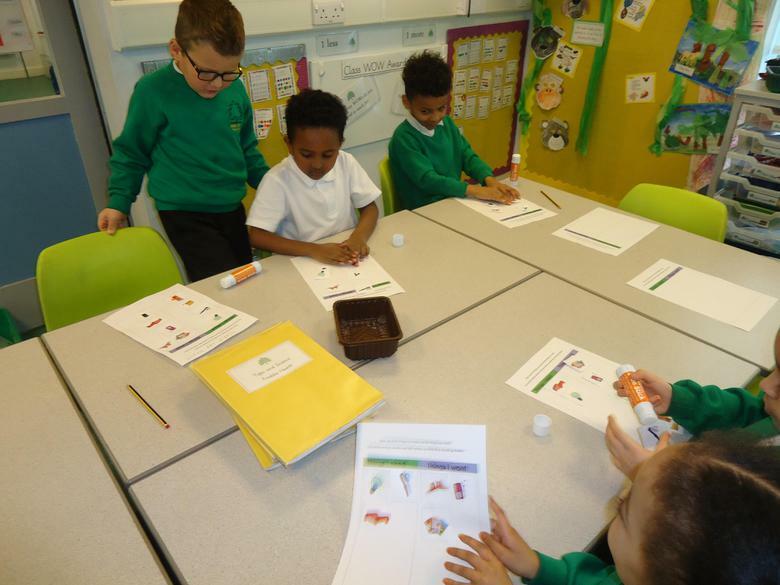 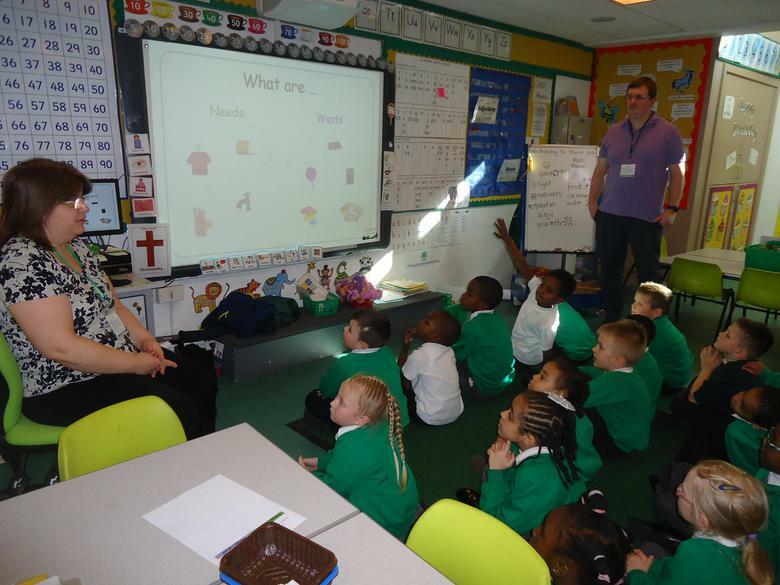 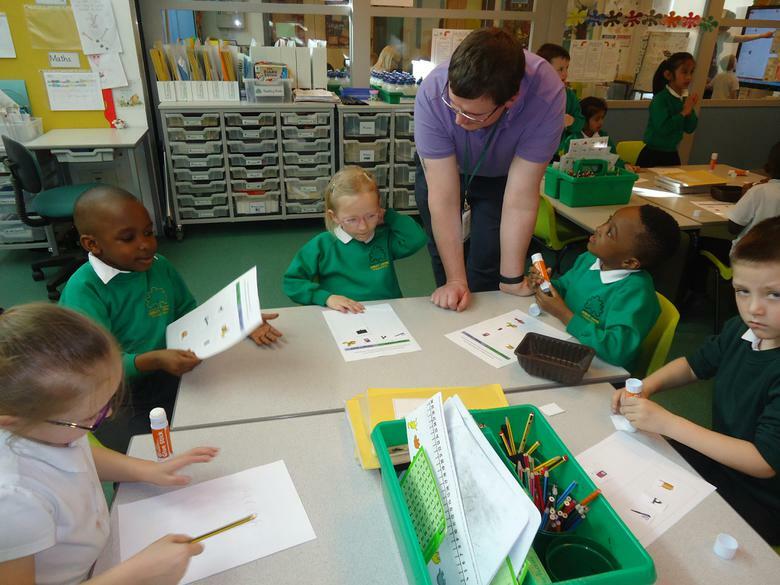 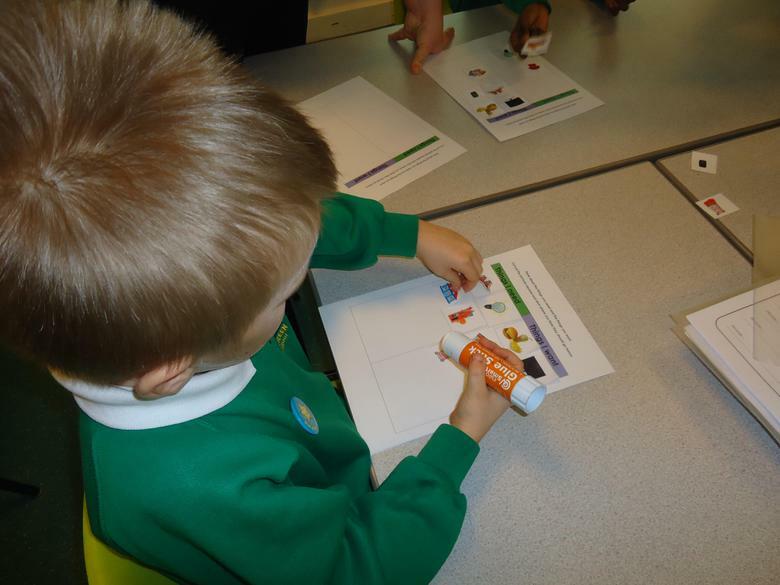 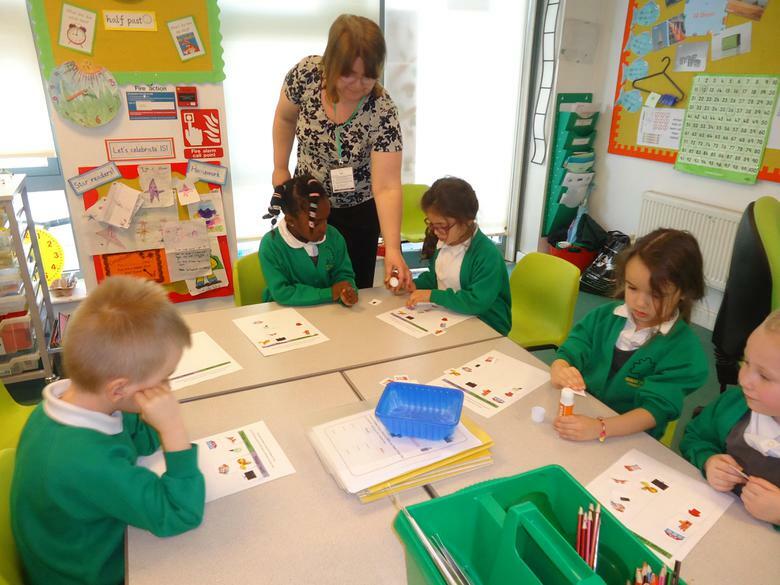 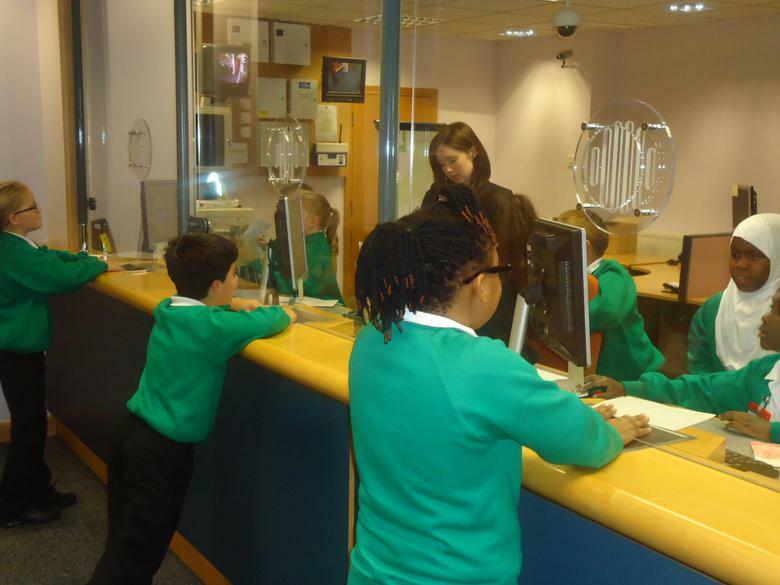 Year 1 had Coventry Building Society in school today. 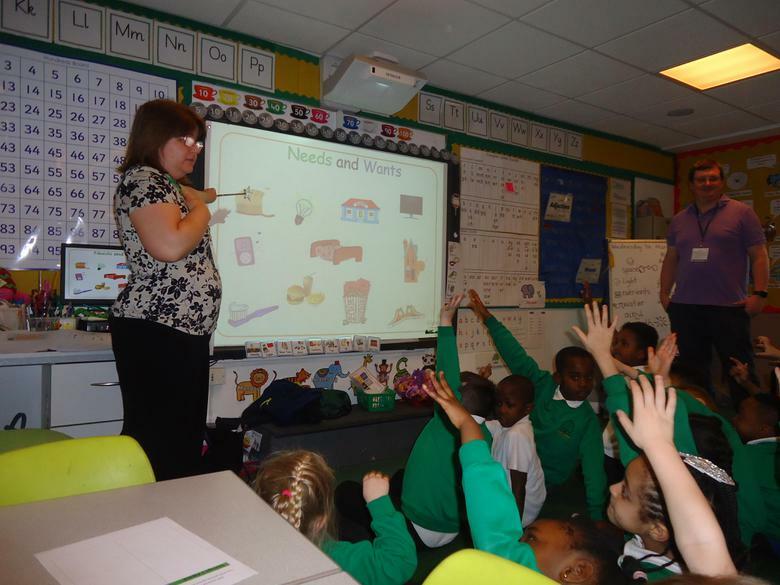 Matt and Rebecca talked to us about 'needs' and 'wants'. 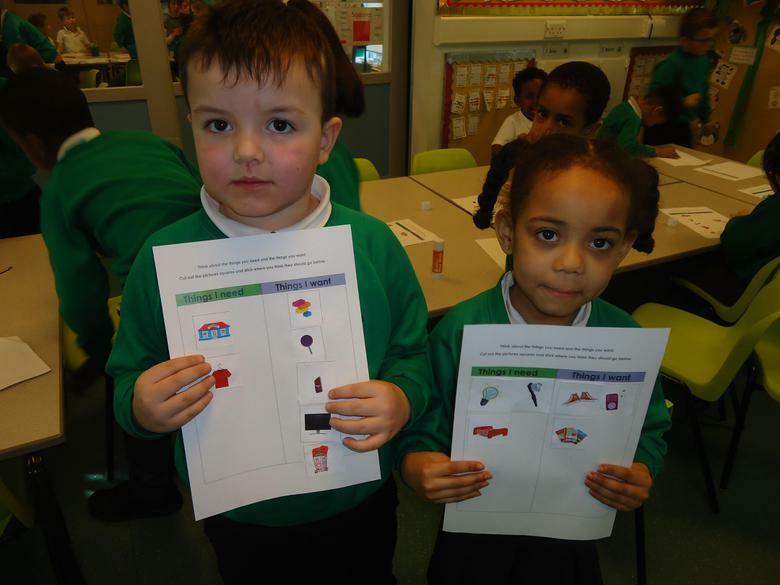 Look at what we learnt. 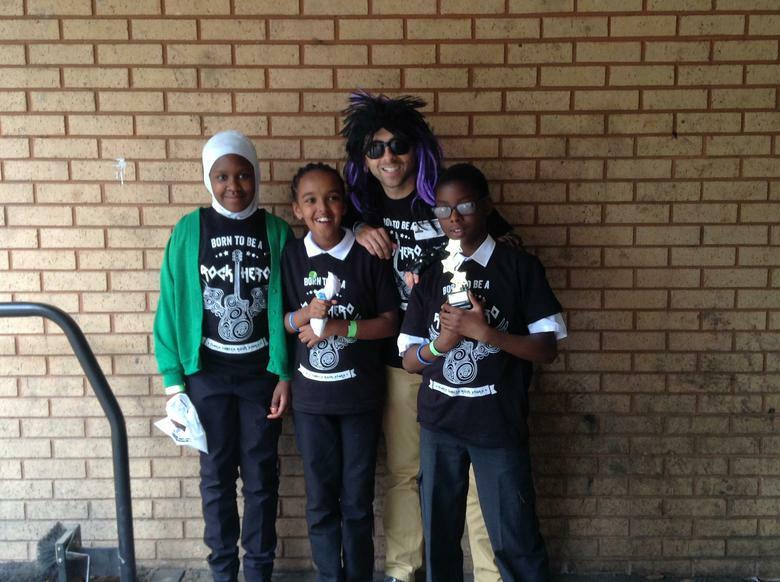 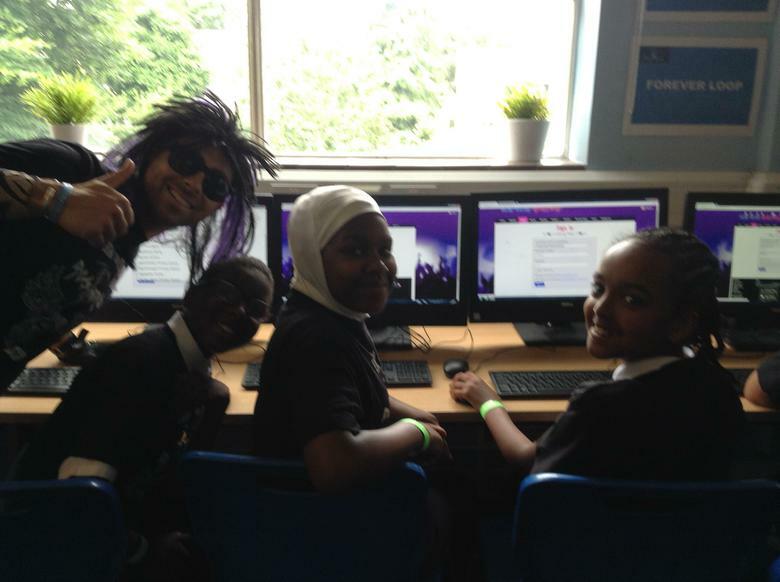 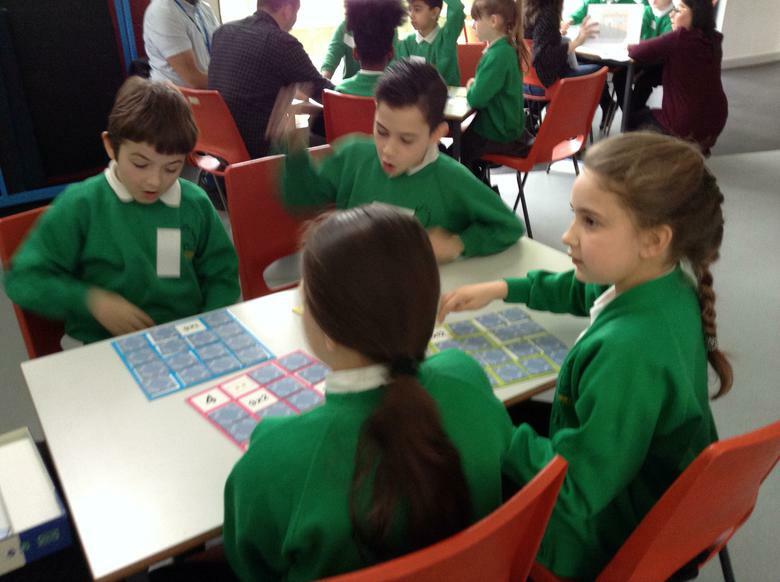 Times Tables Rock Stars Competitions! 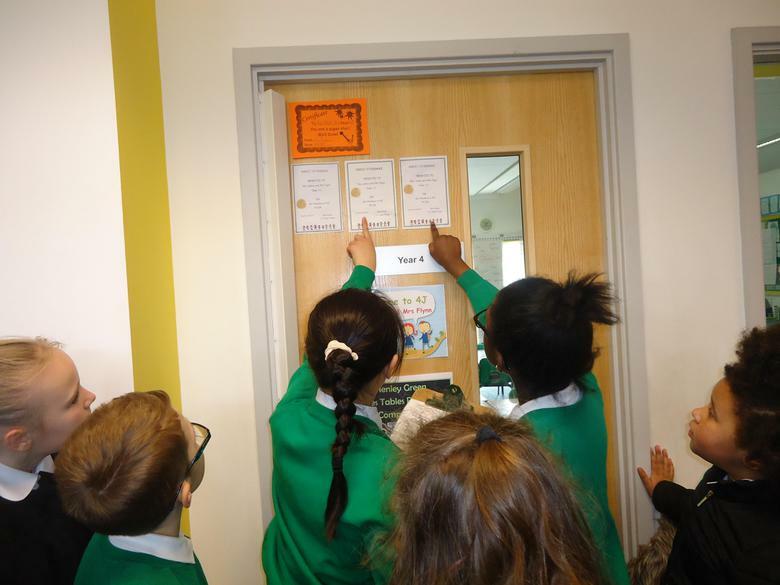 Towards the end of the Autumn term, after working hard on developing our times tables skills, we had two Times Tables Rock Stars competitions! 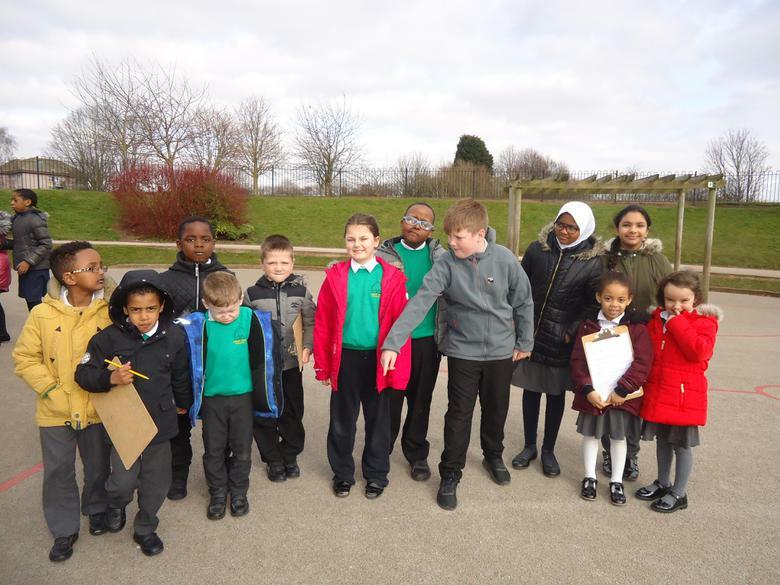 All children in Years 3 to 6 took part, leading to three children from each class going through to the Grand Finals at the end of the week. 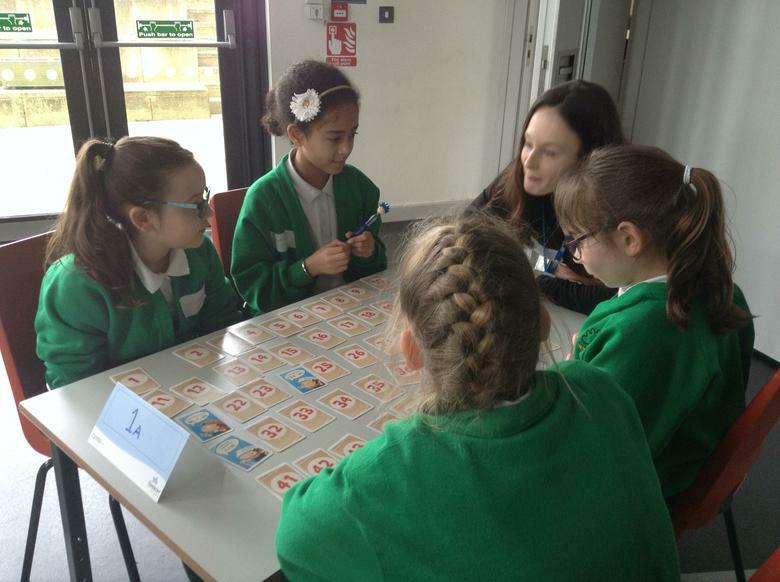 12 children from Years 3 and 4 competed first in their Grand Final. 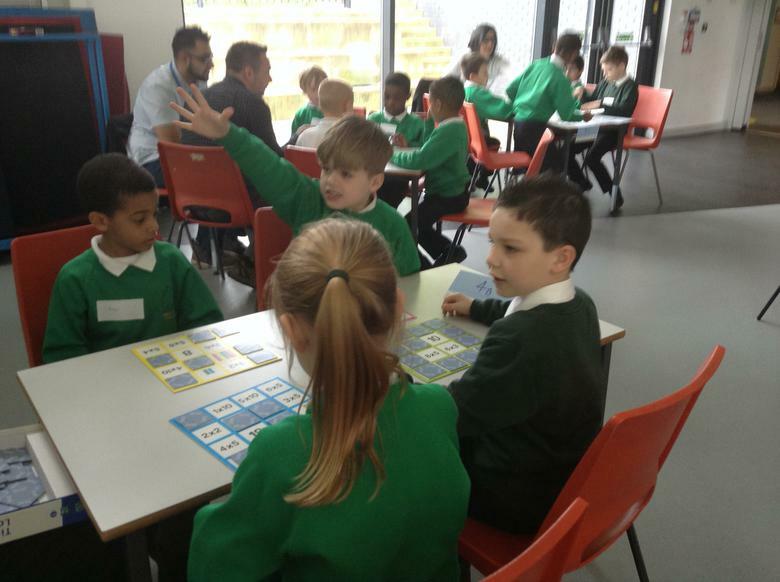 They were cheered along by their classmates and worked incredibly quickly on answering as many times tables questions as they could in one minute. 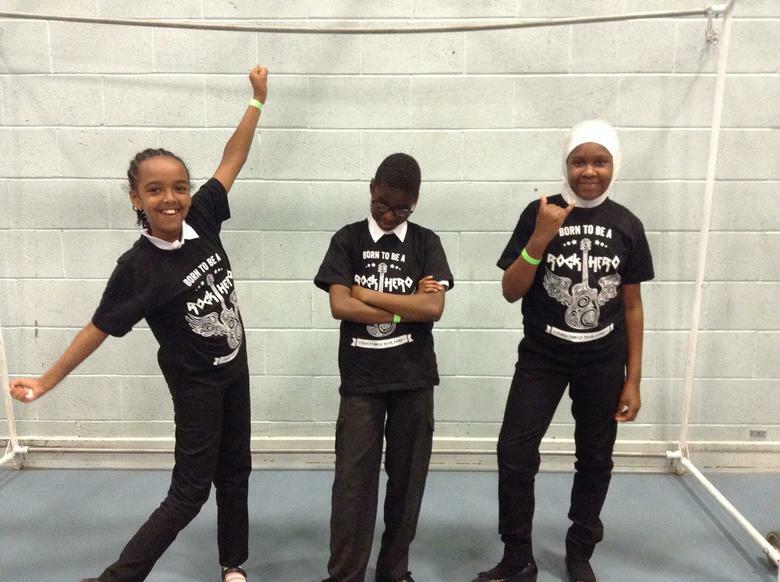 After three rounds, our three medallists were chosen - well done to all of them! 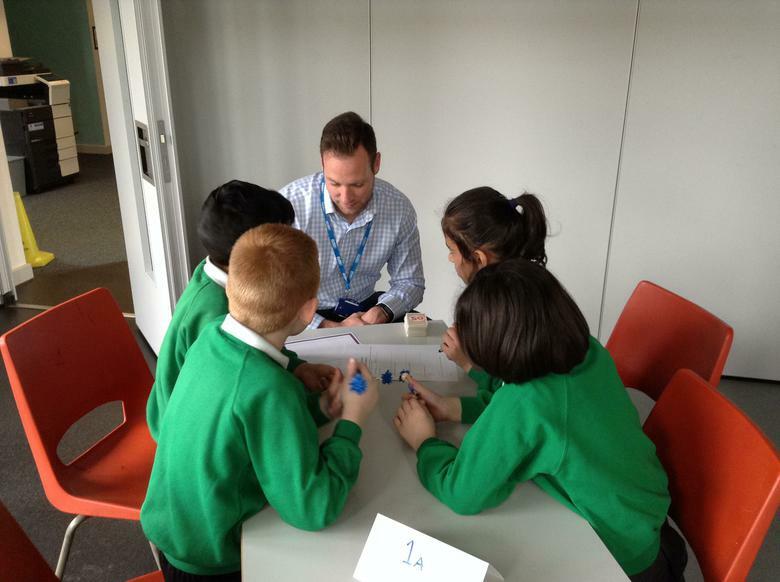 The winner answered an impressive 40 questions in the final round. 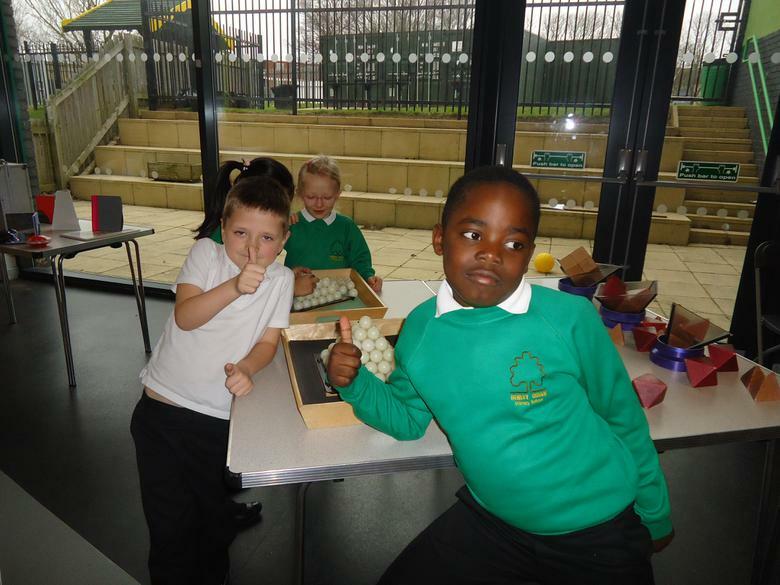 They won a bag of goodies and an extra playtime for their class! 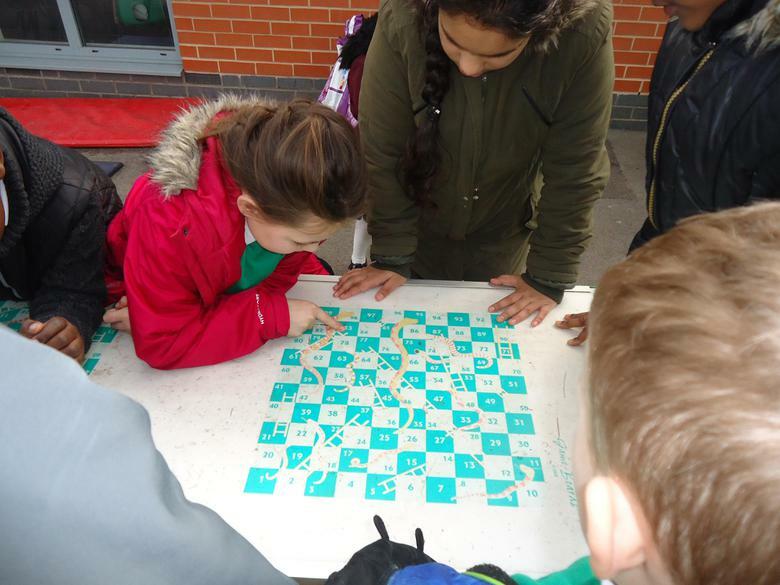 After this, the Grand Final for Years 5 and 6 took place. 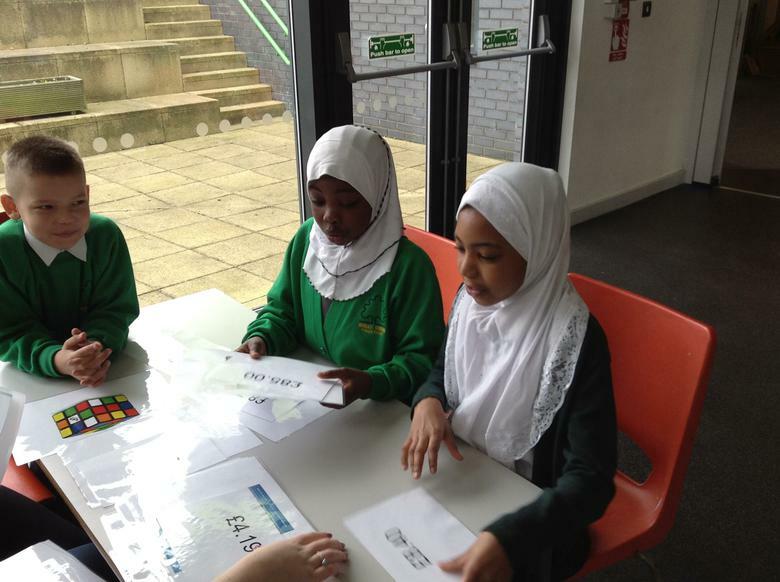 They too competed in three rounds to find our eventual winners. 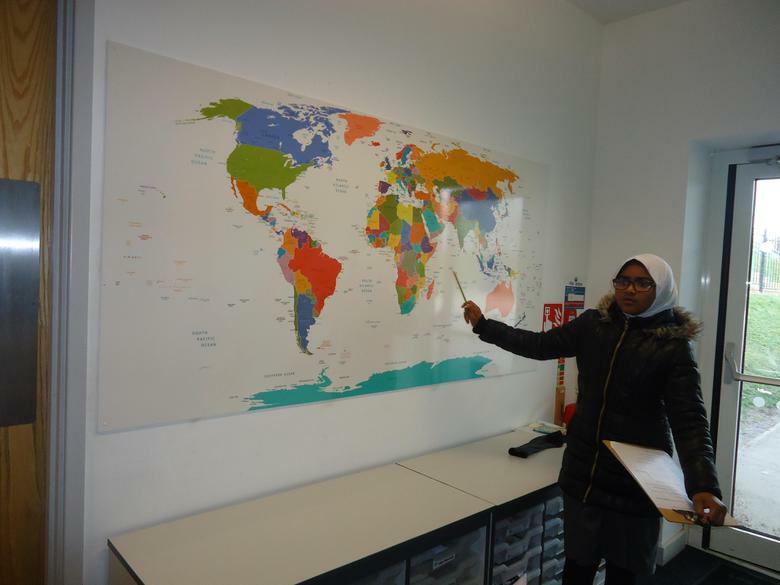 Well done to our winner in Year 6 who answered a stunning 70 questions in only a minute - more than one question per second! 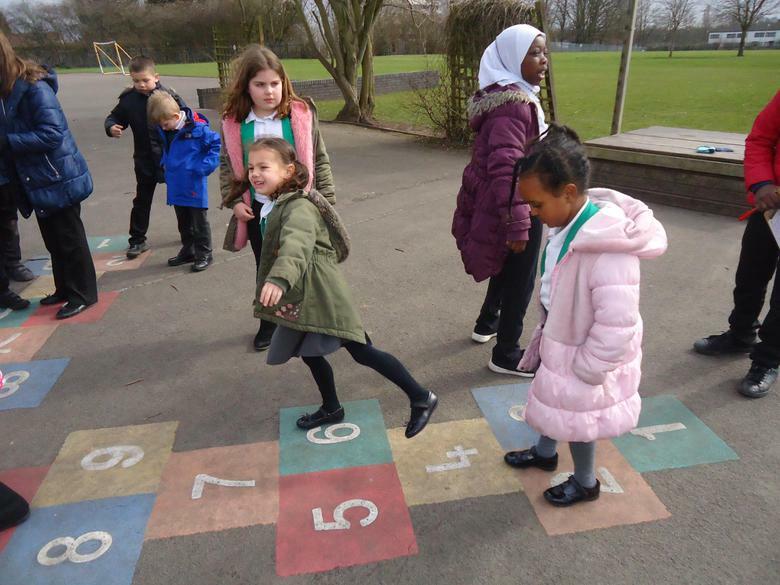 Warming up for the competition. 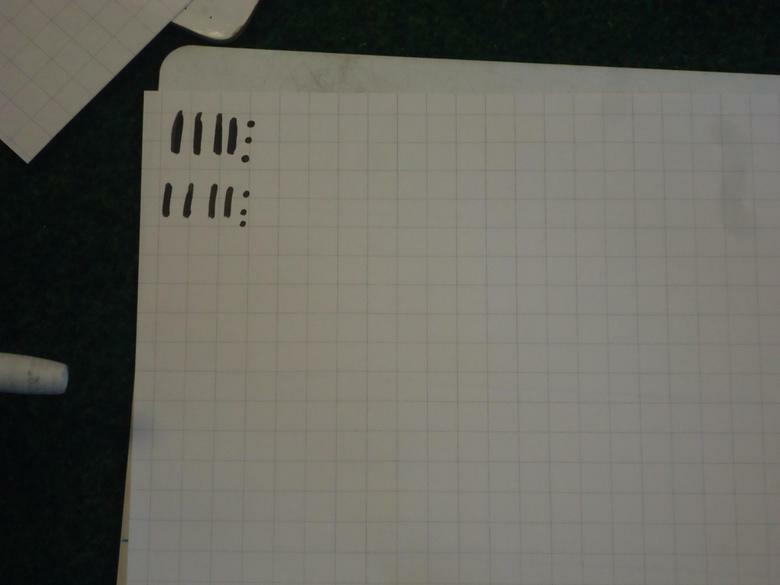 Trying to answer as many questions as possible! 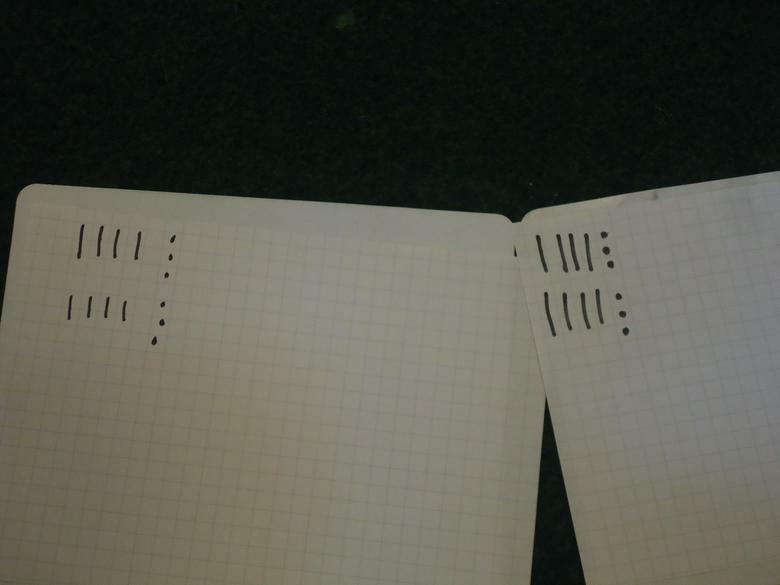 Reporting scores after each round. 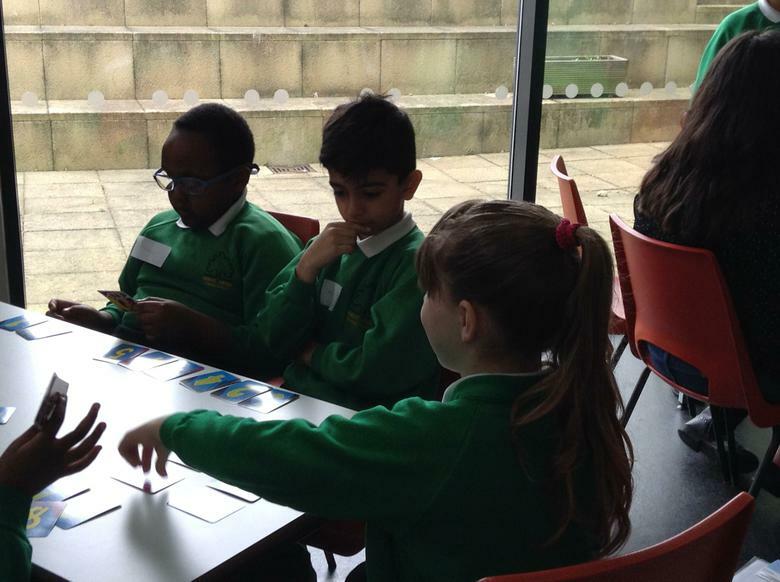 Year 3 and 4 Finalists. 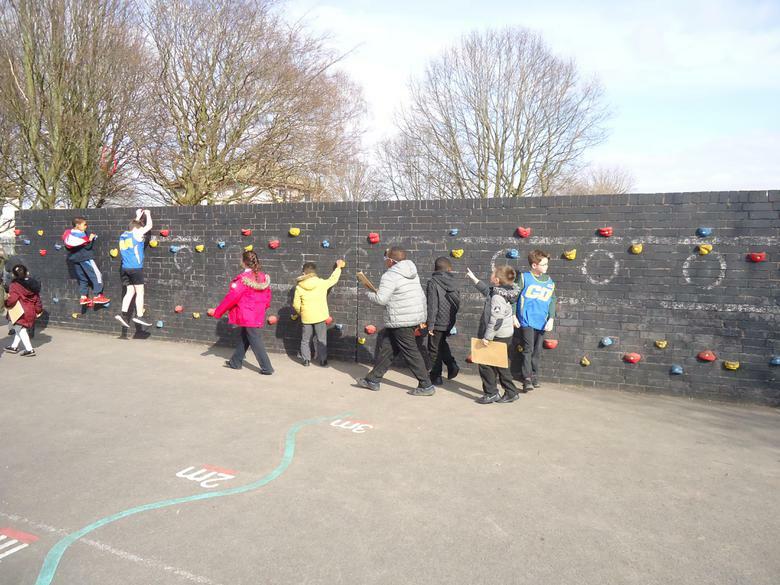 Warming up for the final. 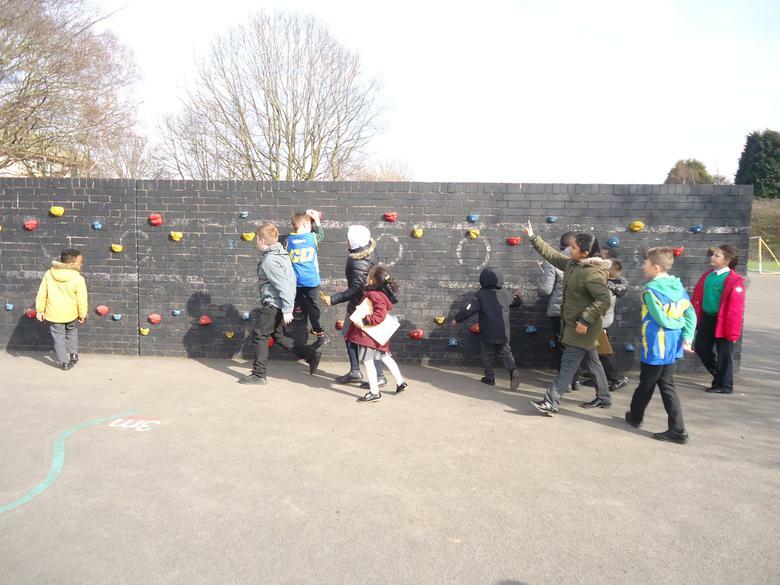 Trying to be the quickest! 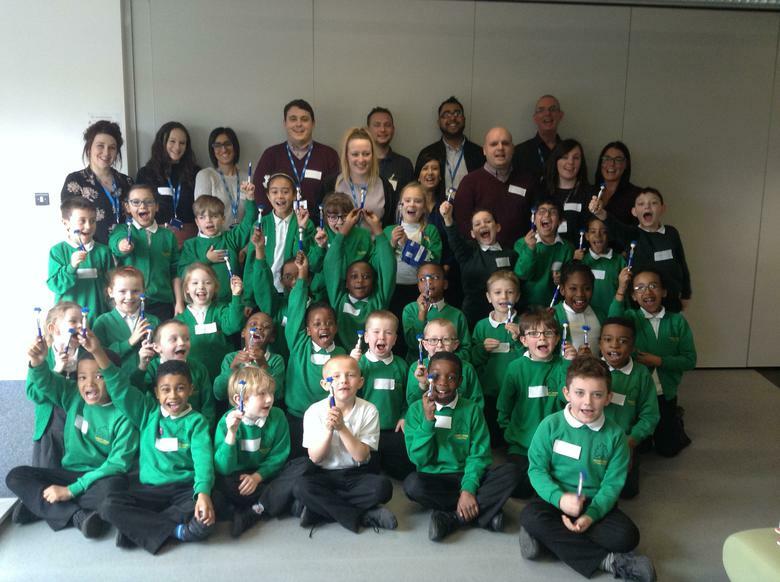 Our Year 3 and 4 medallists - well done! 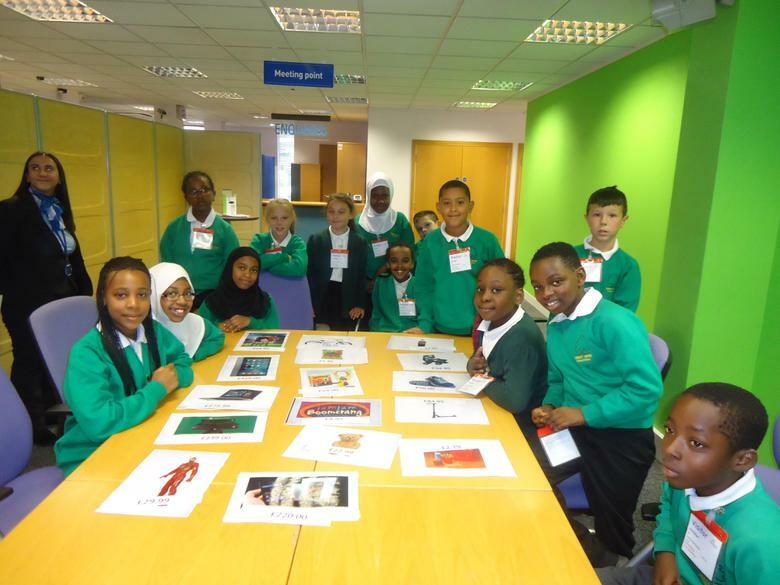 Our Year 5 and 6 Finalists. 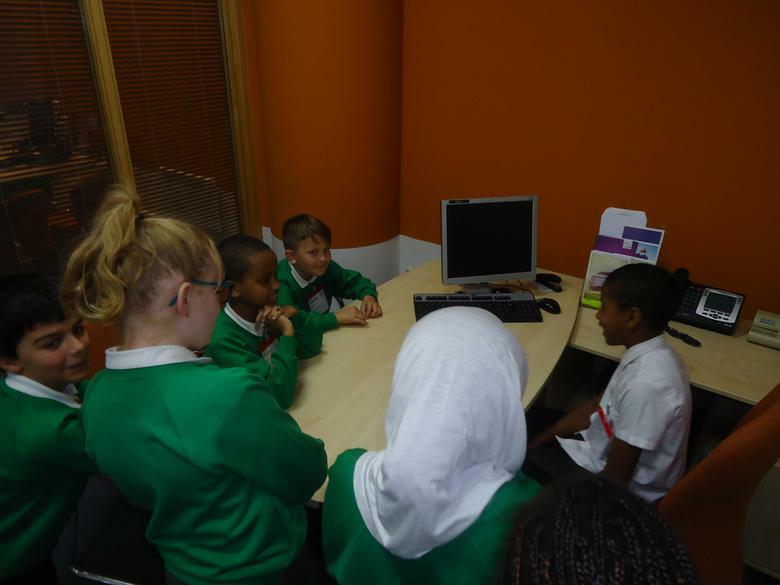 Who can answer the most questions in a minute? 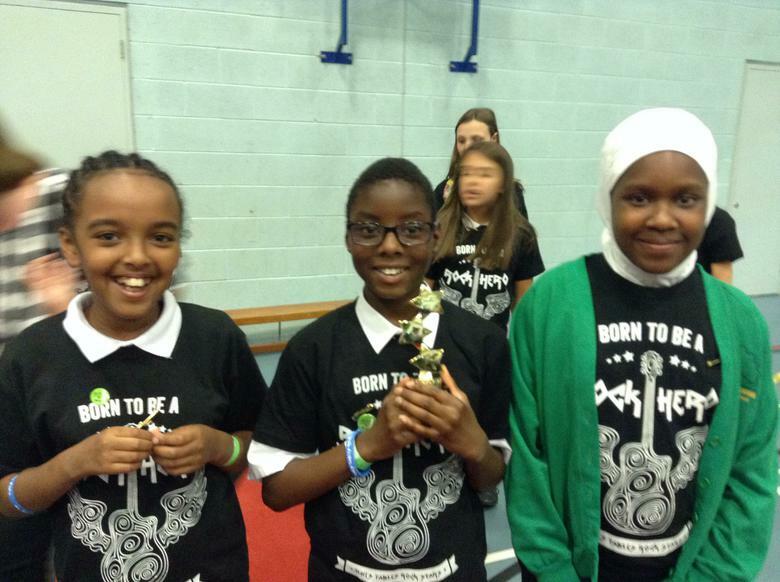 Well done to our Year 5 and 6 medallists! 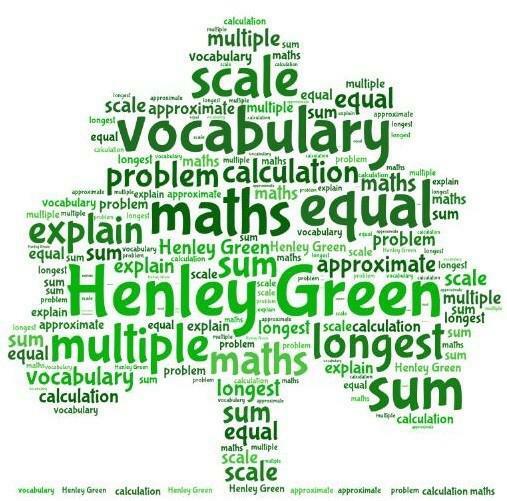 Three of our Year 6 pupils represented Henley Green in a regional times tables competition (more details in the post below) and they won! 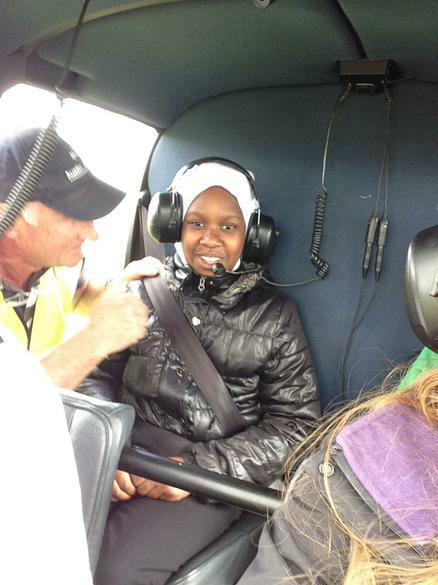 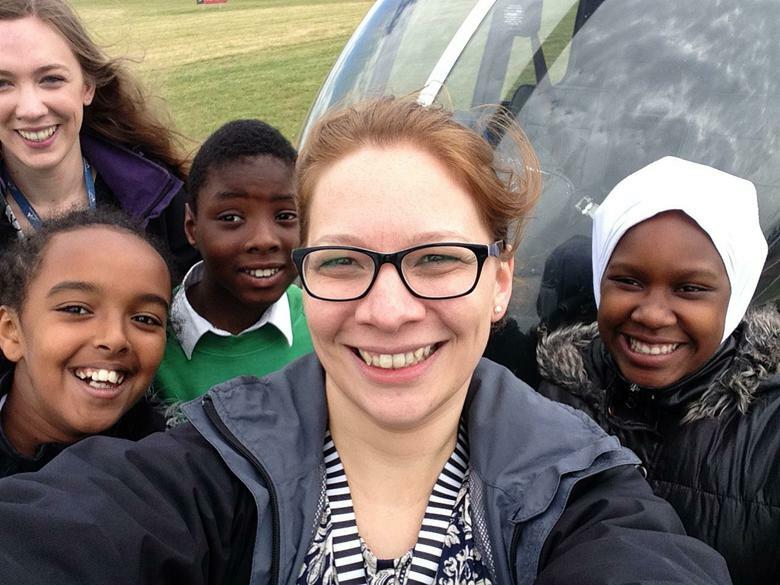 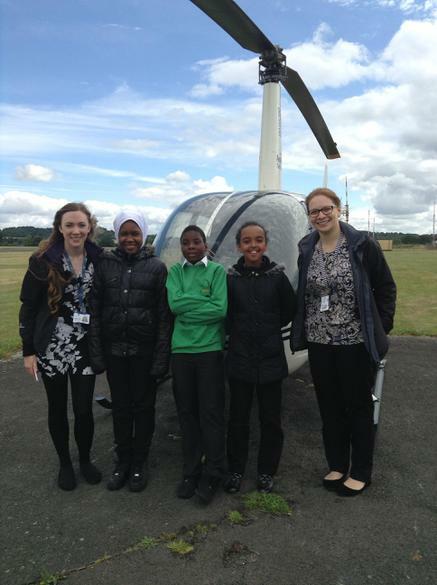 Their prize was a helicopter flight for the team and their teacher. 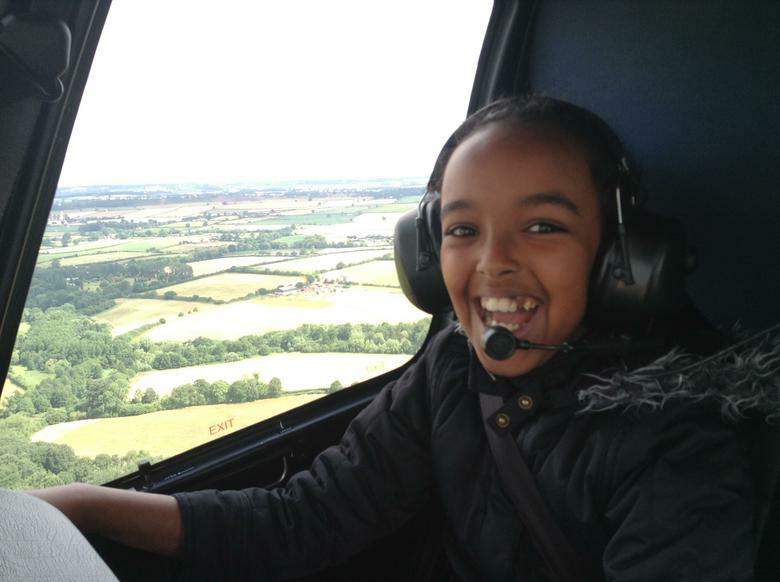 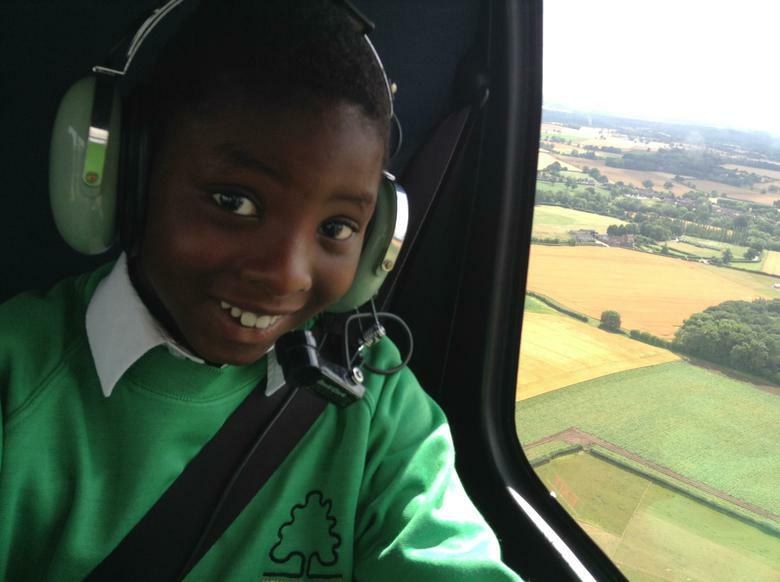 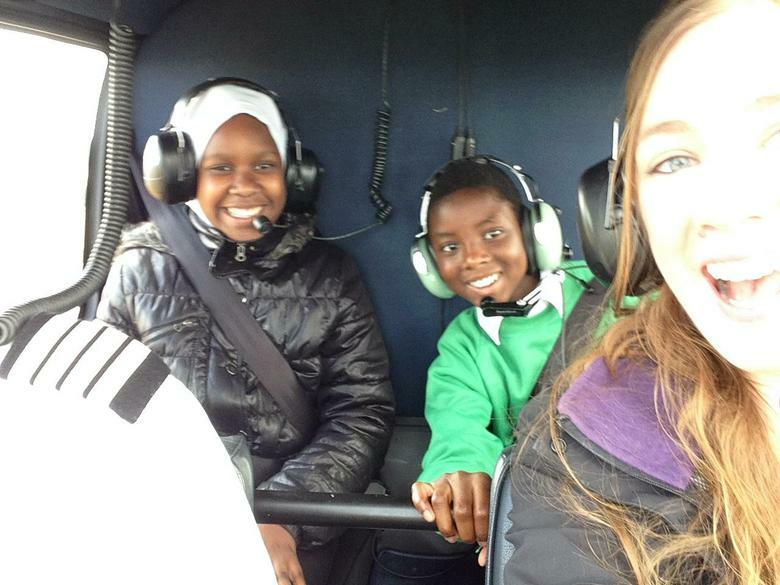 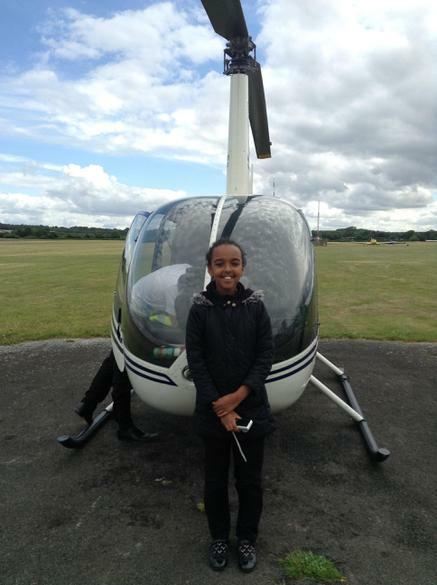 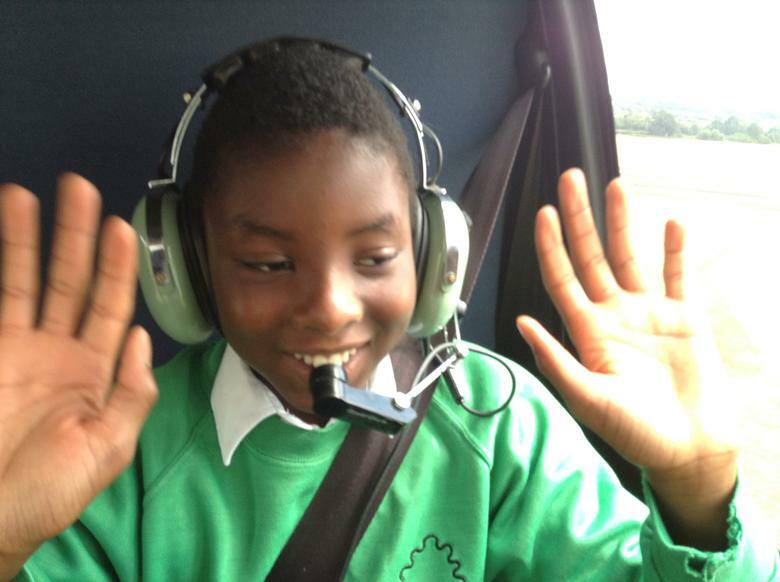 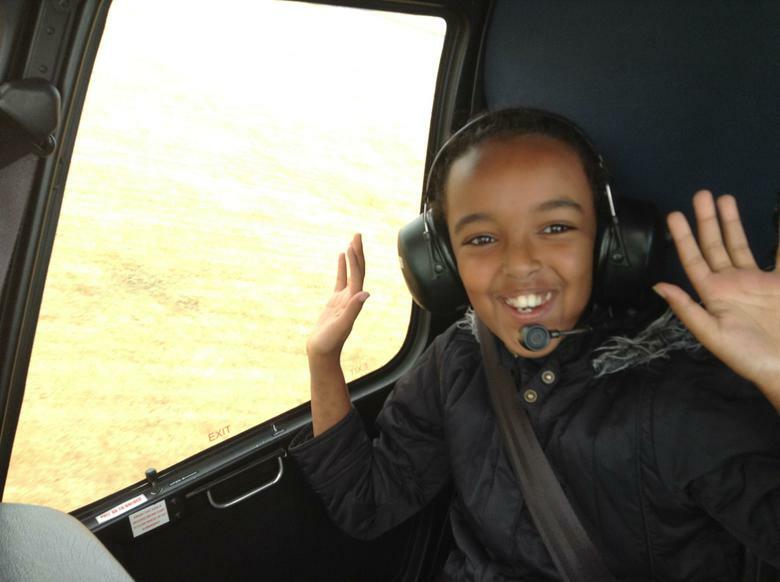 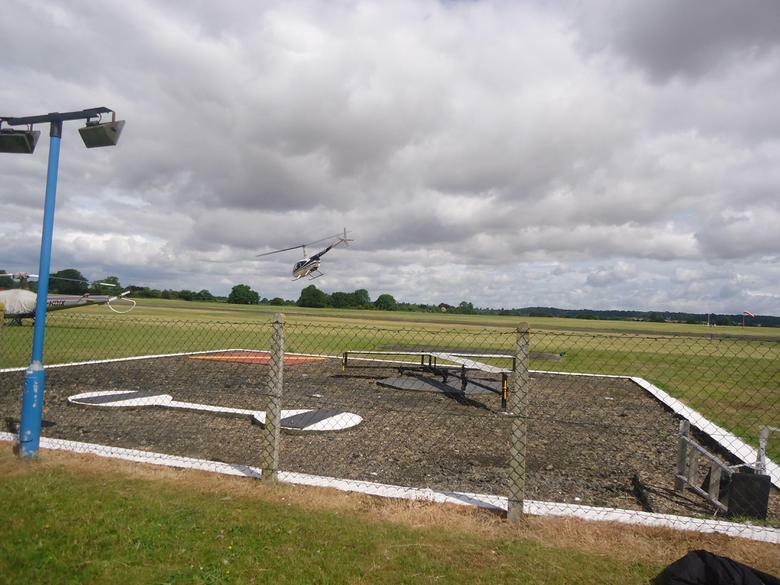 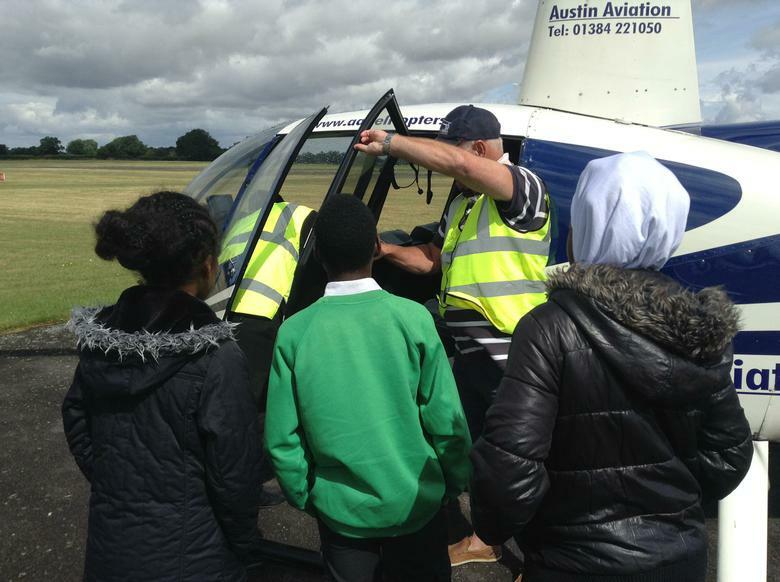 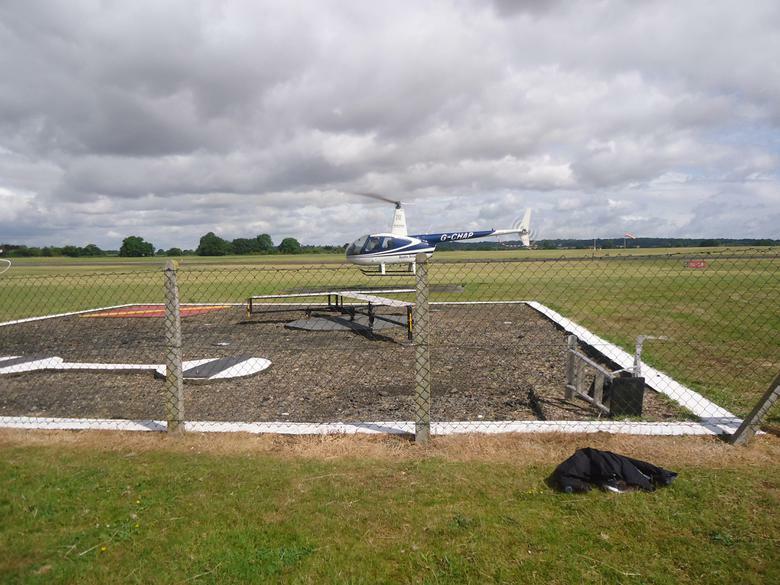 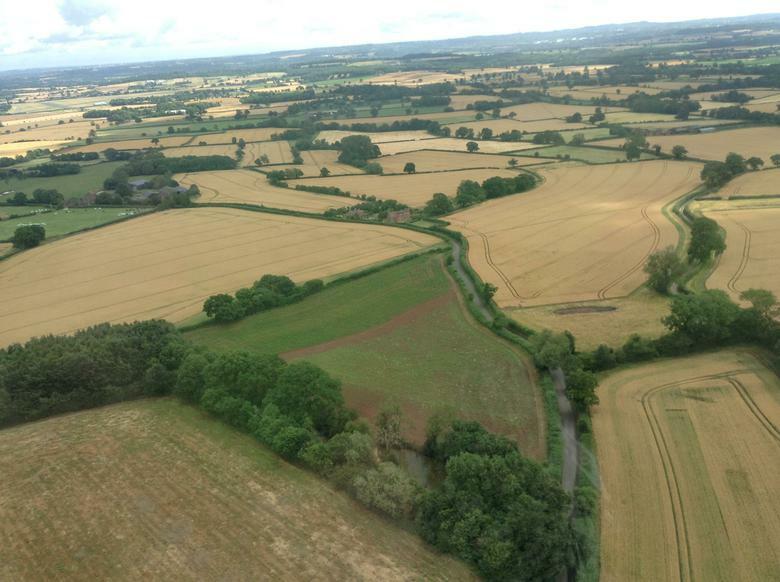 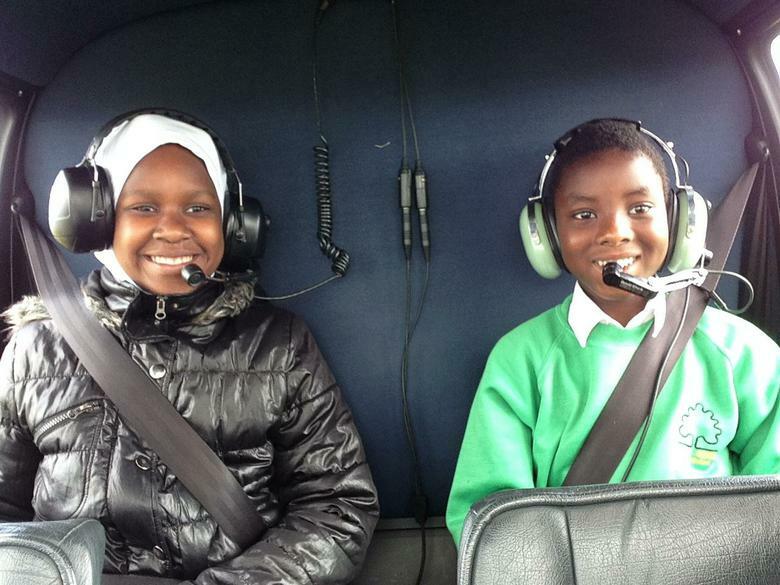 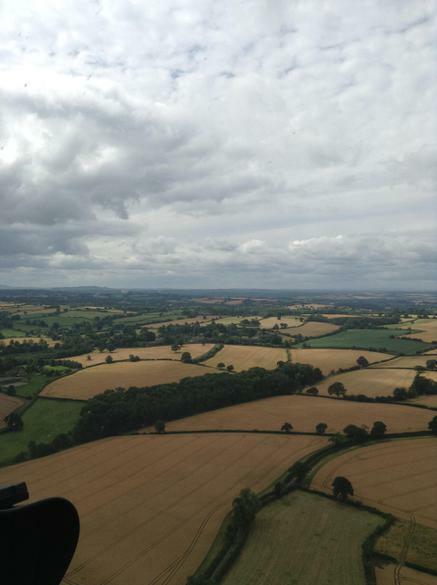 We went to Wolverhampton Airport and flew around the local area in two twenty minute flights. 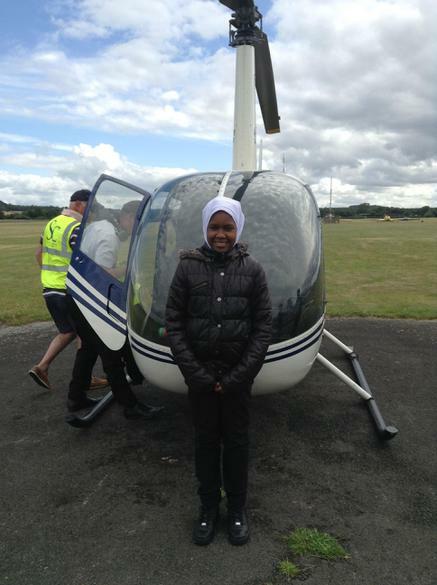 We flew at heights of 500 feet and speeds of around 100 mph! 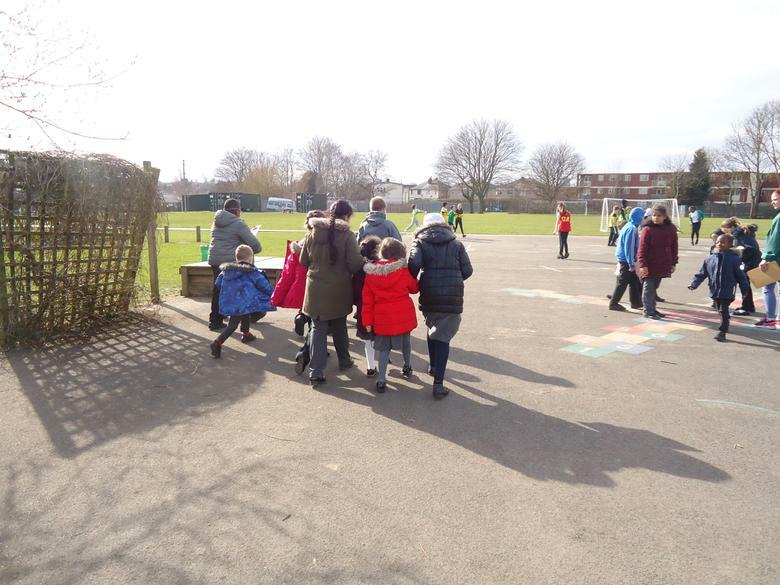 What a fantastic way to end their time at Henley Green! 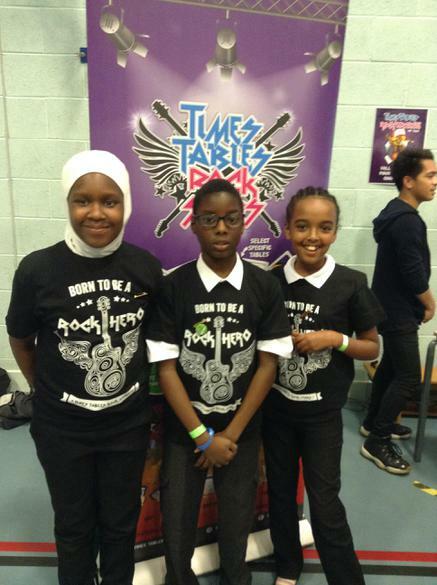 Three of our Year 6 pupils represented Henley Green in a Times Tables Rock Stars Wrangle at St Edmund Campion School in Birmingham. 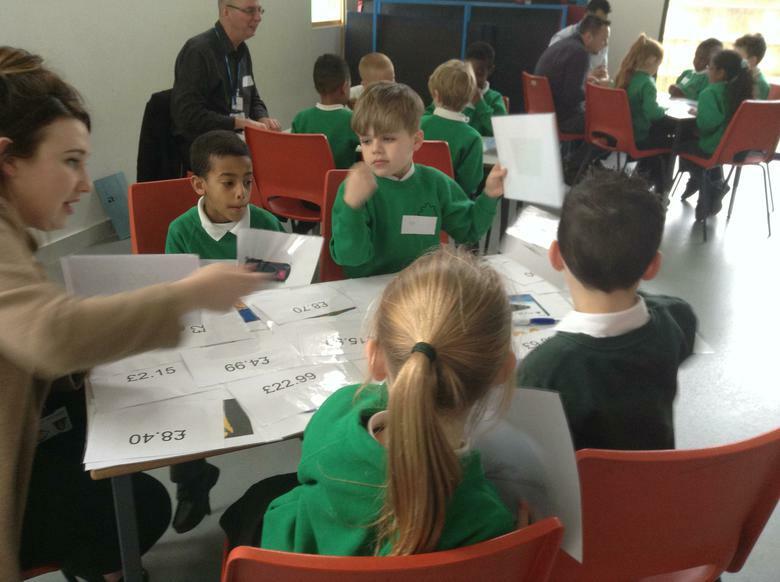 They competed in a qualifying heat, answering as many questions as possible on multiplication facts from their twos to their twelves on the computers. 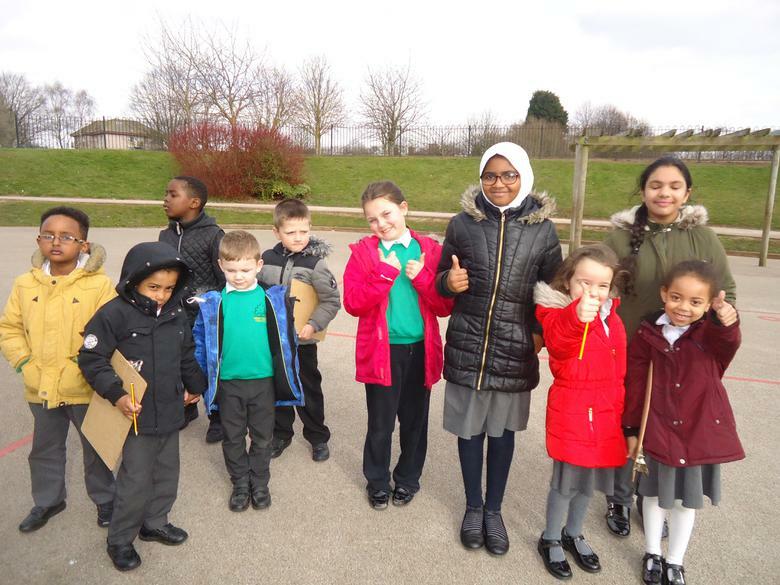 They all did fantastically leading to Henley Green having the second highest average score as a school out of over twenty schools and nearly one hundred pupils! 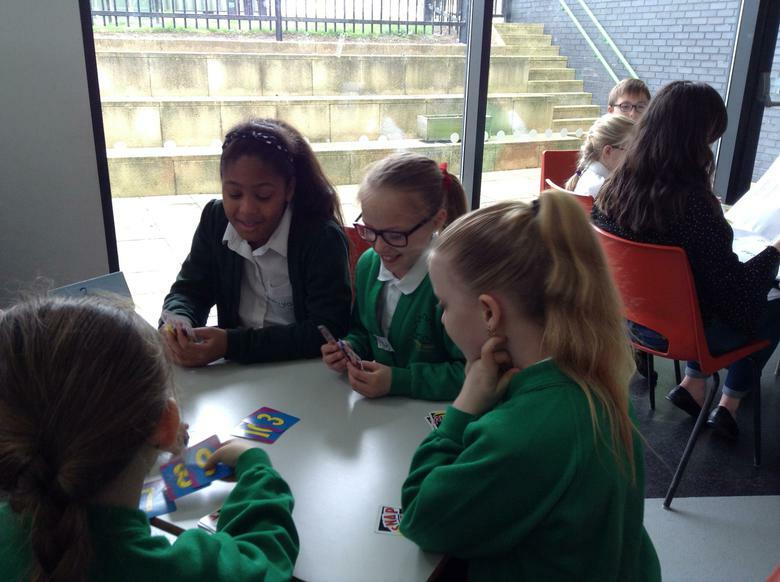 Two of them made it to both the quarter finals and then the semi finals, making it to the final eight. 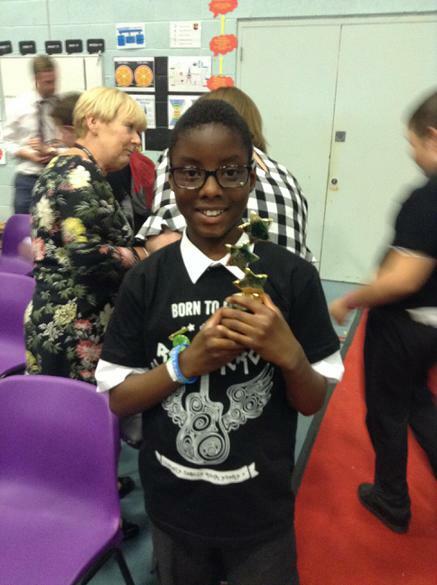 One of our pupils then made it to the final four - a tense competition in the hall in front of an audience. 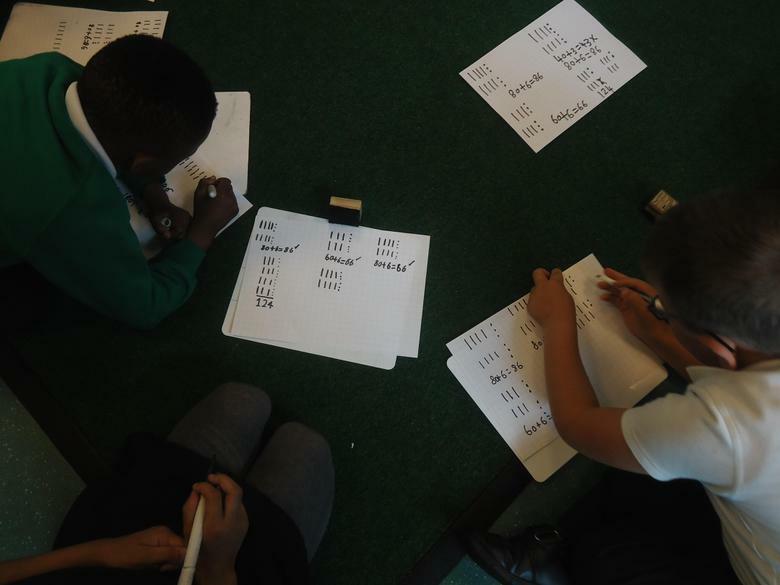 They had to concentrate for three minutes answering a mixture of times tables questions up to 12 x 12. 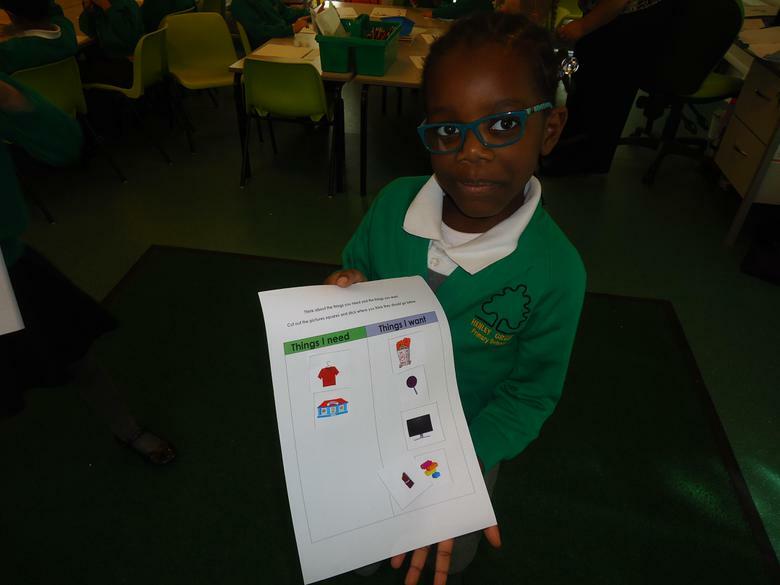 It was a tensely fought battle but... Henley Green won! 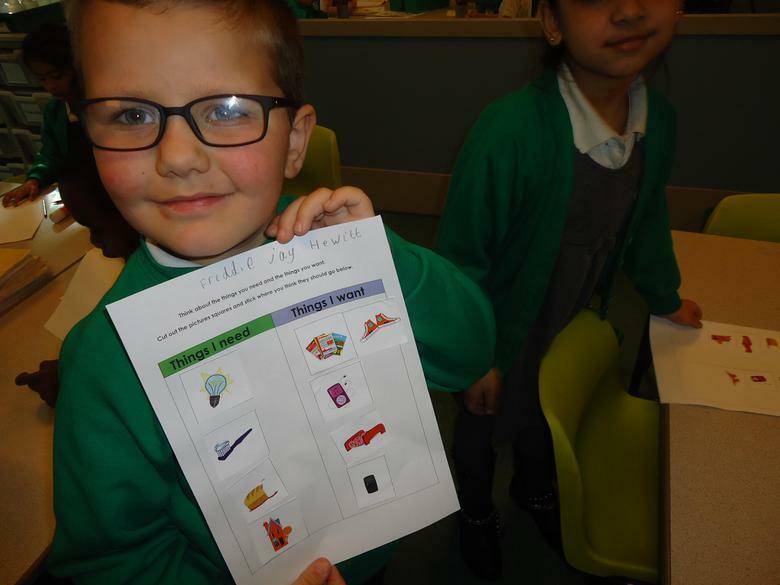 He managed to answer a superb 340 questions in three minutes! 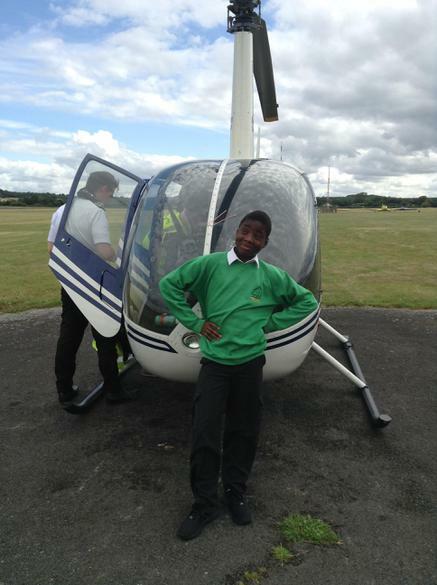 He is now a Supreme Ultimate Rock Hero for Eternity on Times Tables Rock Stars and was not only awarded the trophy but won a helicopter flight for the Year 6 team and their teacher! 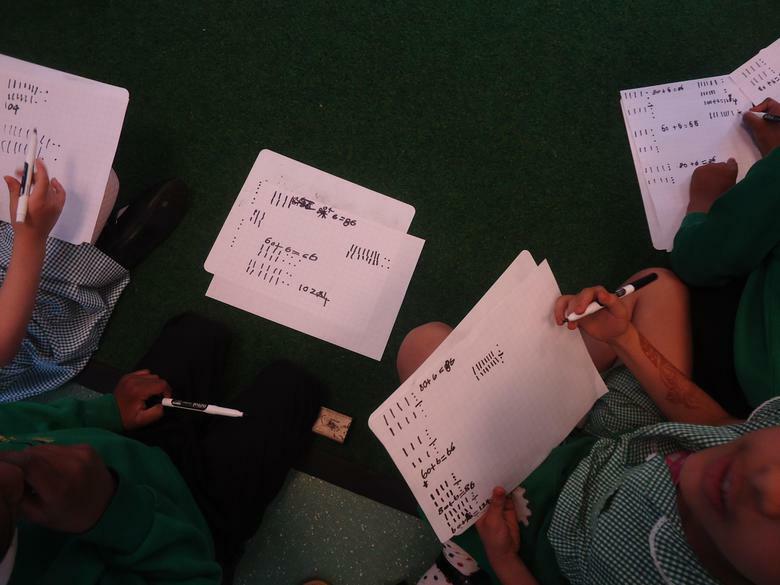 Each Autumn term, parents of children in Years 1 to 6 are invited to join us for a morning for our Number Development Workshops. 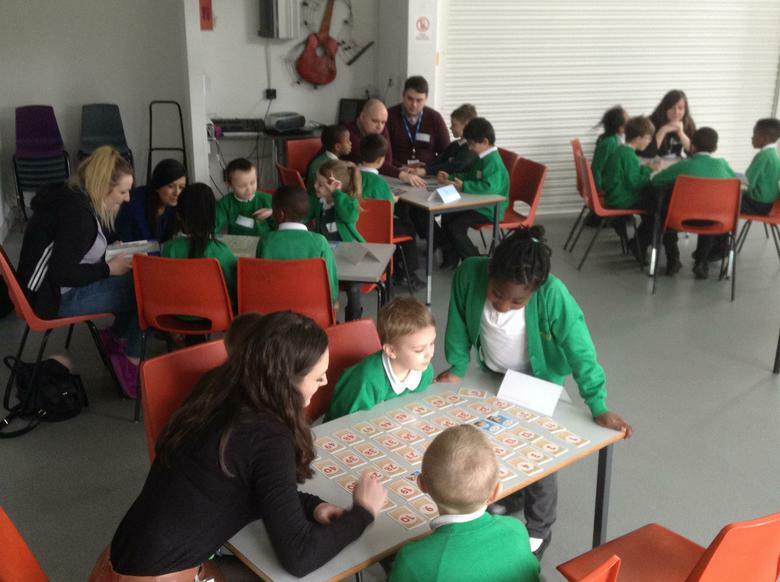 Parents get the chance to see the calculation methods and resources that their child uses at their stage of learning. 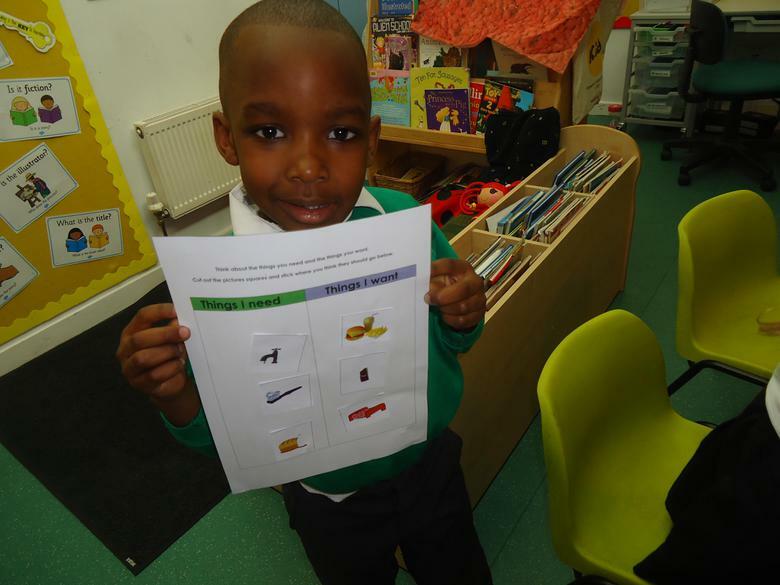 We also share ideas for how parents can support their child at home. 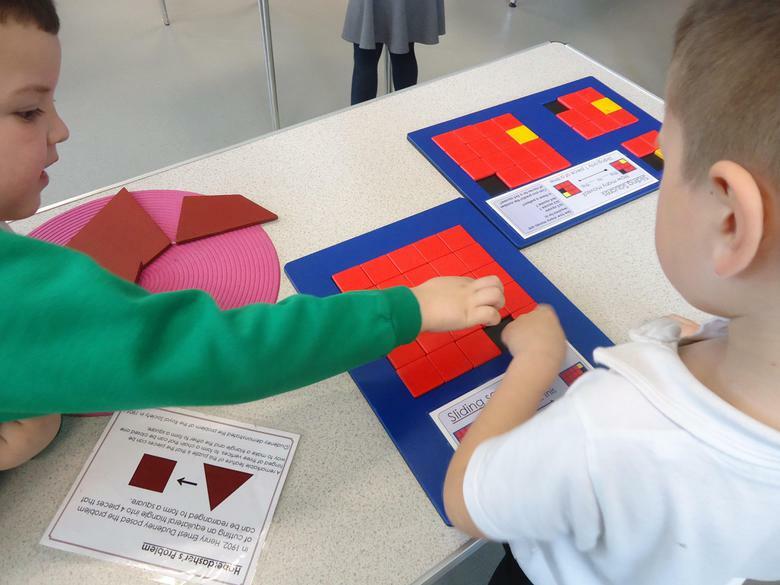 Parents then have a chance to work alongside their child in the classroom - seeing these ideas, methods and resources in action! 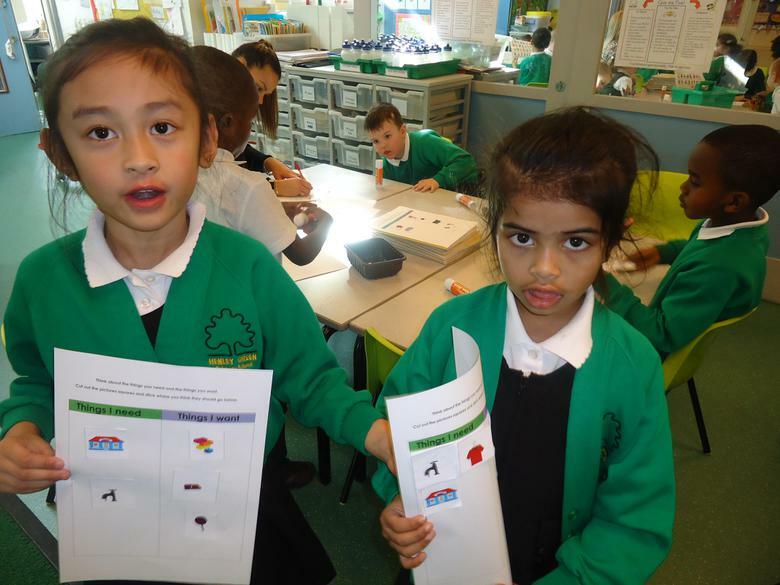 Click the link below to see the handouts for each year group of key information and methods used. 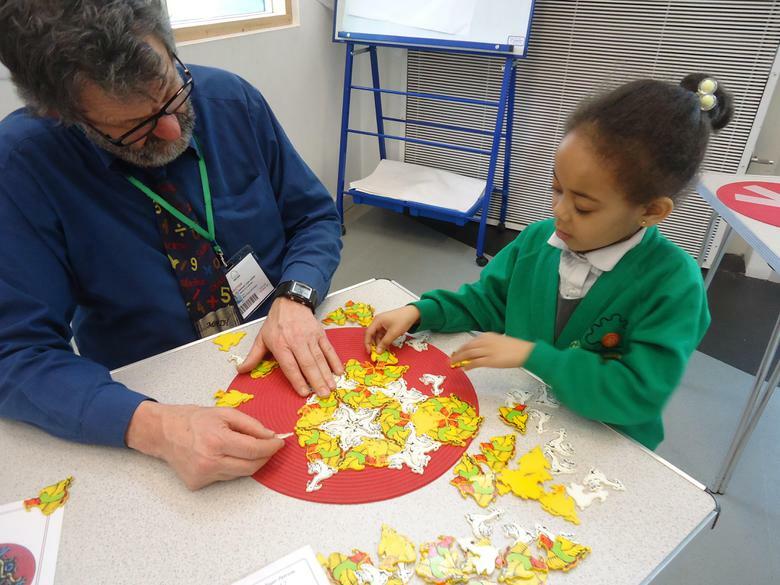 On Friday 17th March, lots of kind volunteers from Coventry Building Society came to Henley Green for a Fun with Numbers Maths Party! 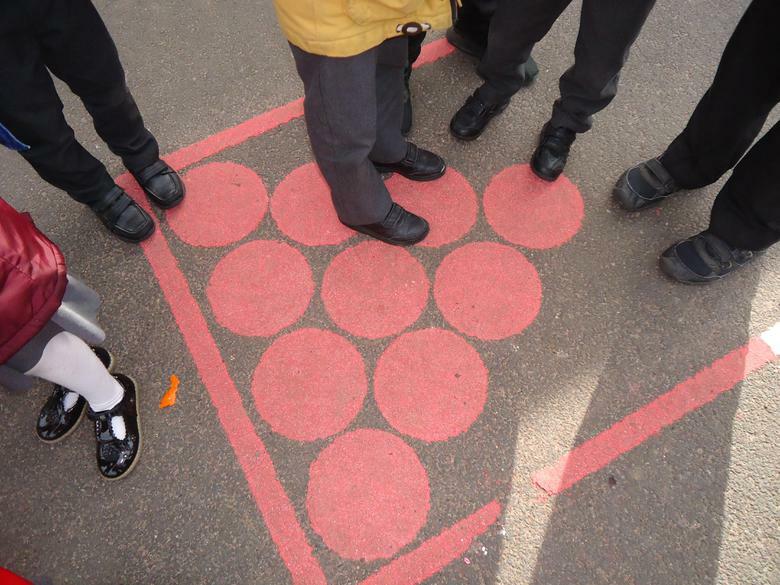 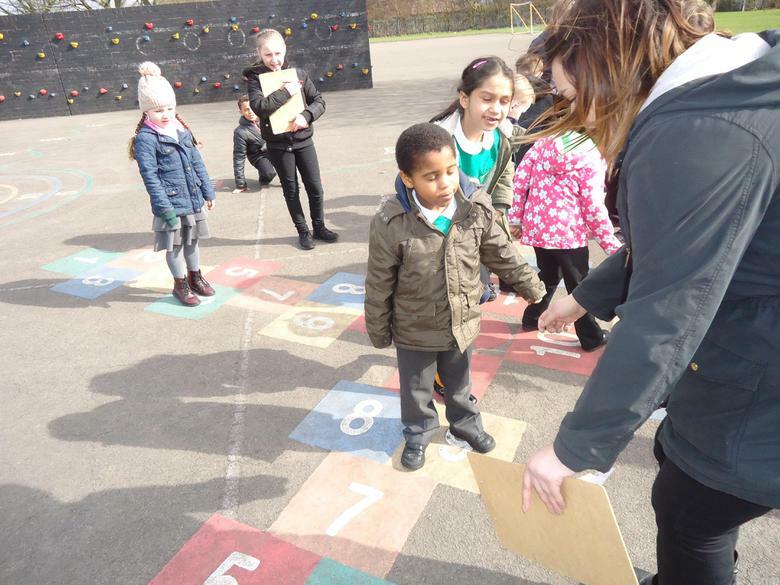 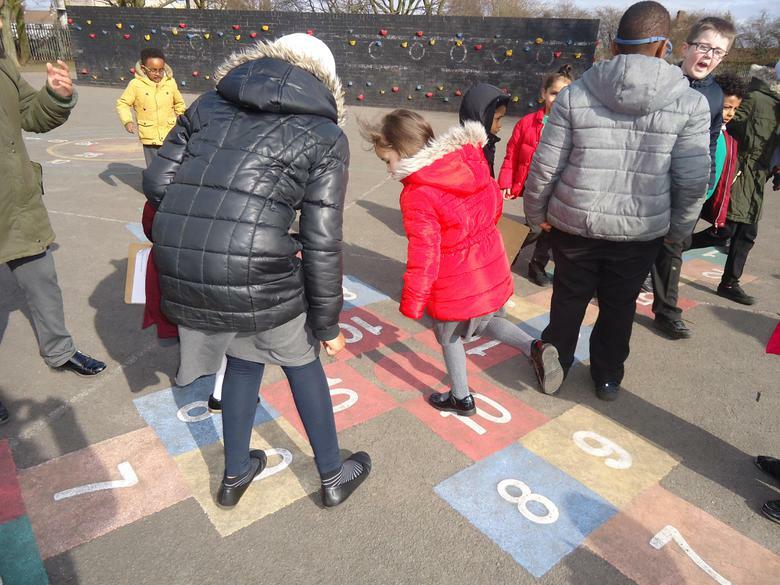 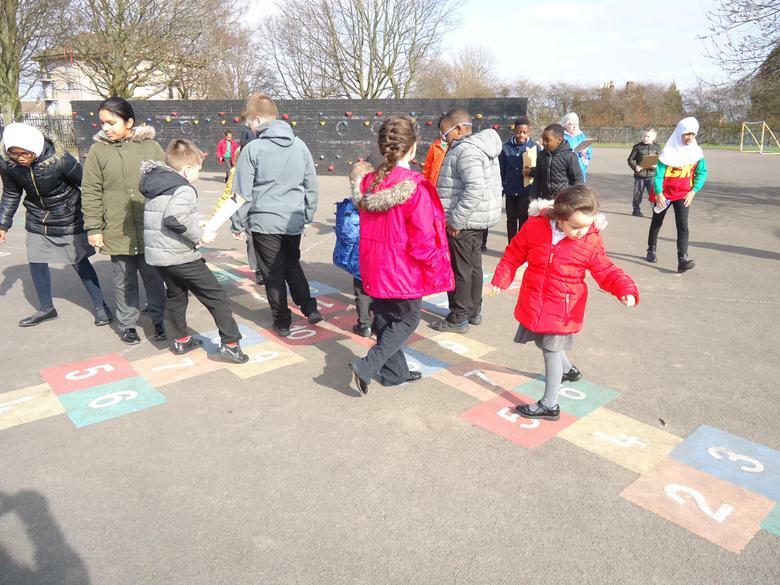 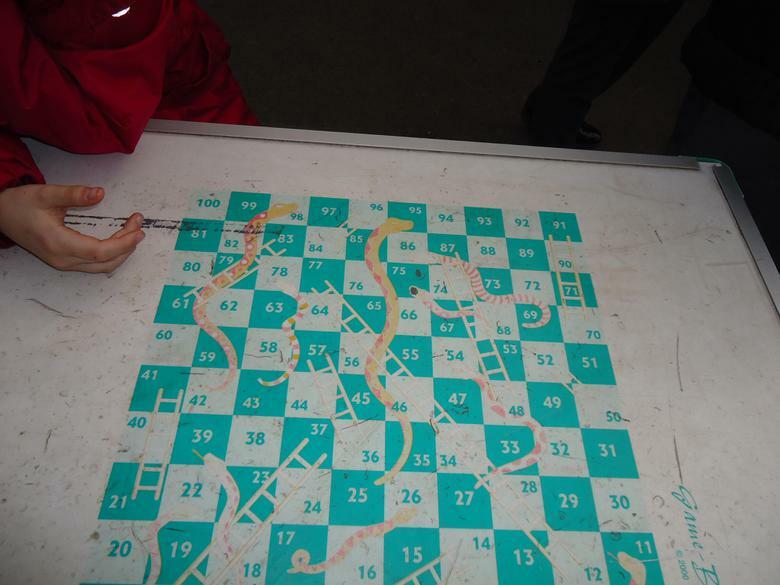 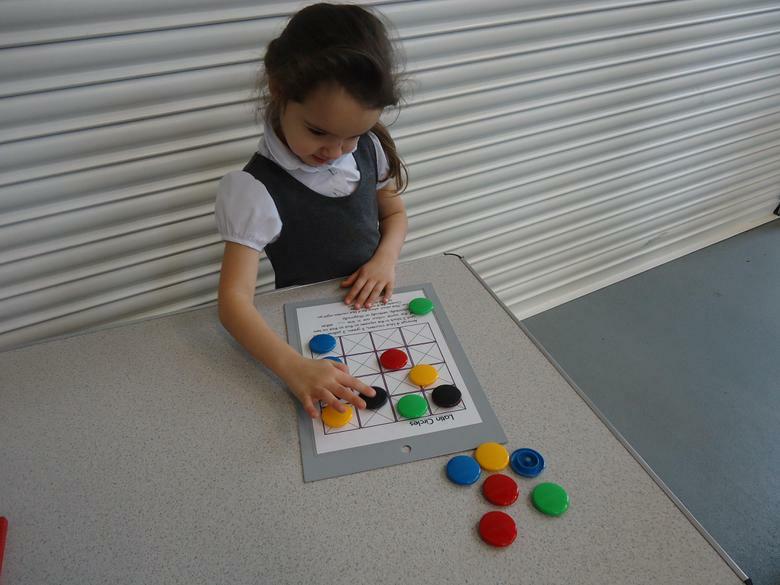 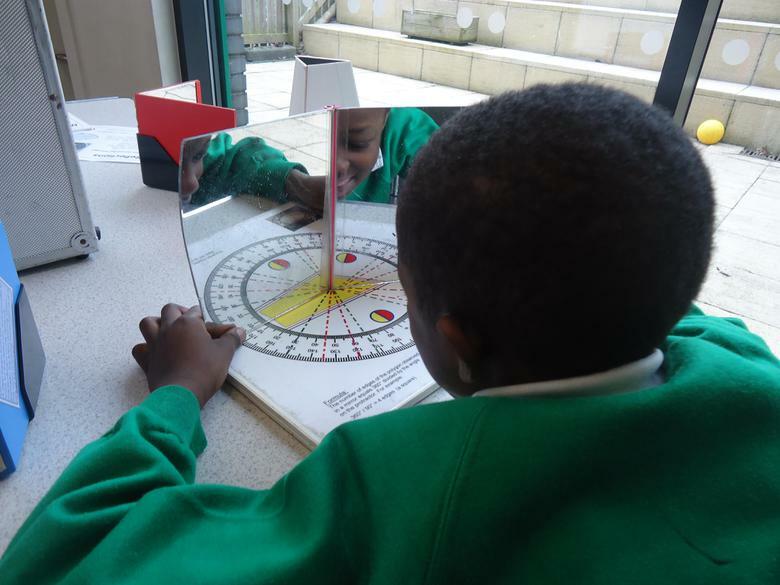 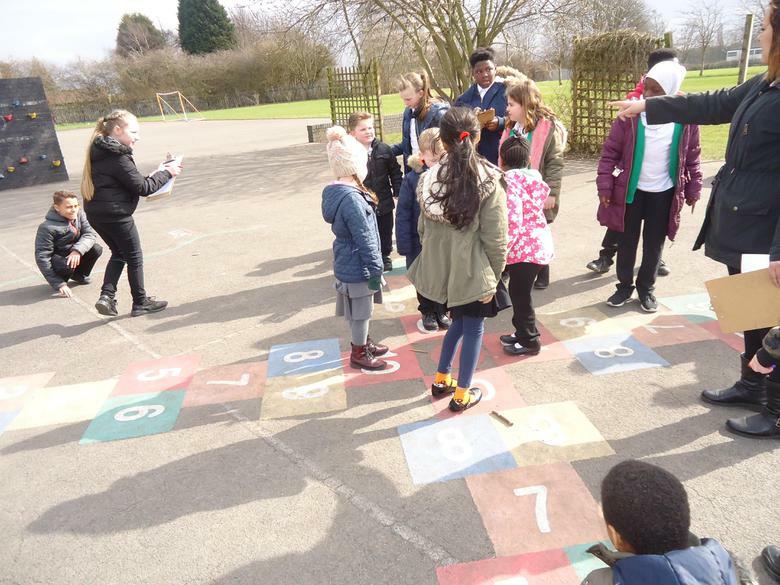 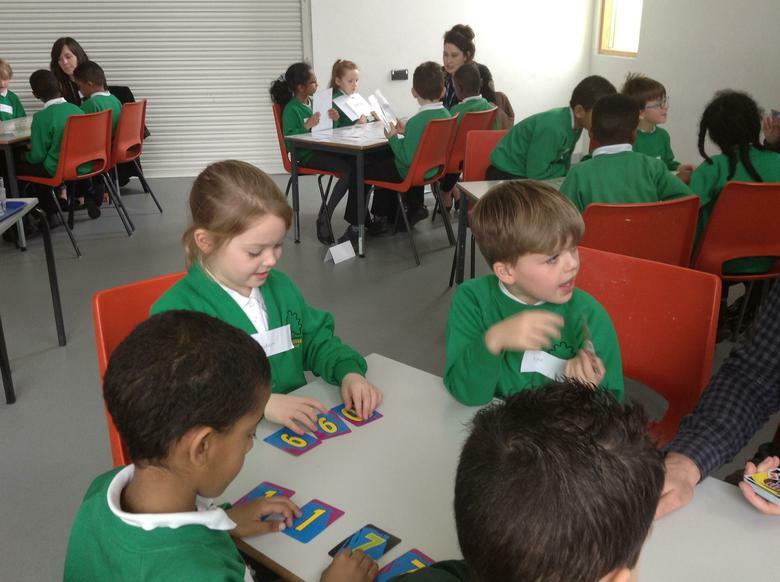 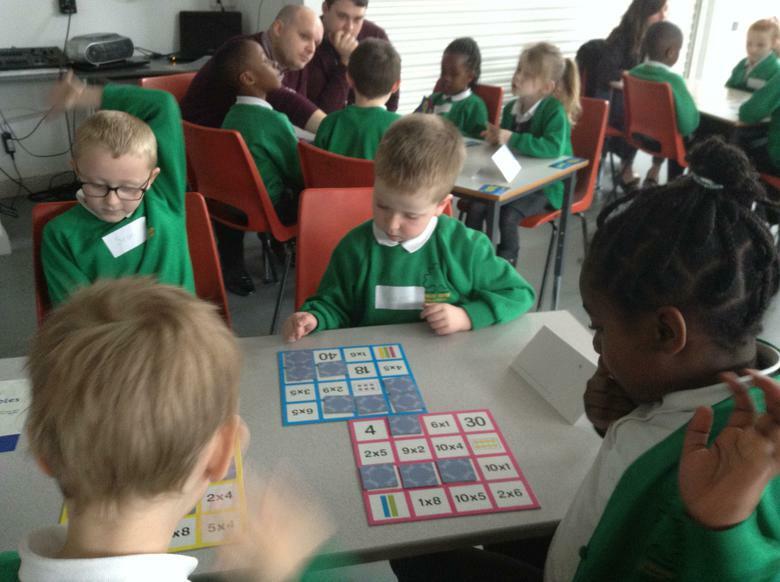 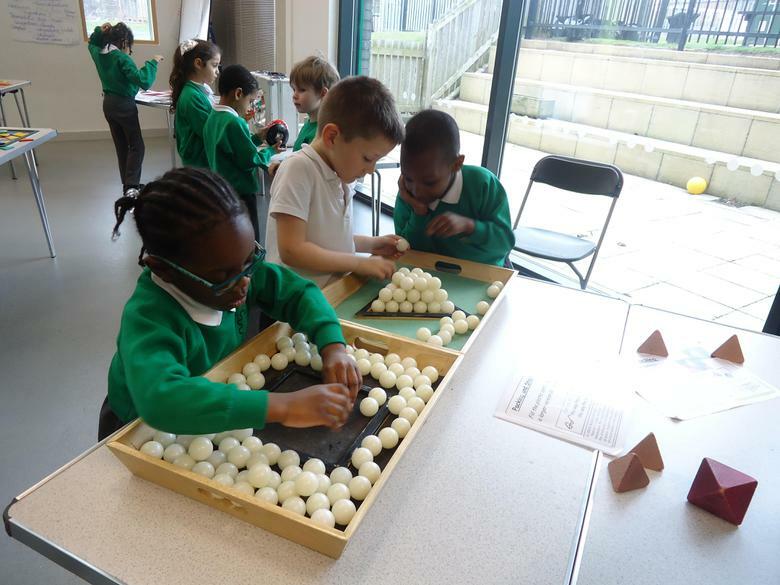 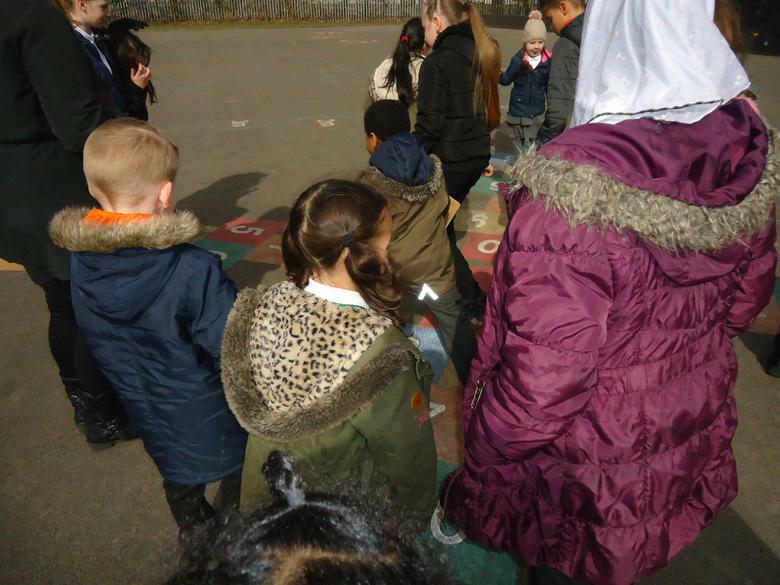 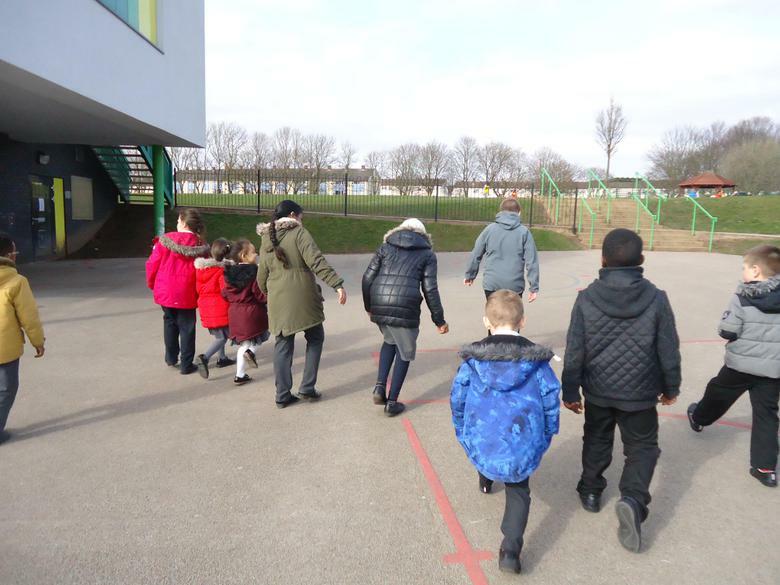 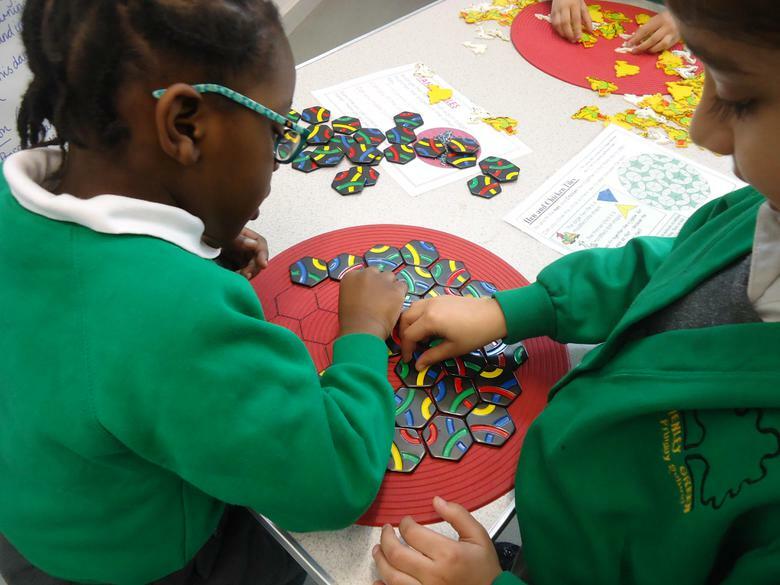 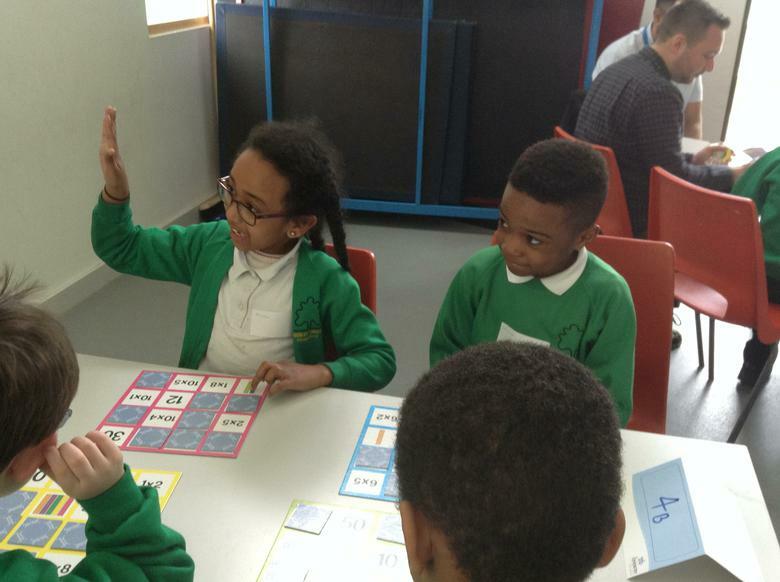 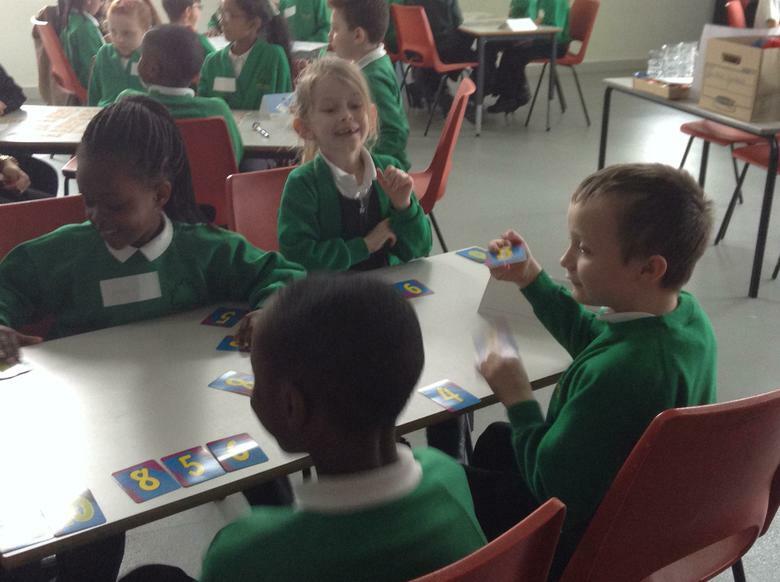 Children played a range of different games, working on their speed, fluency and confidence in a range of maths skills. 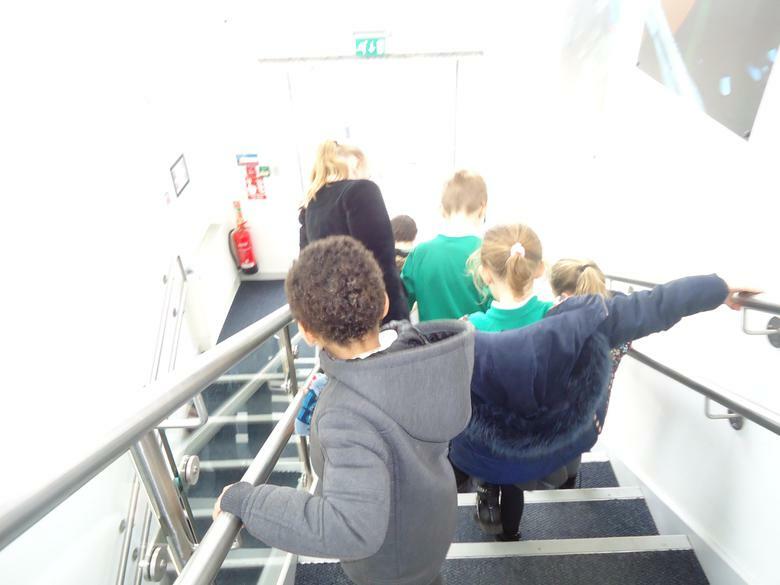 Everyone had a great morning (the adults as well as the children) and we are looking forward to the next one already! 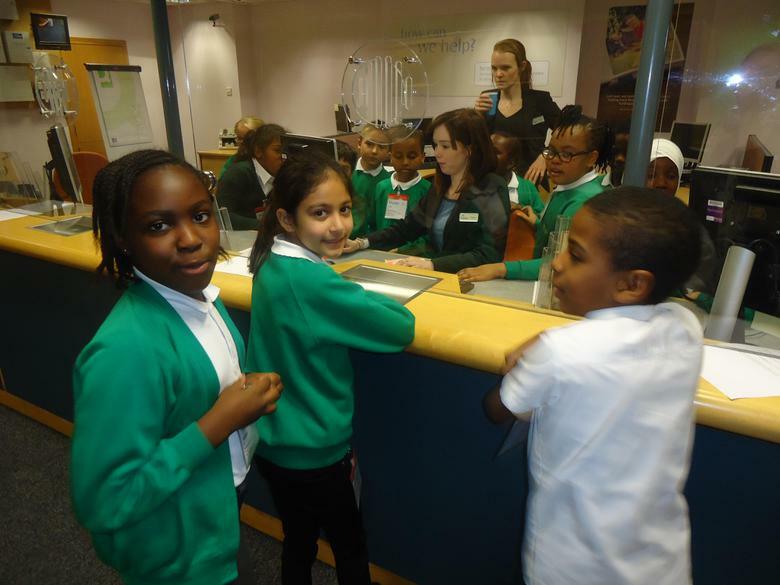 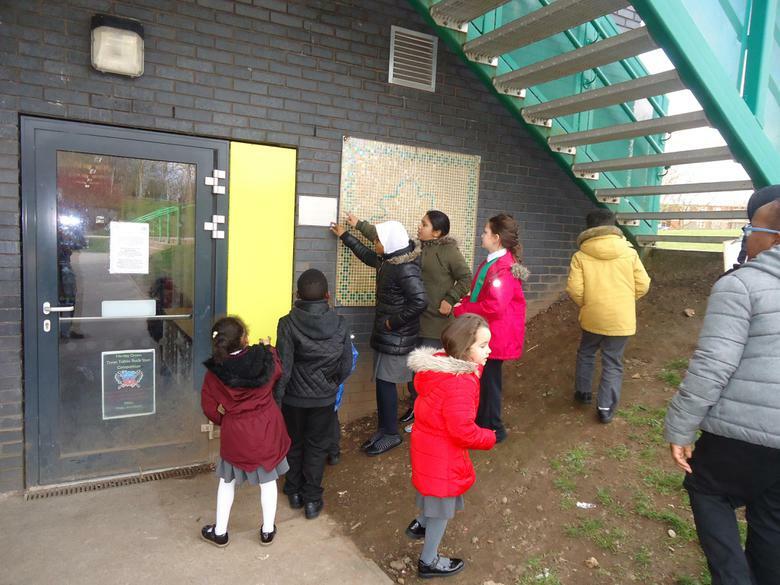 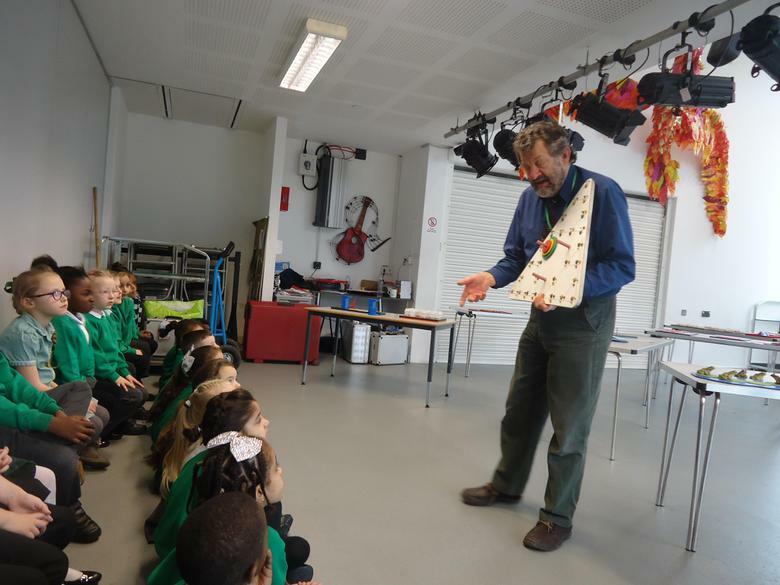 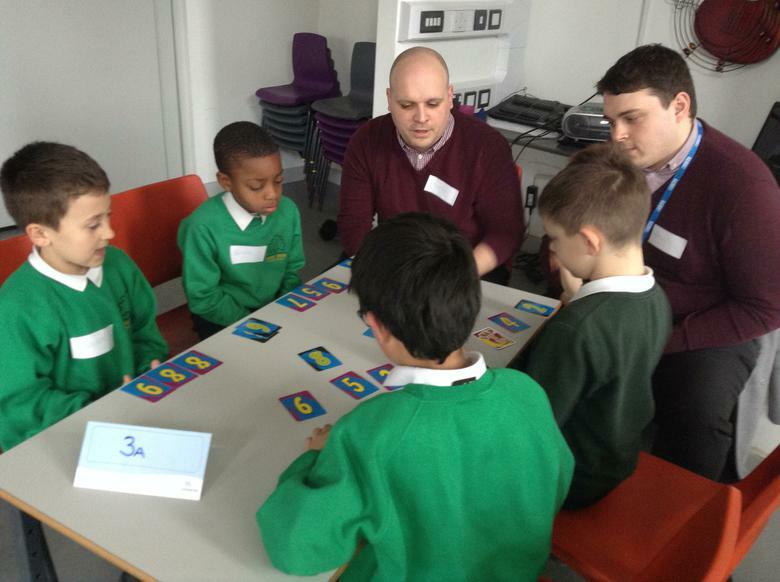 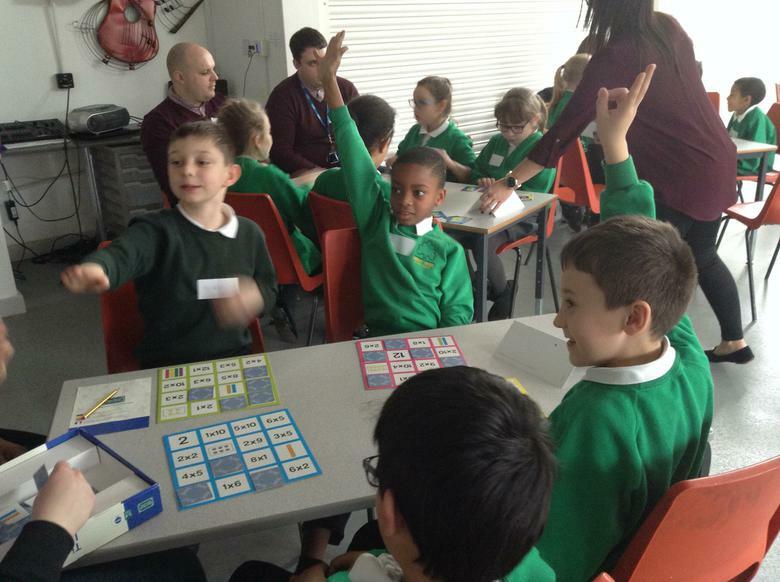 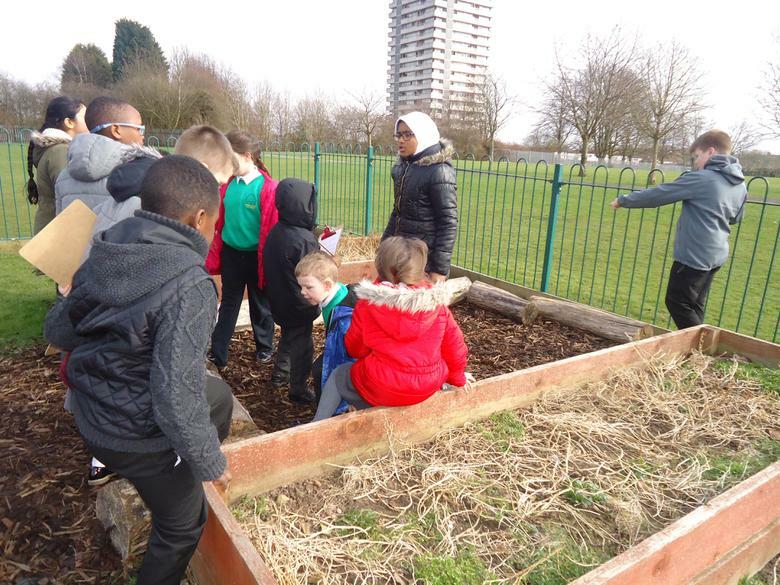 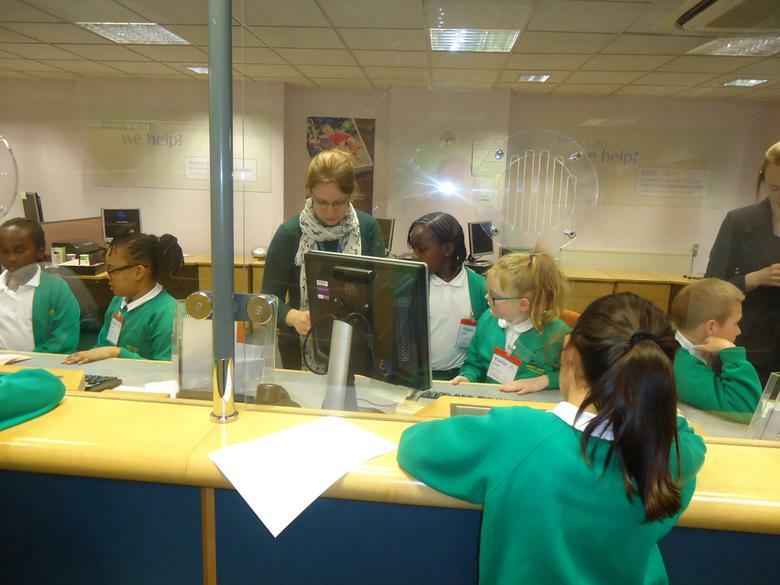 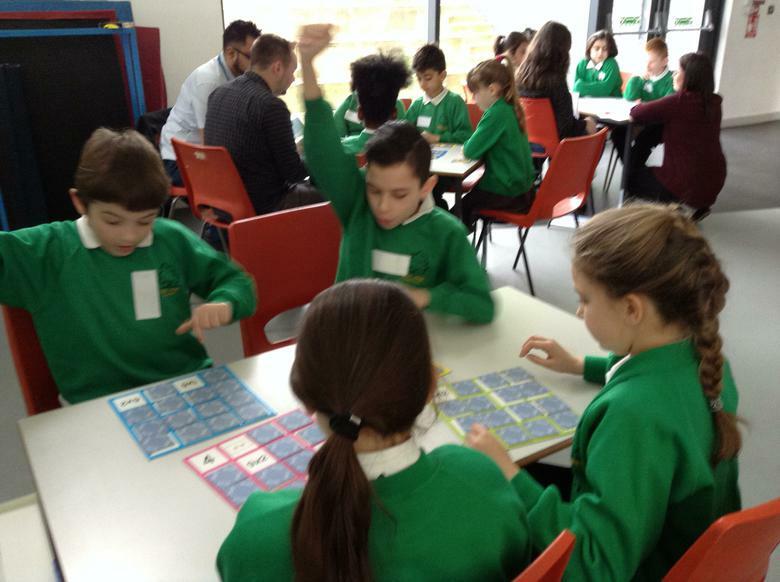 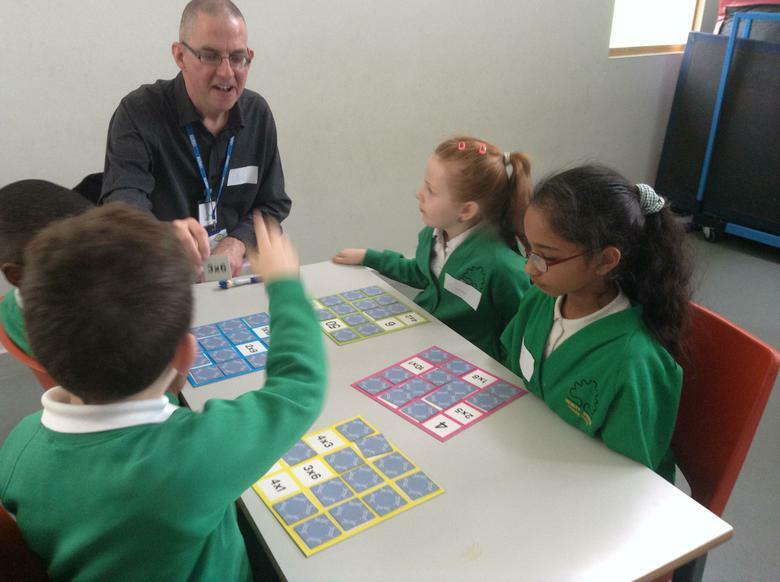 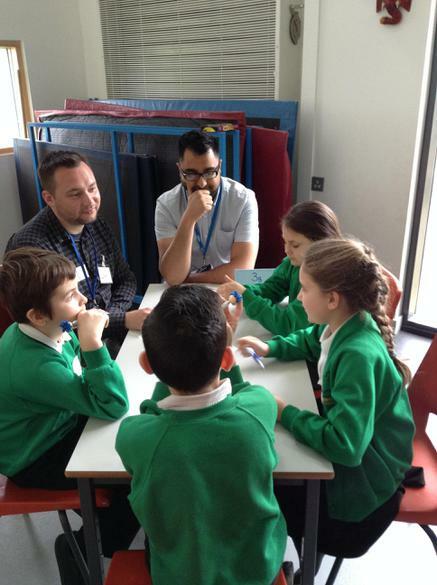 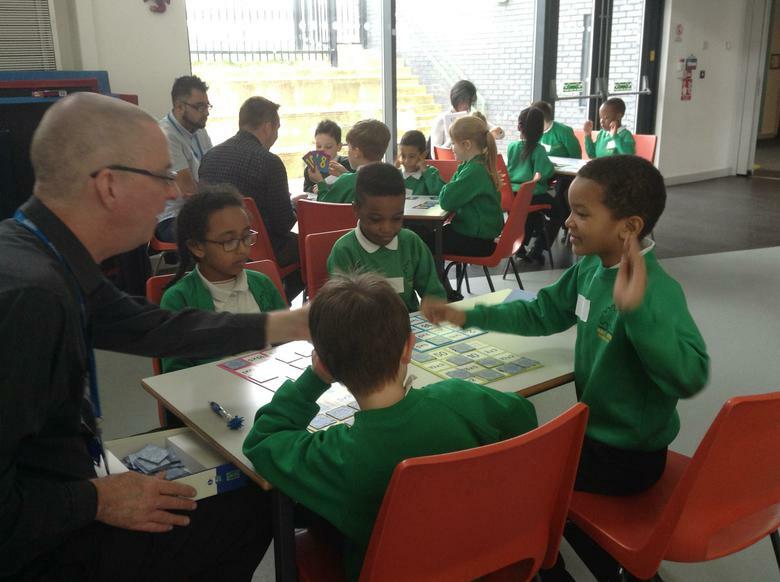 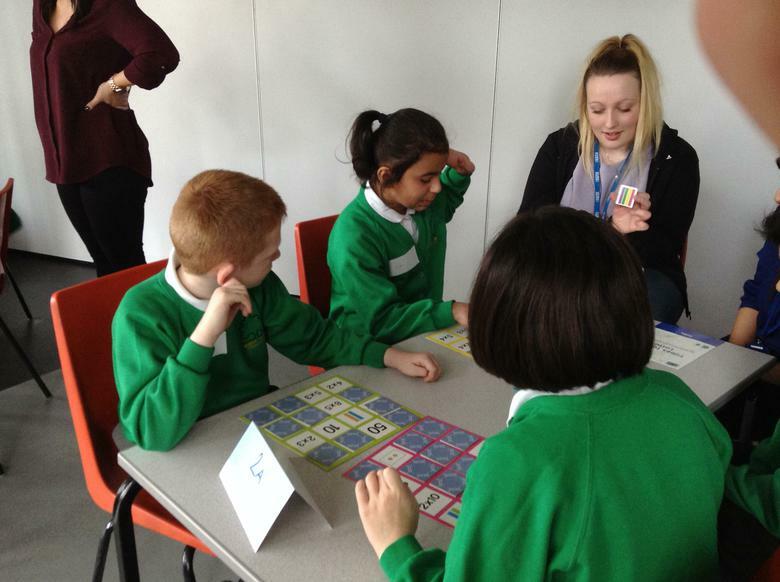 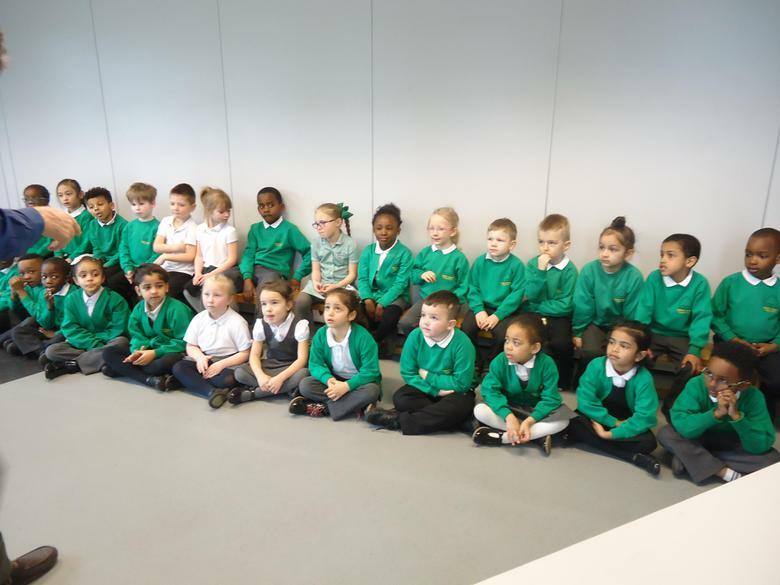 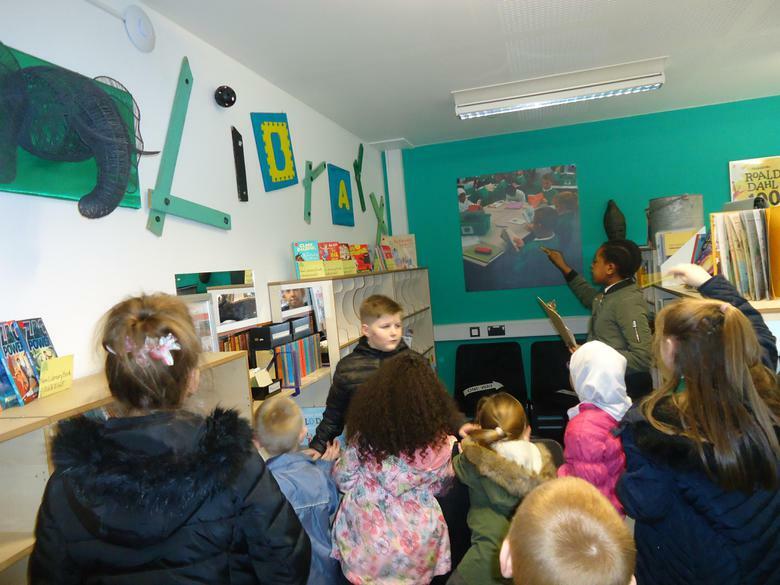 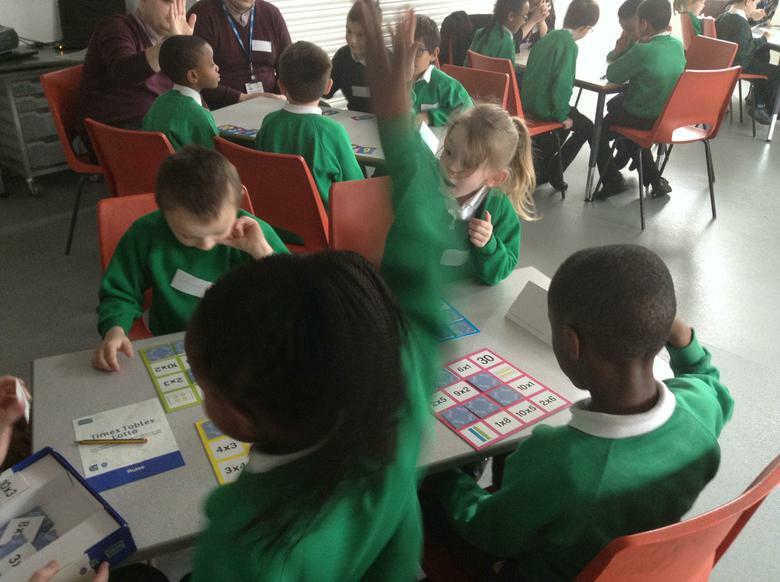 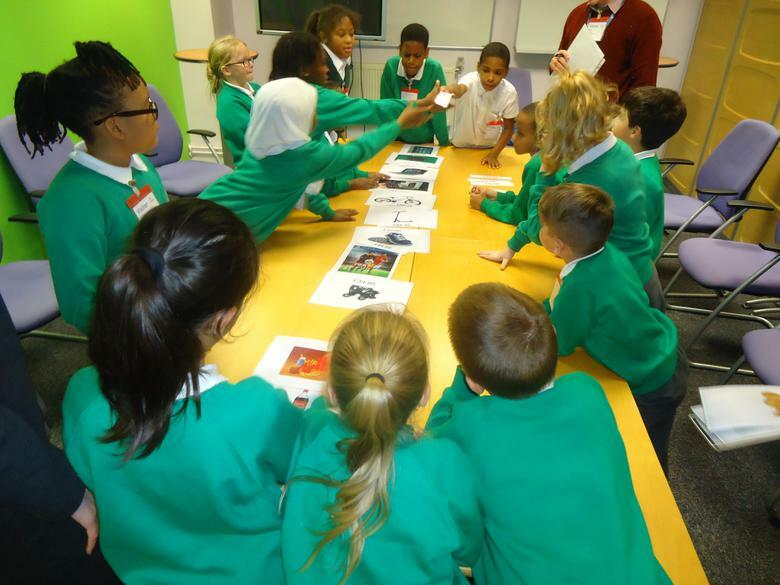 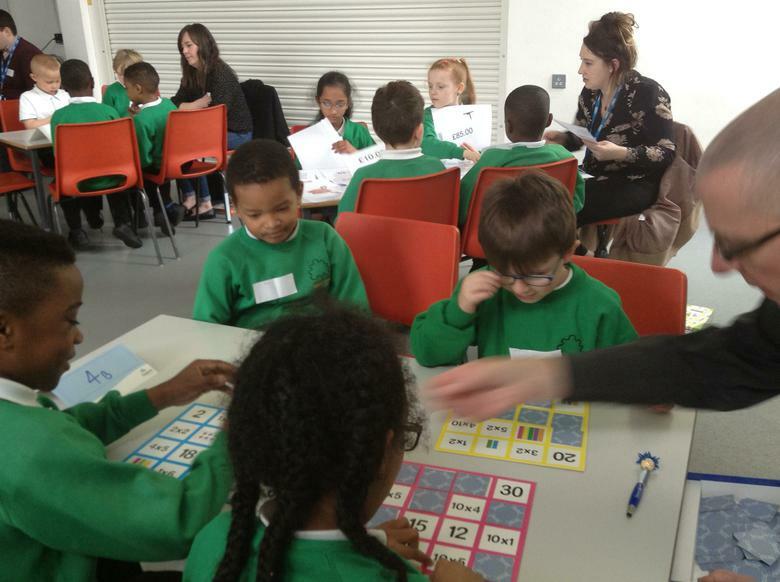 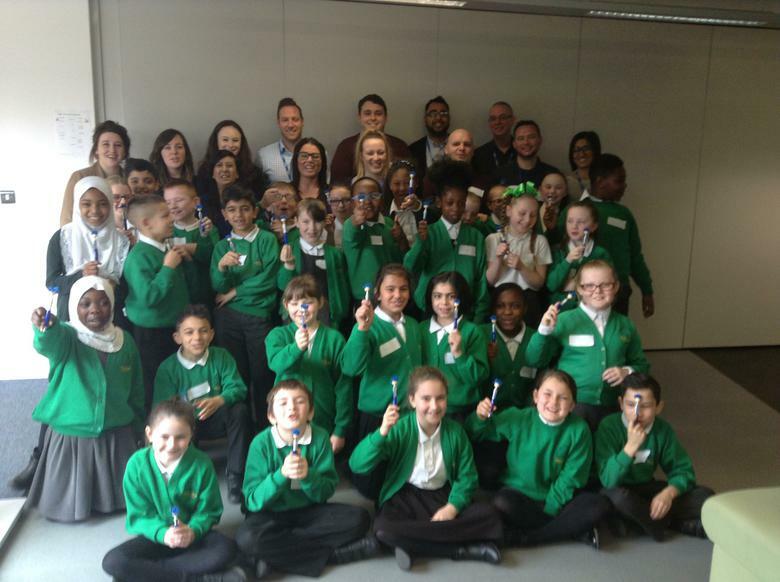 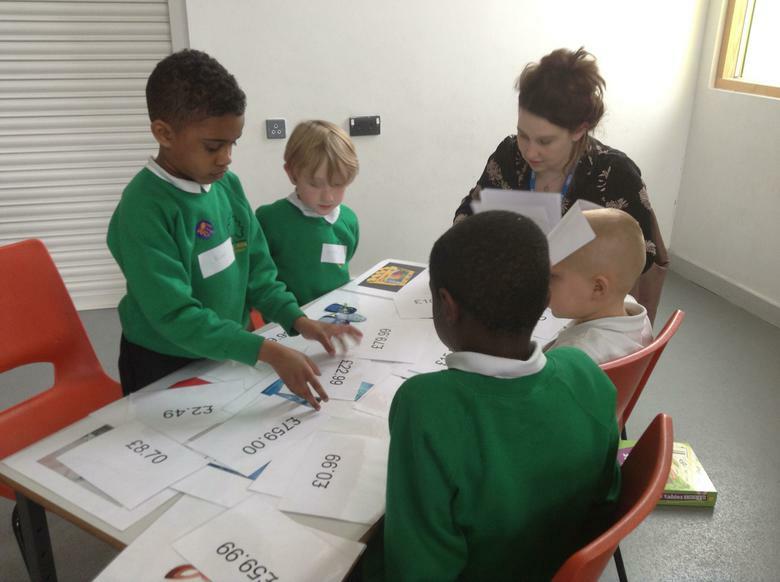 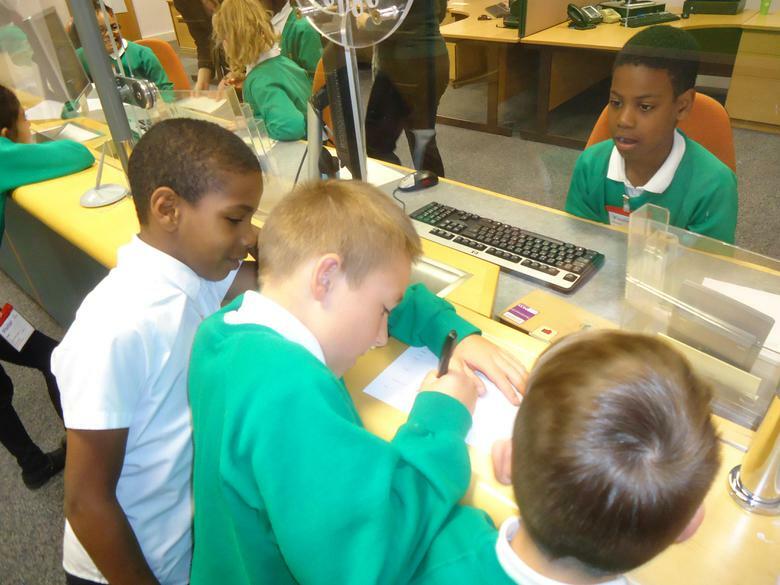 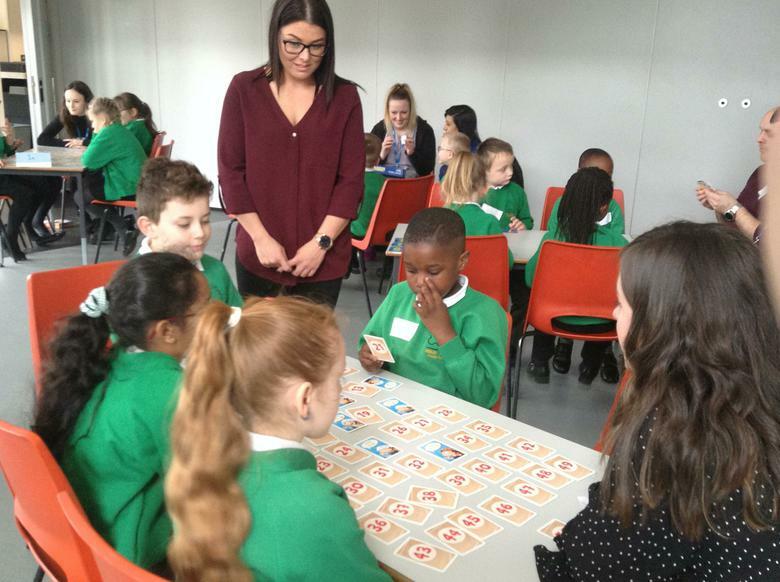 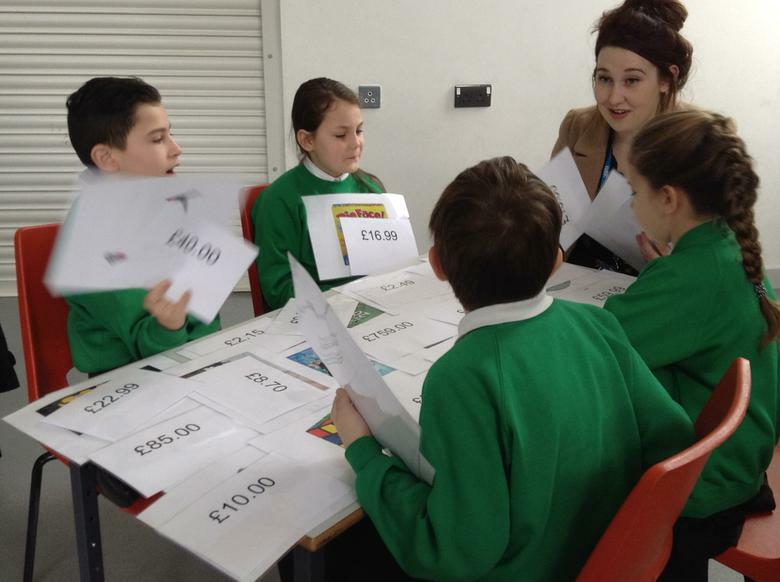 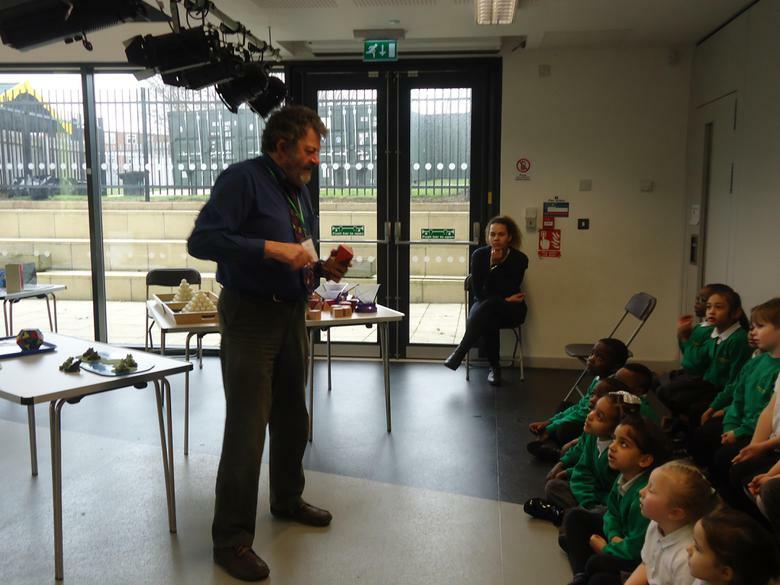 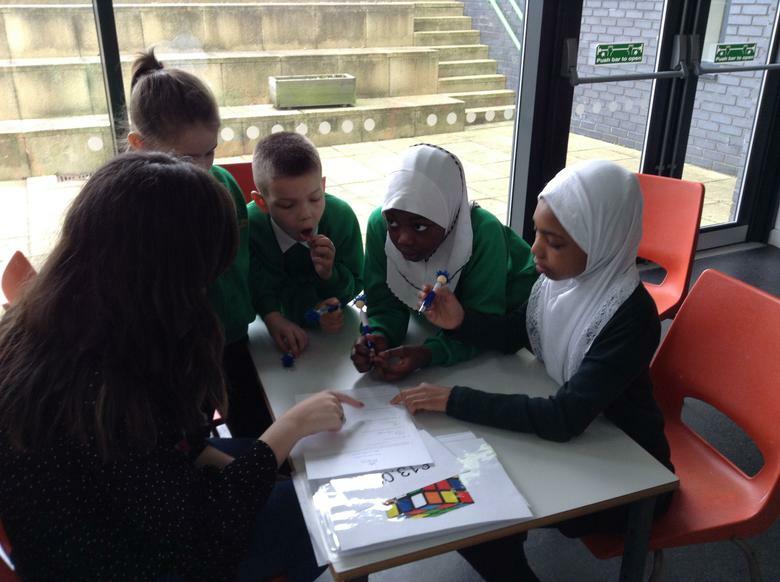 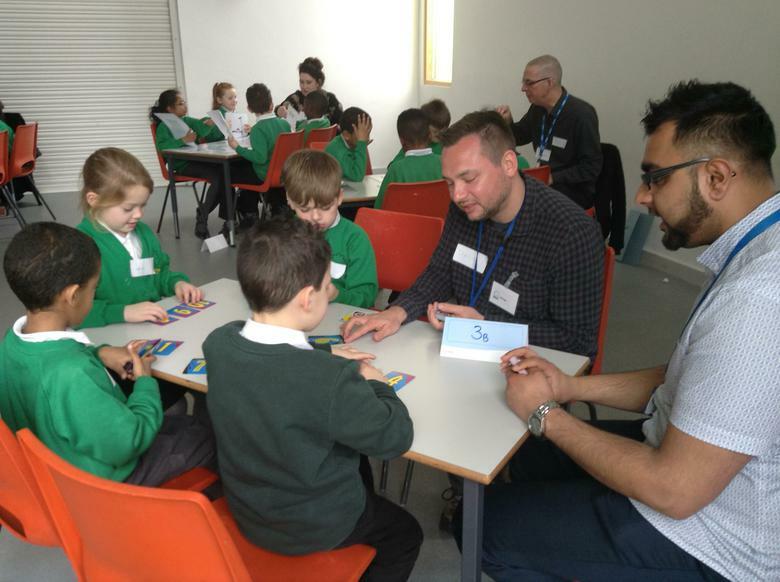 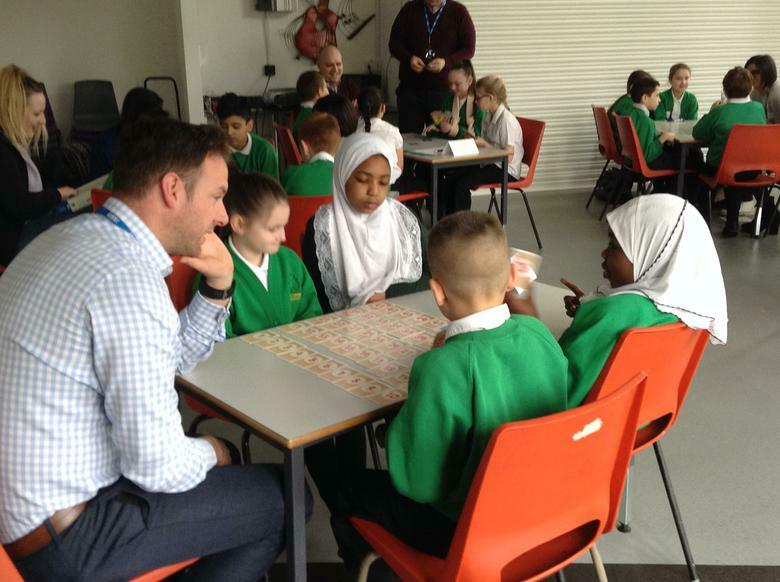 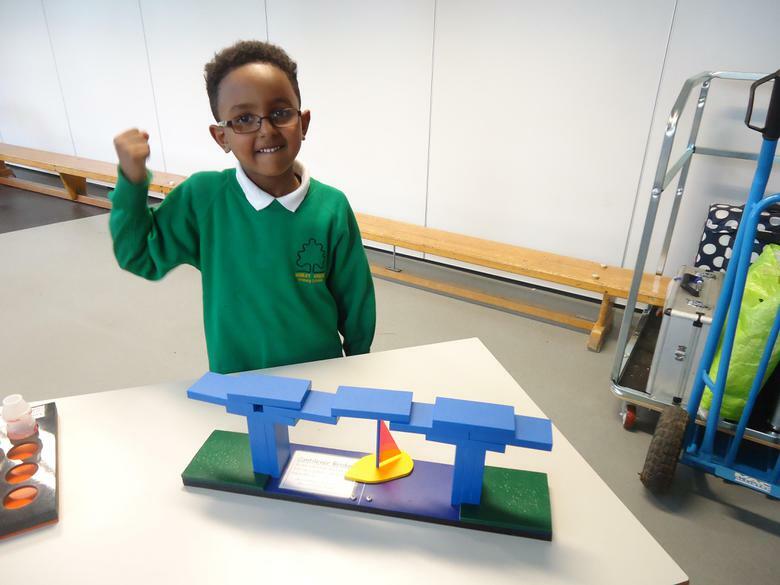 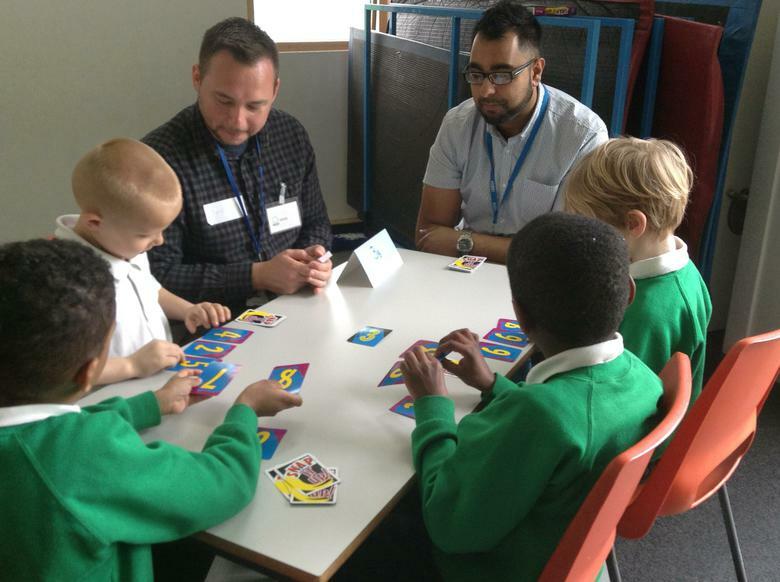 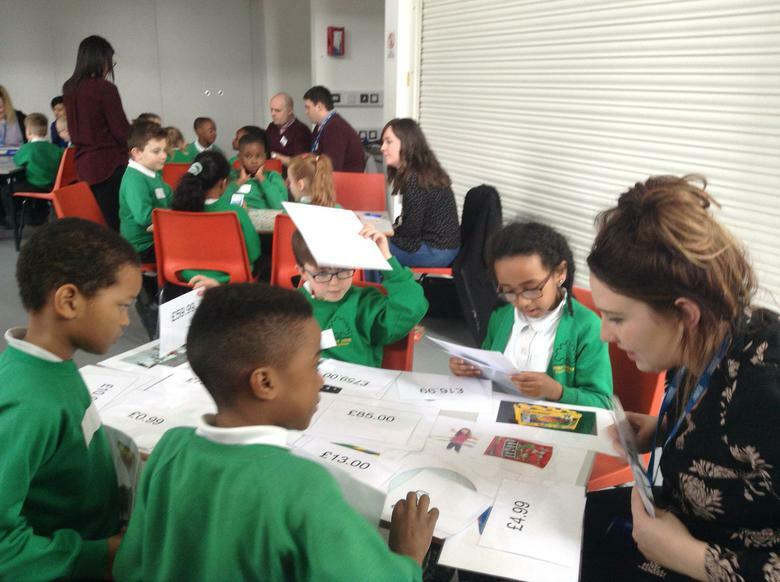 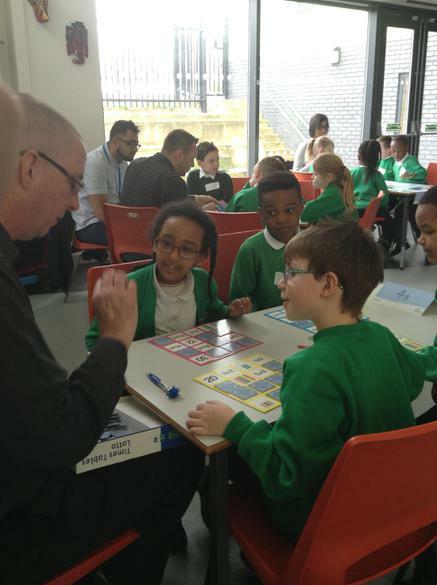 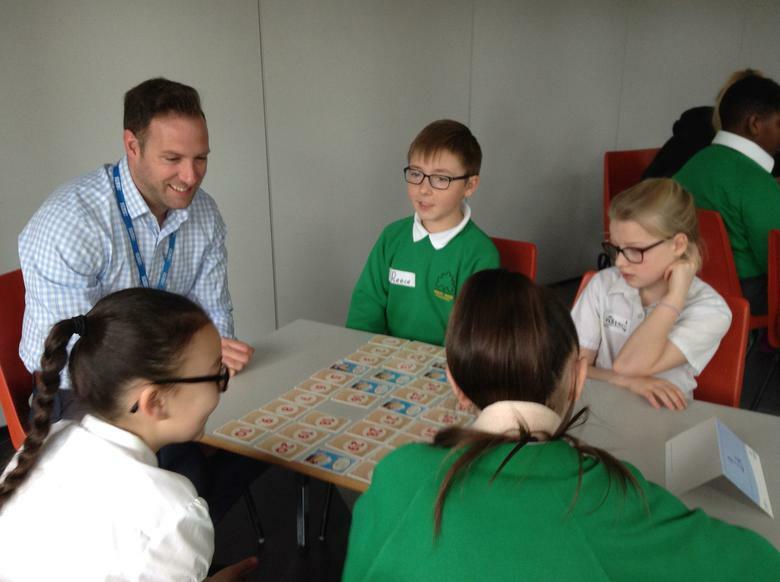 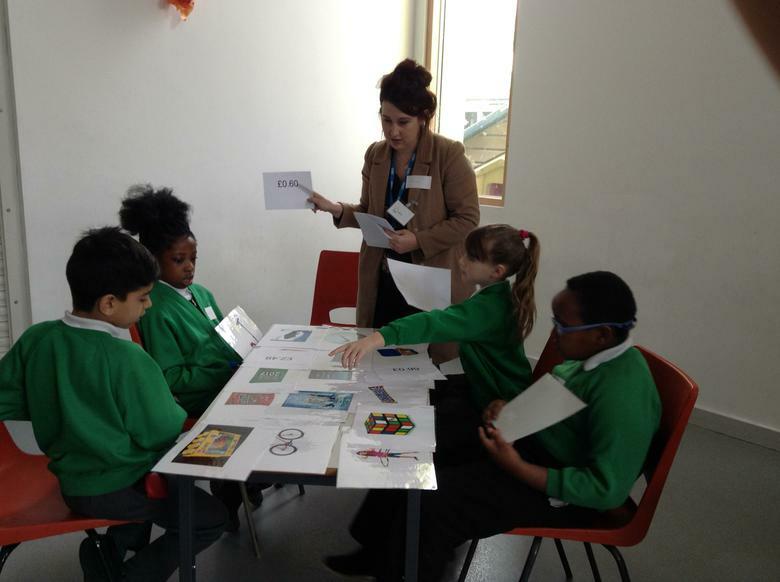 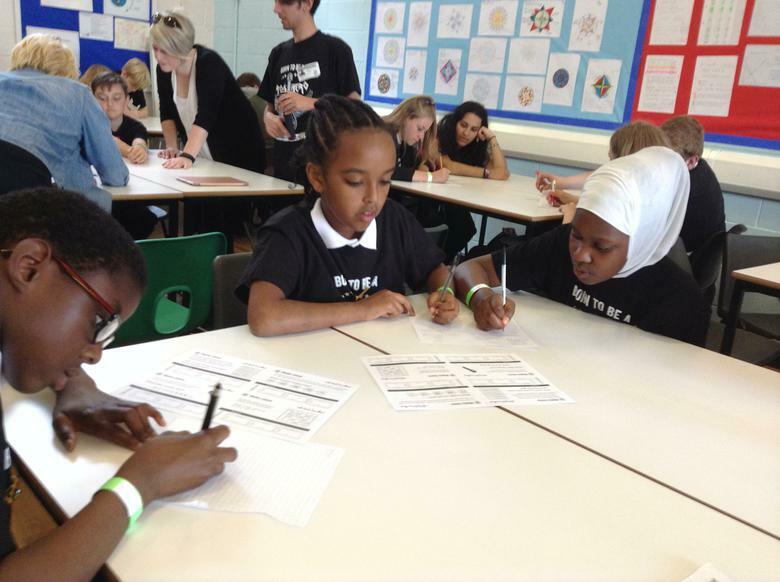 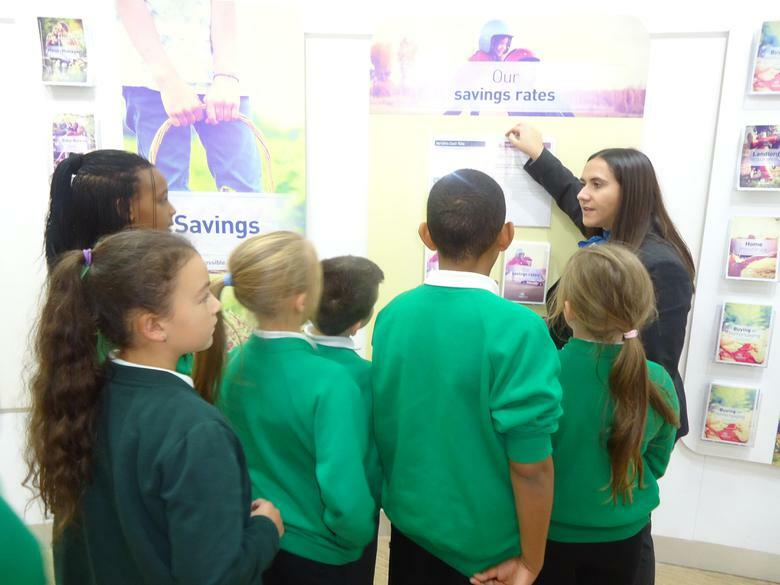 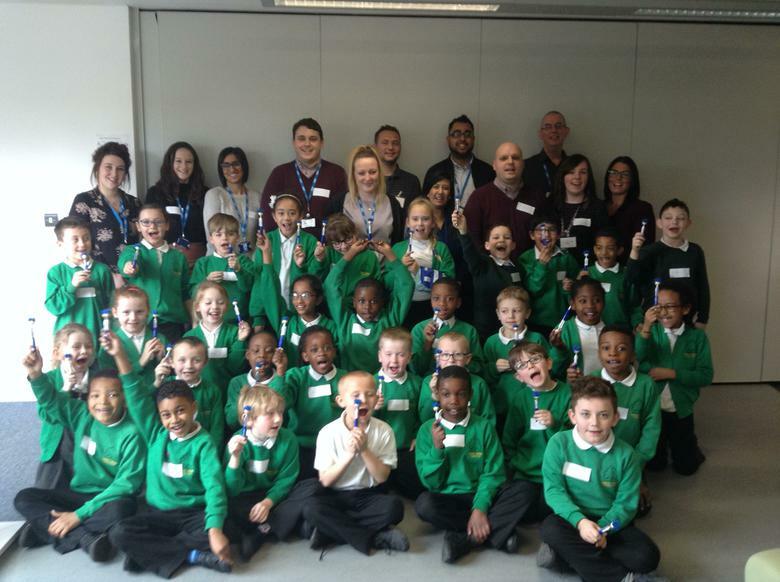 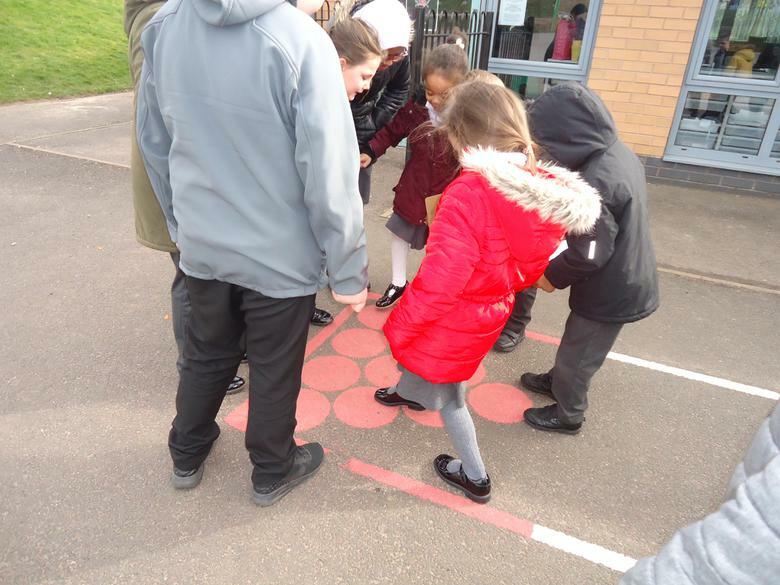 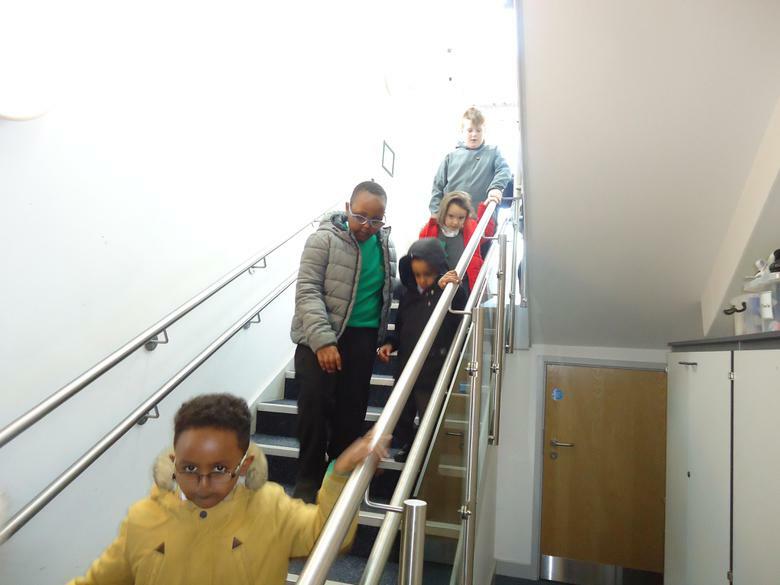 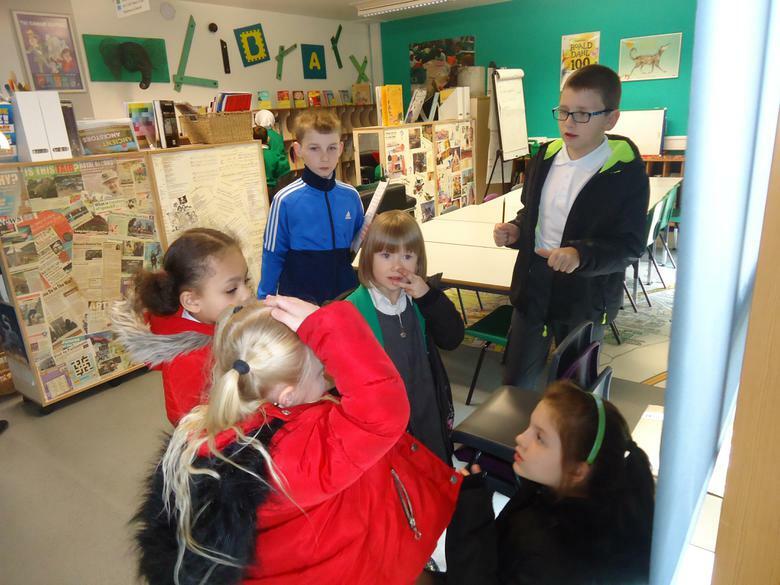 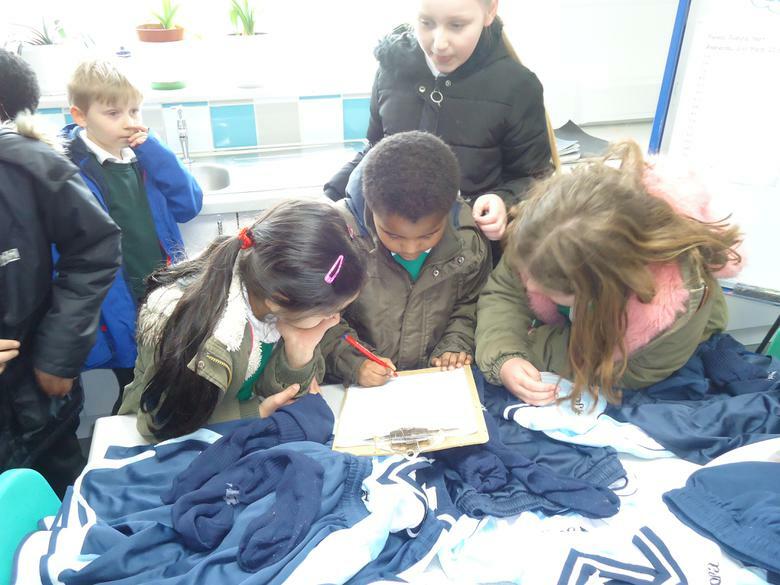 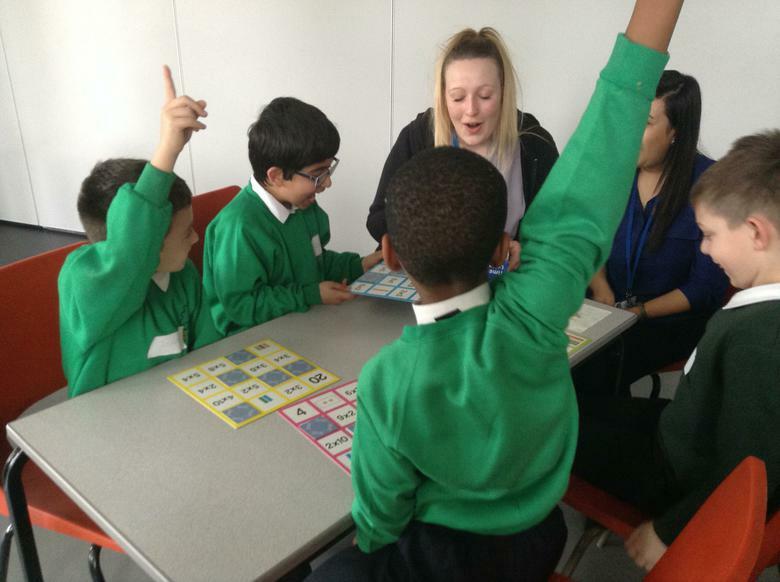 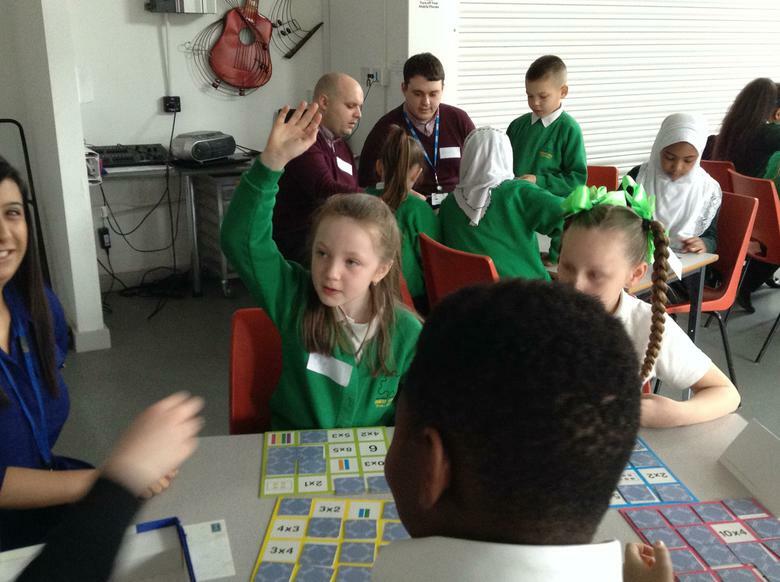 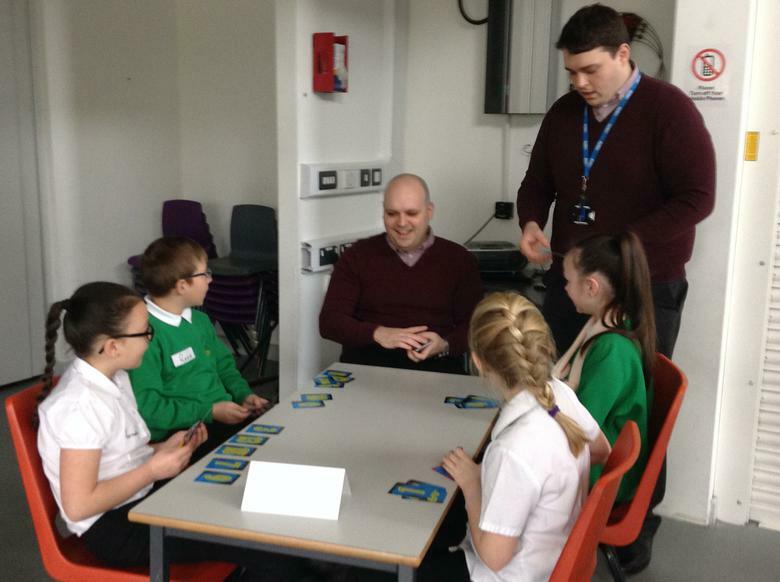 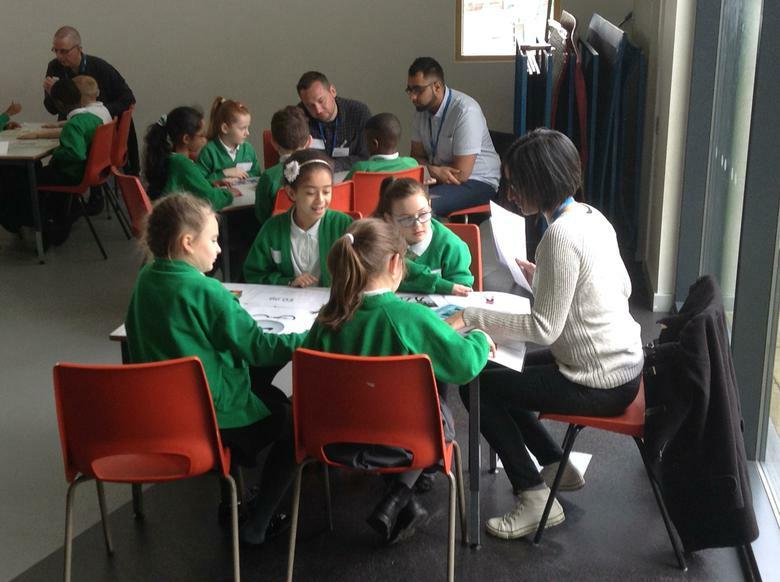 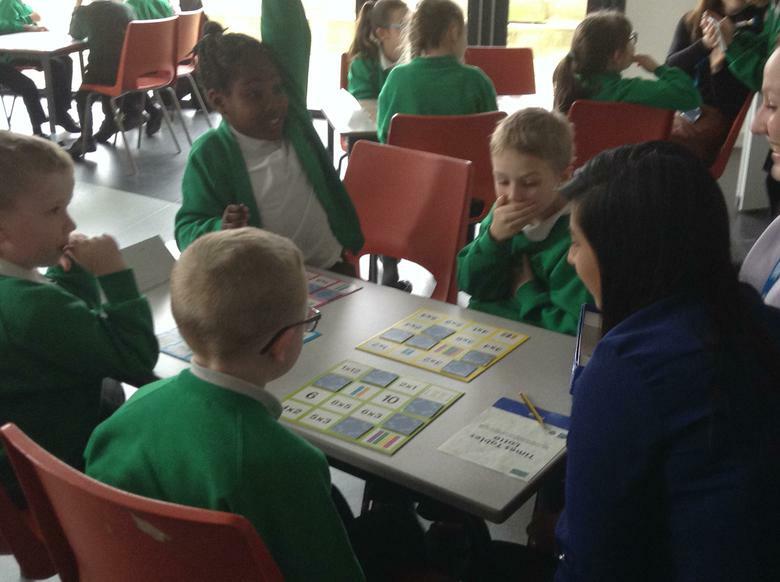 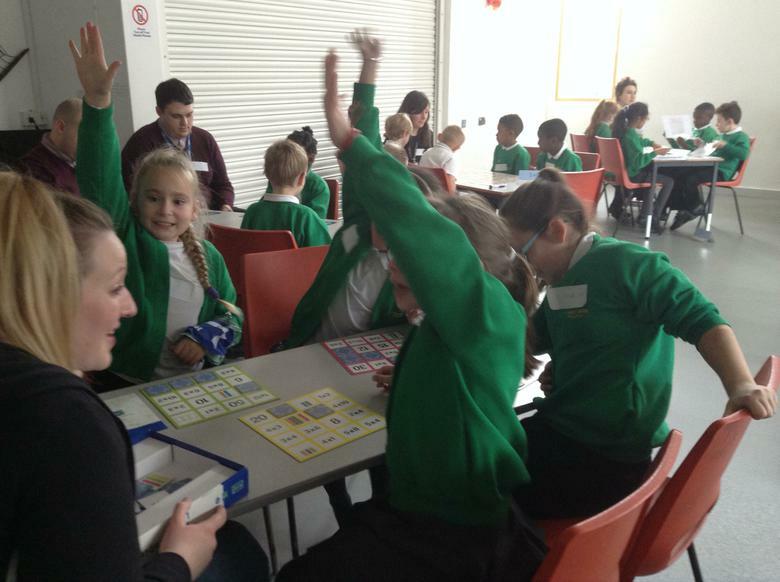 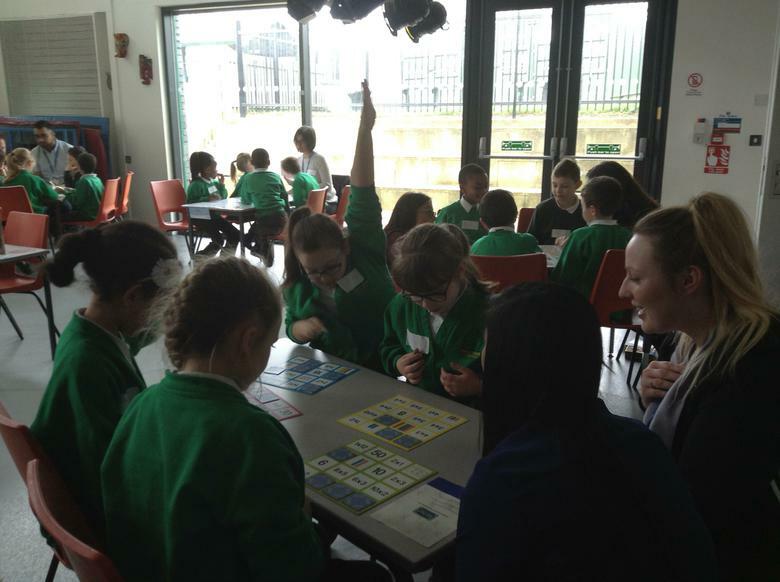 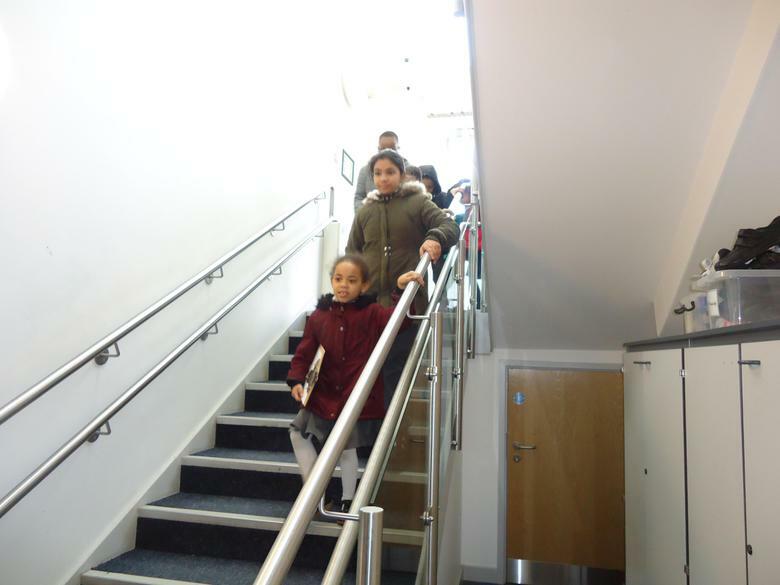 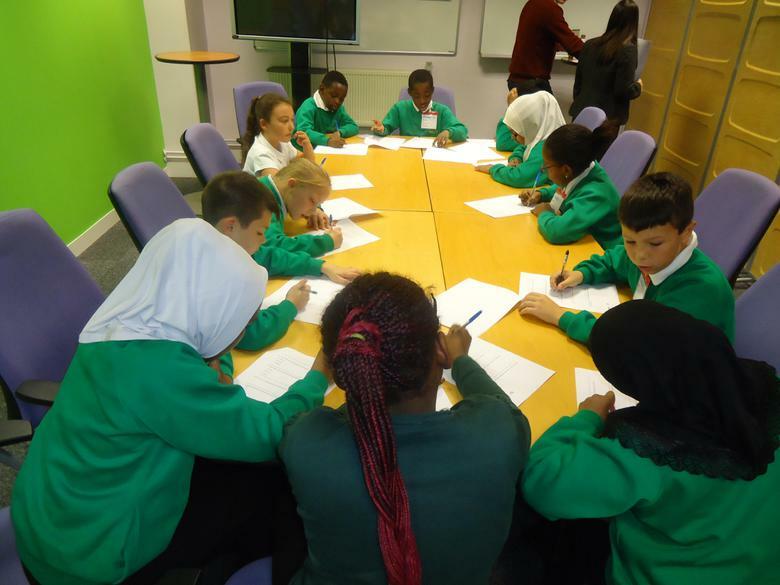 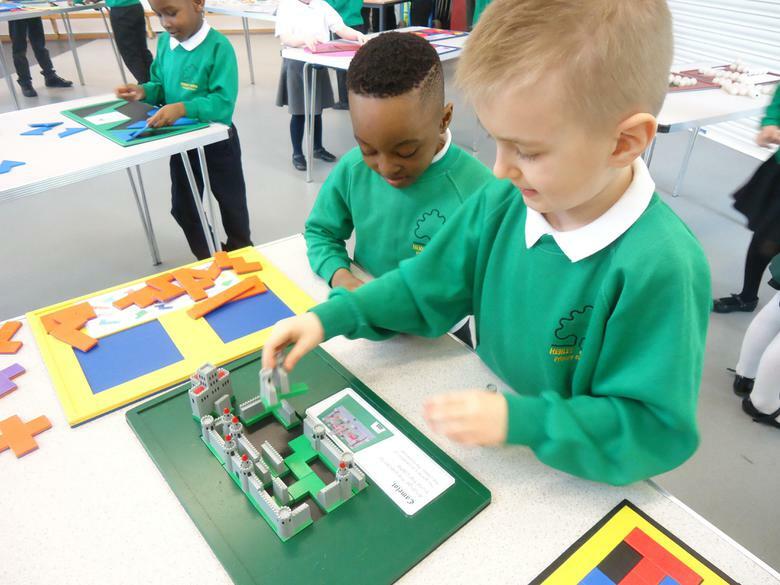 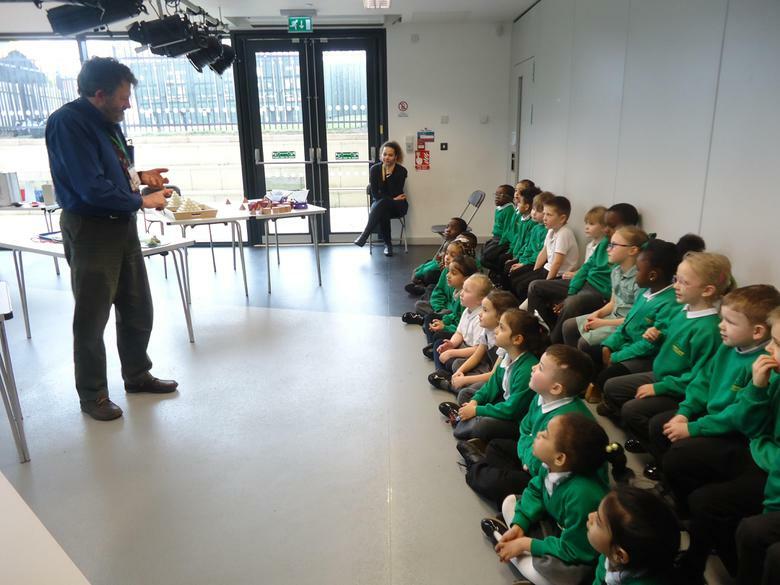 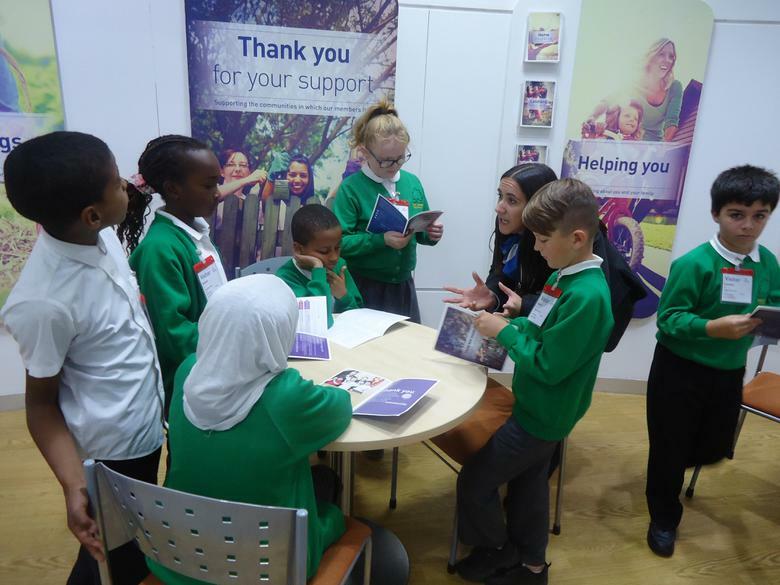 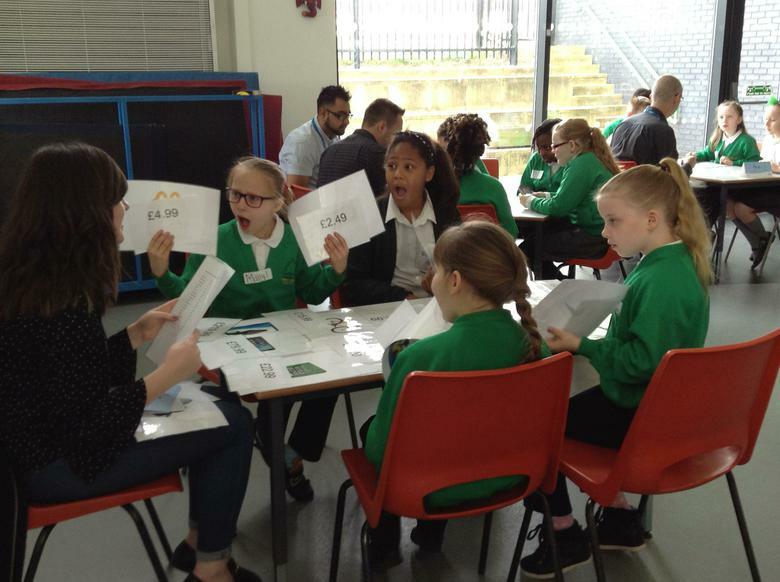 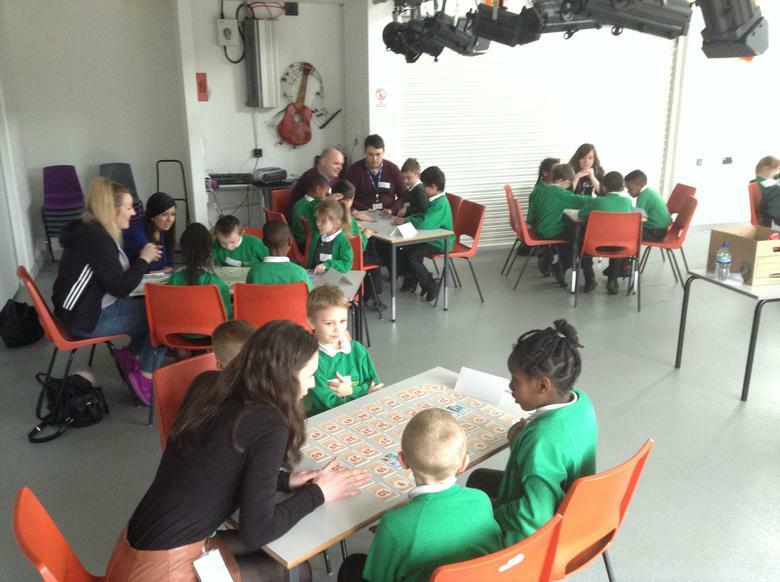 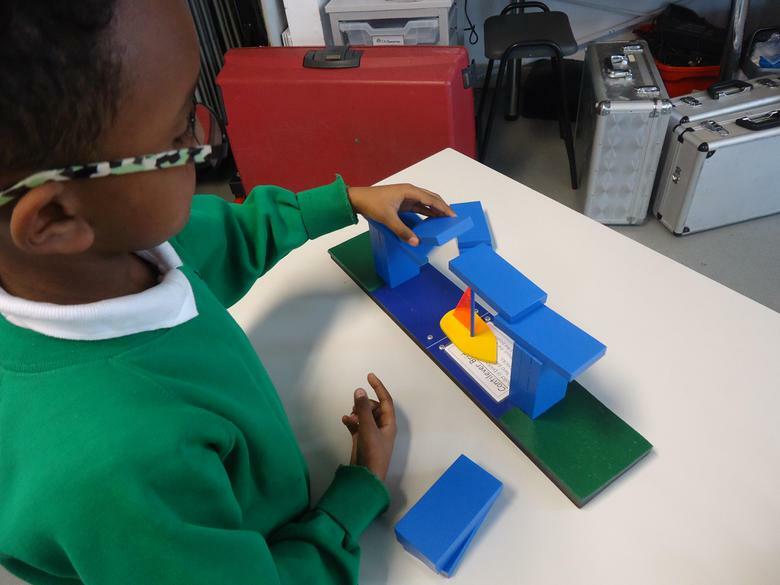 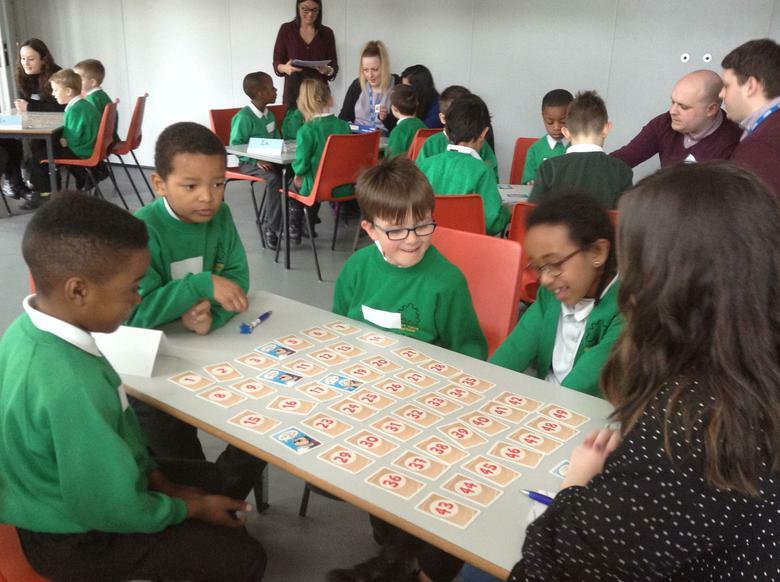 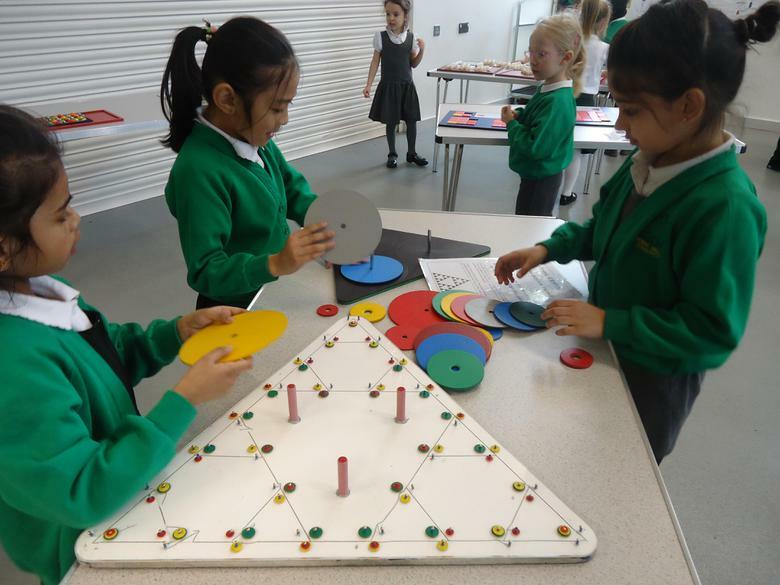 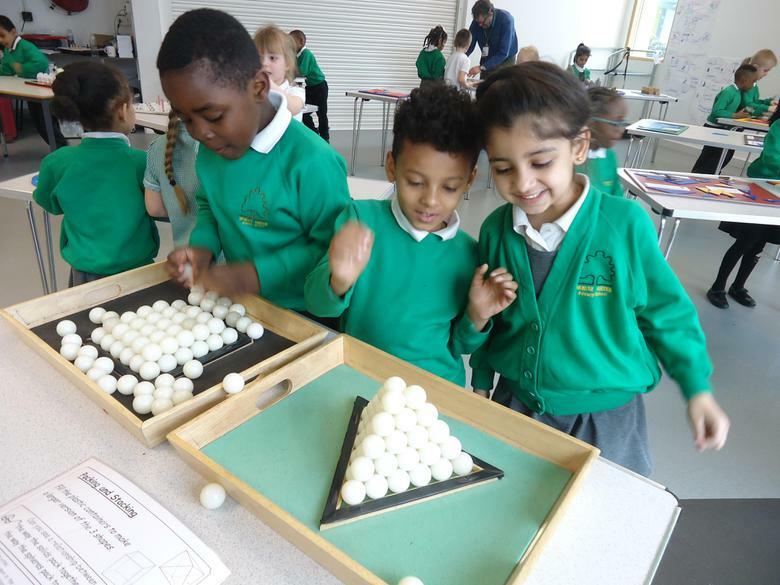 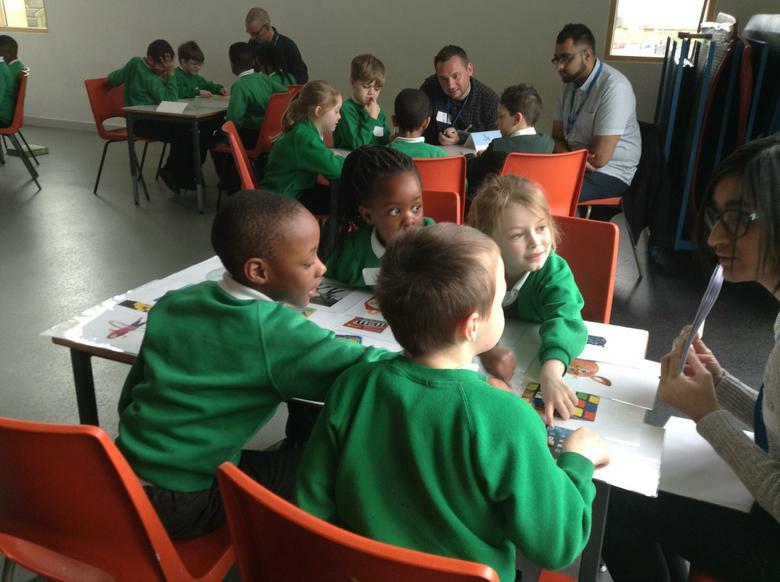 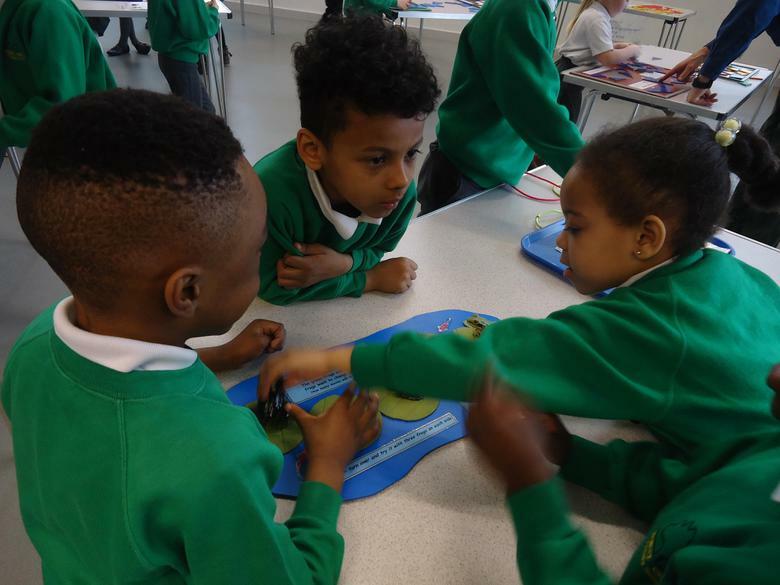 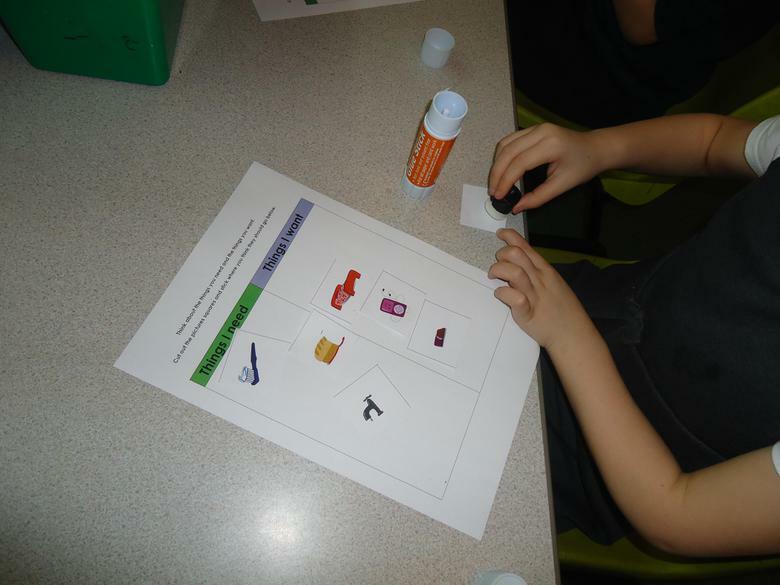 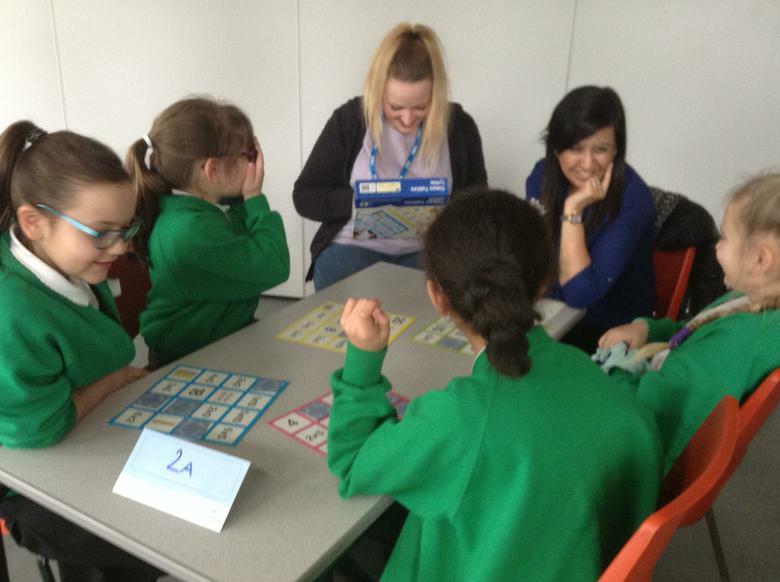 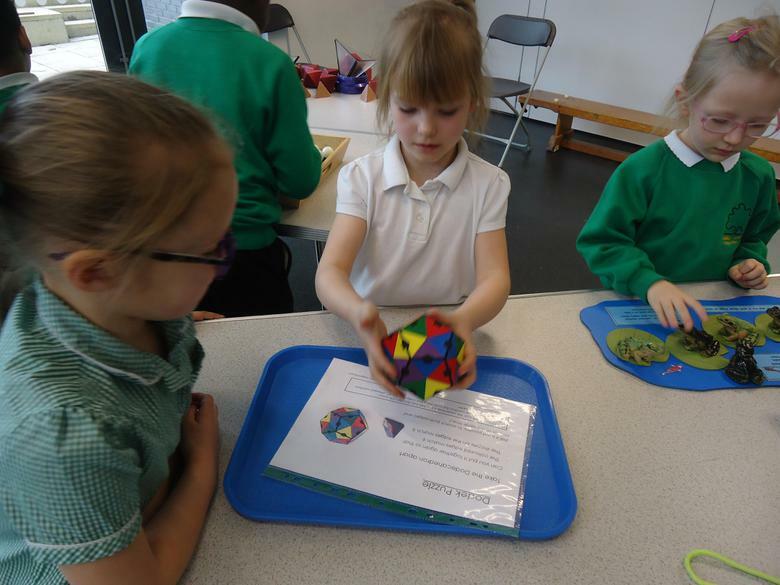 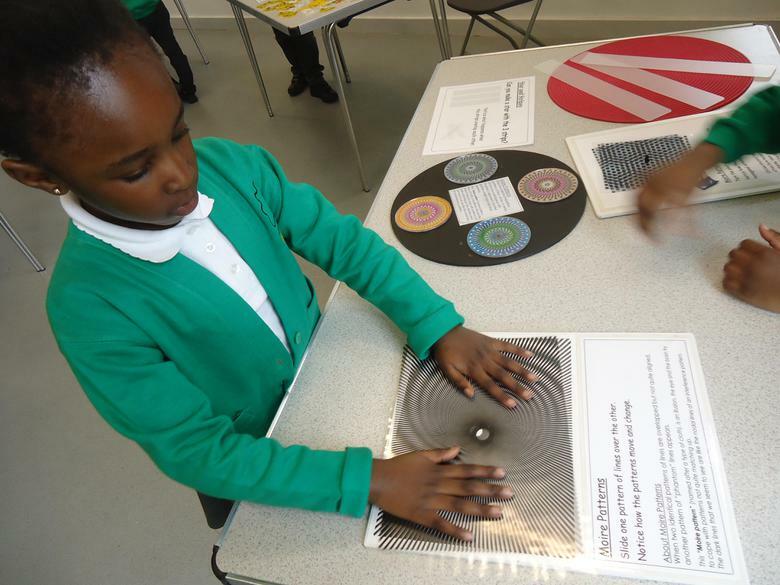 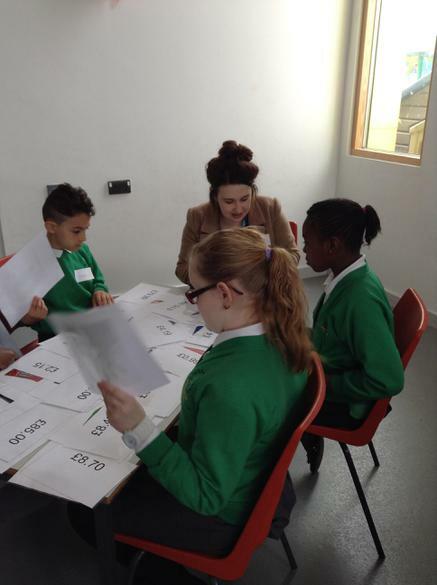 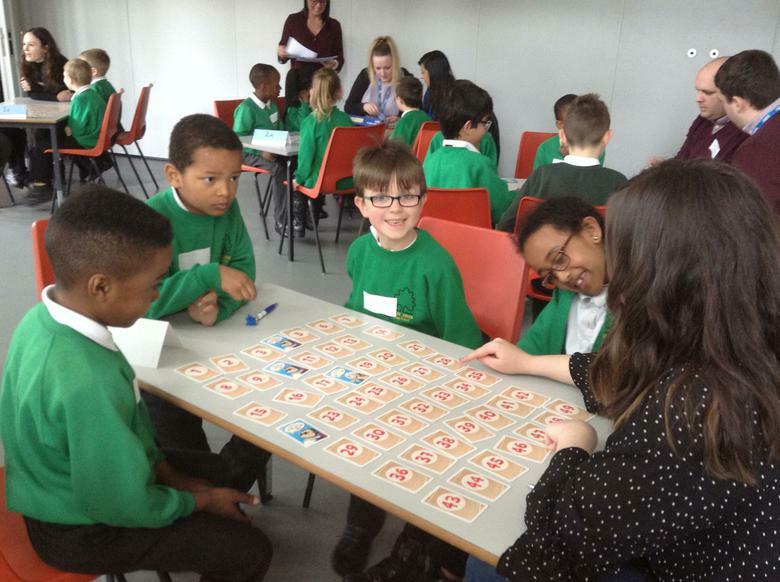 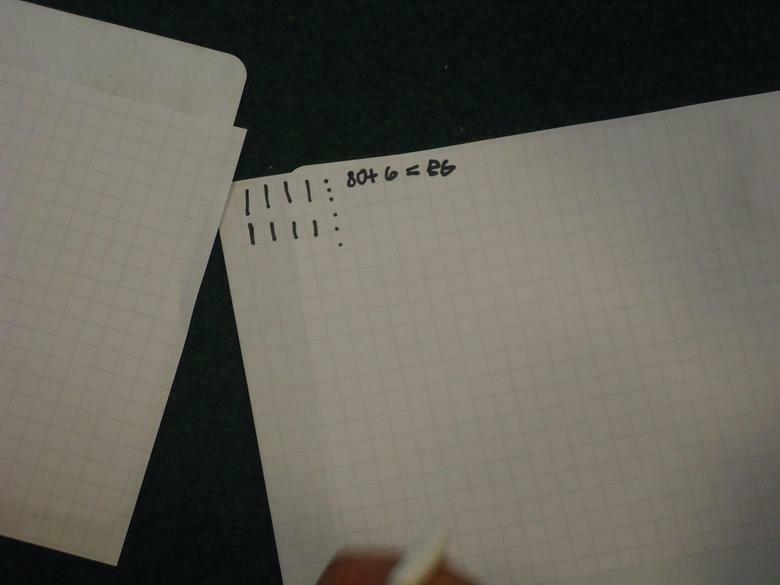 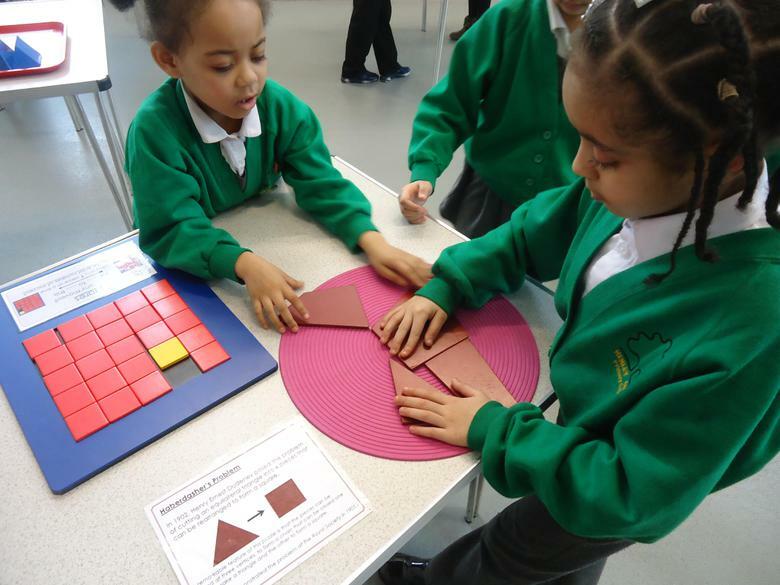 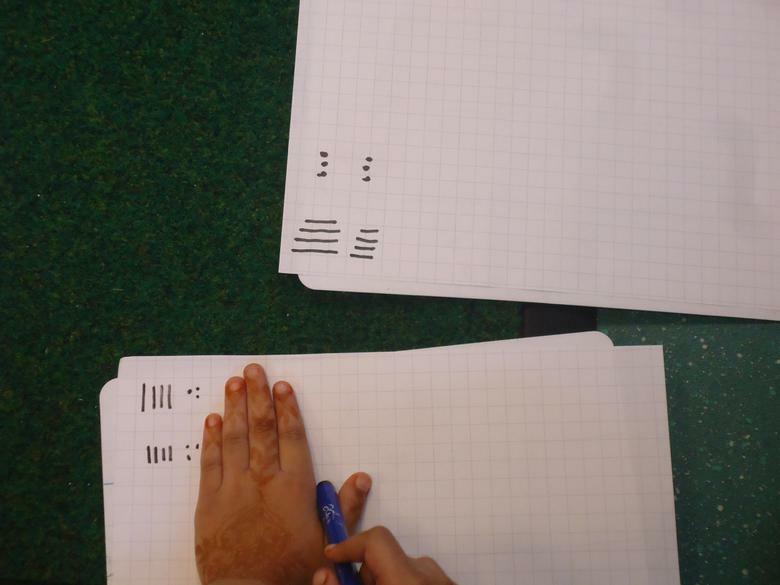 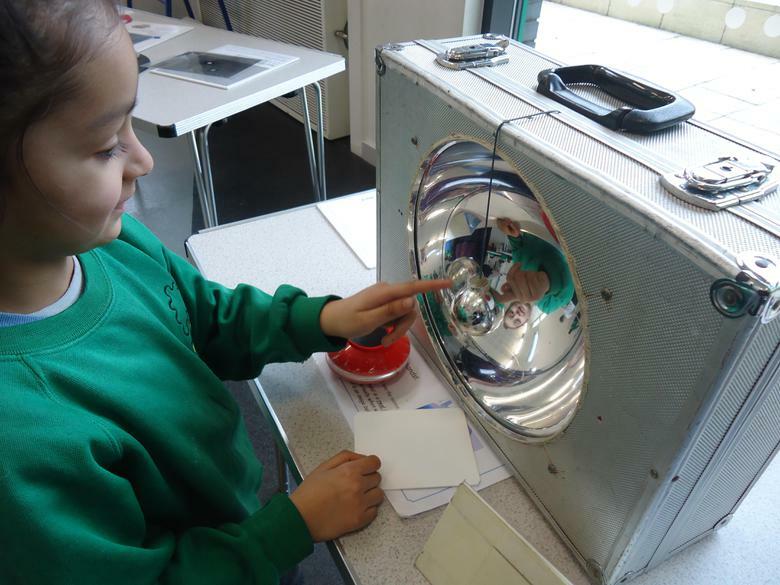 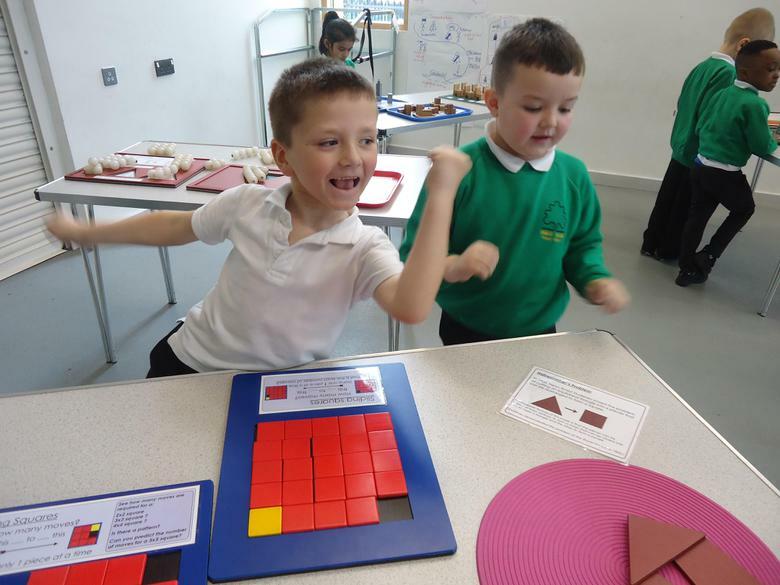 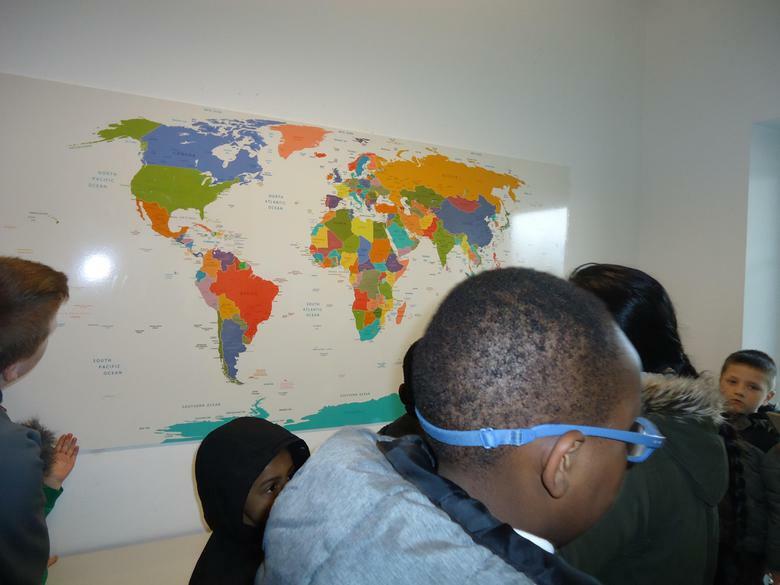 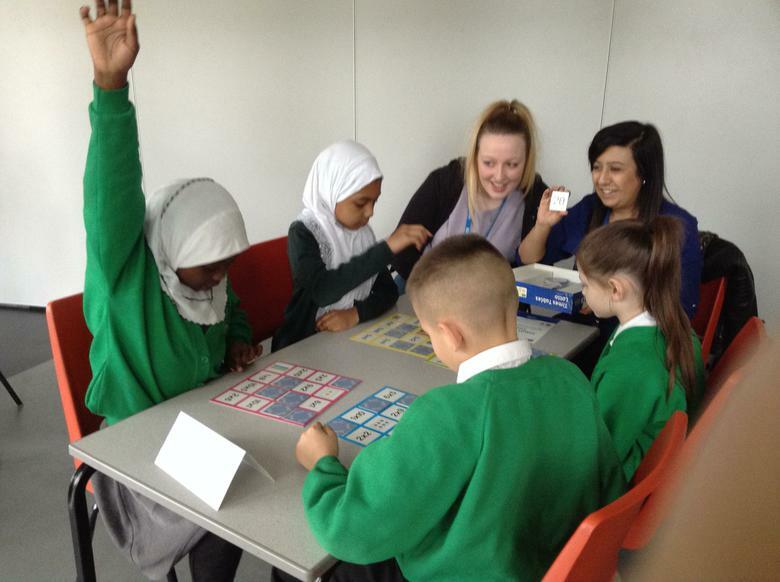 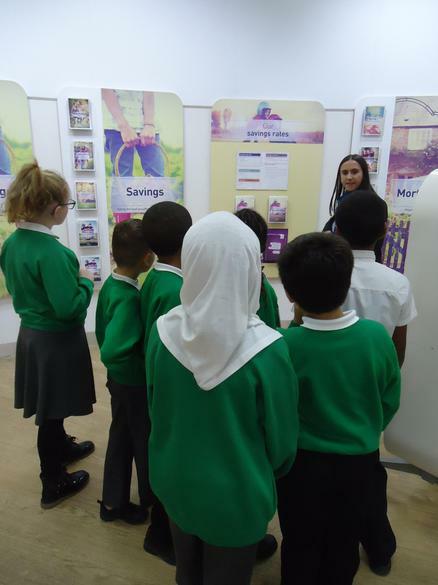 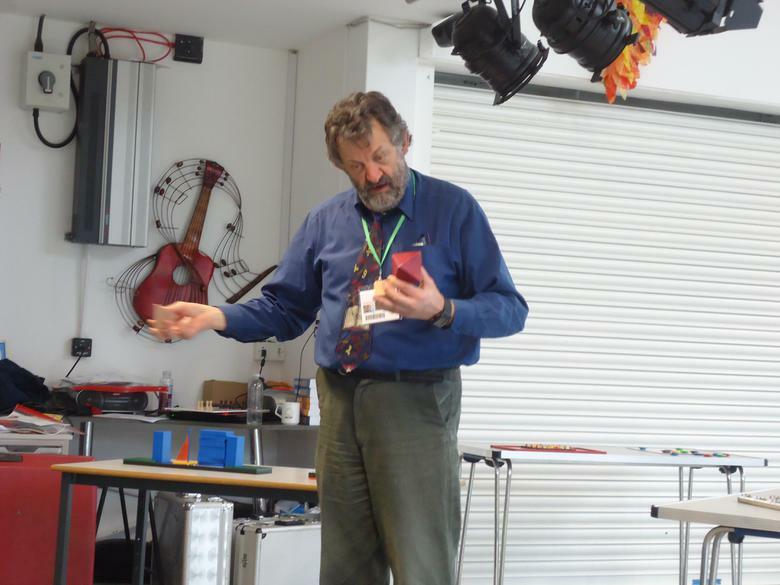 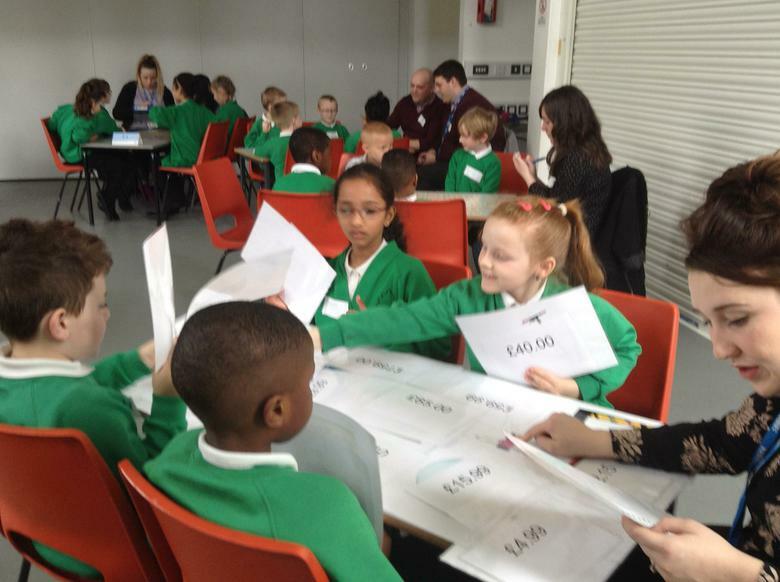 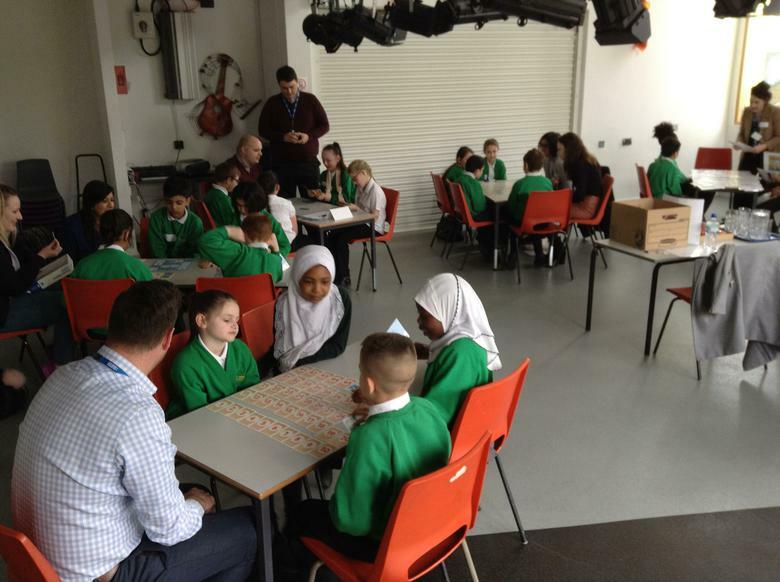 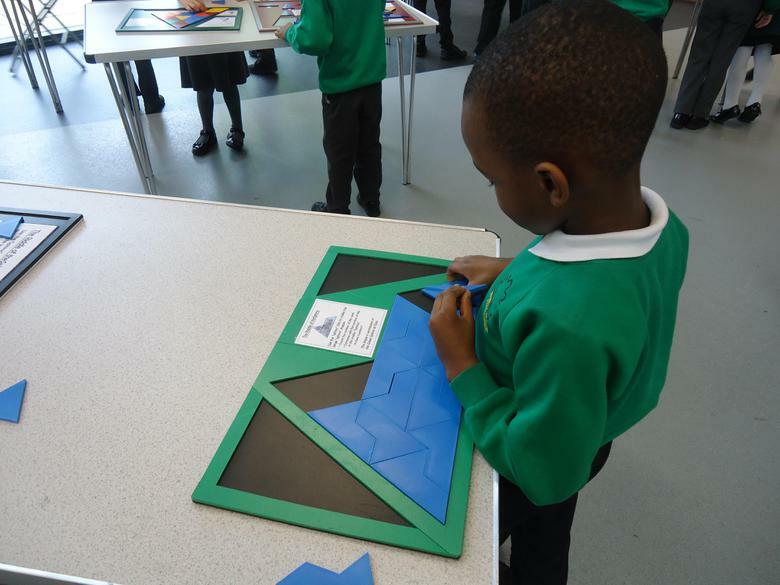 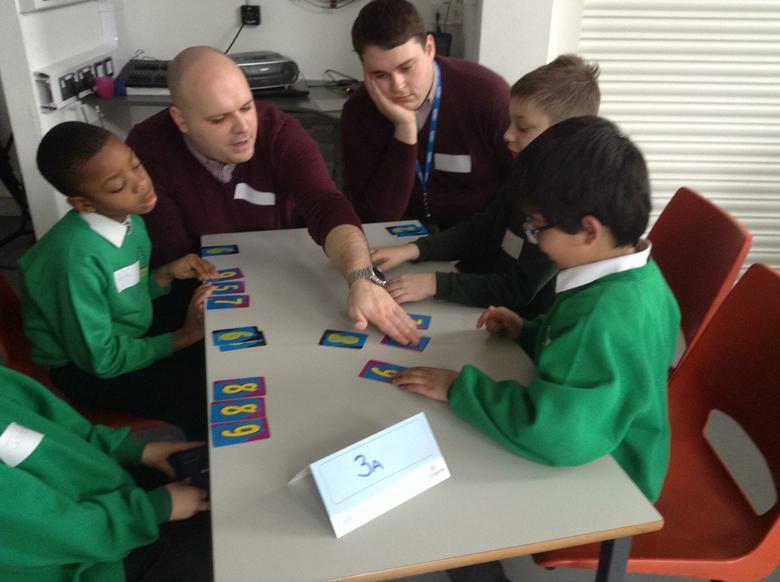 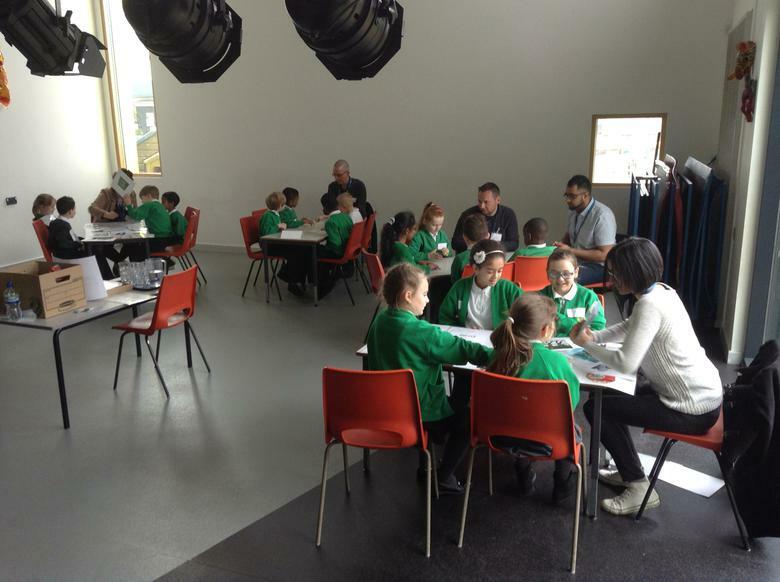 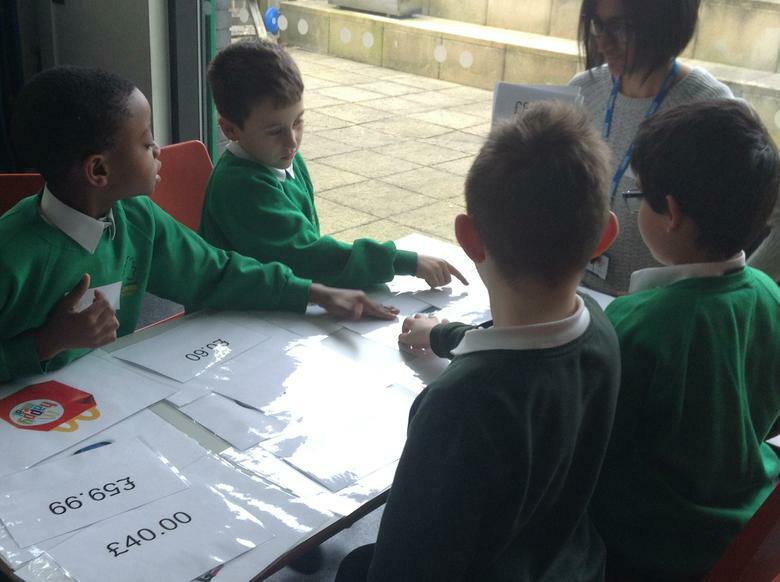 In October, some children from Years 5 and 6 were invited to Coventry Building Society to see how their maths skills can be applied in the everyday world. 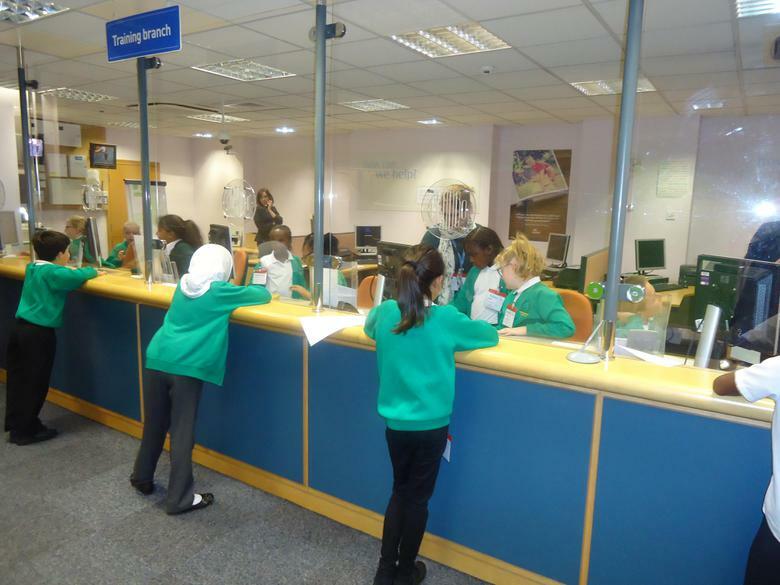 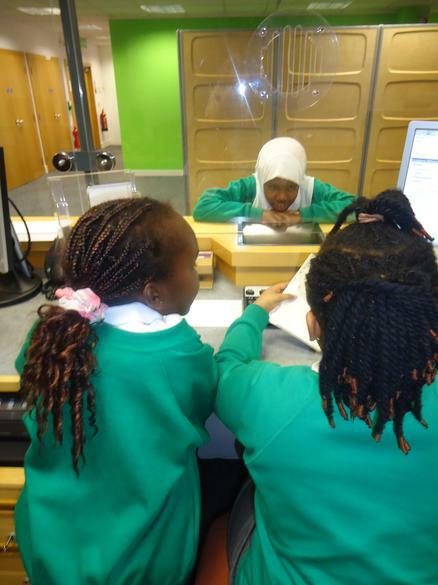 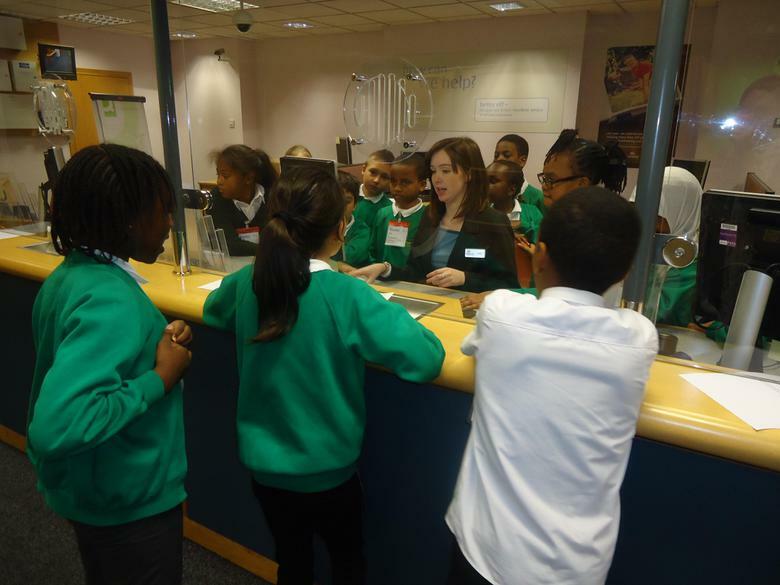 They had the chance to learn about the roles of different people within the Building Society, think about budgeting and costs as well as serving customers as cashiers. 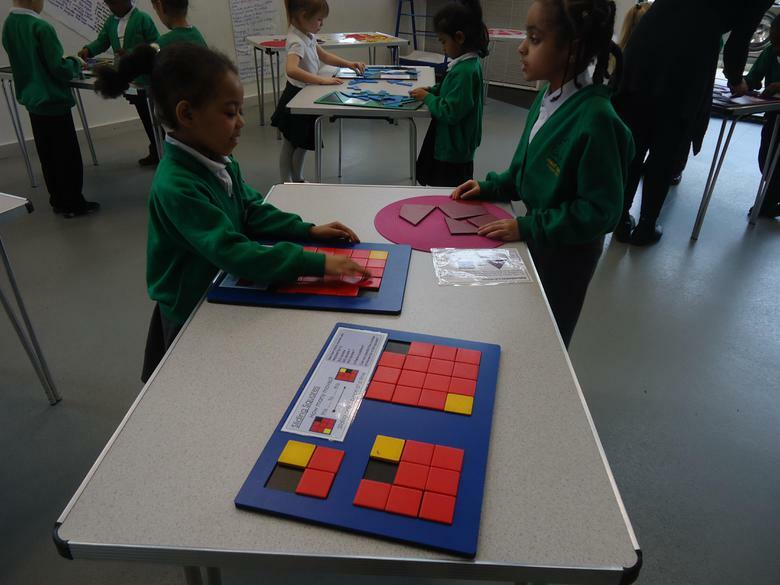 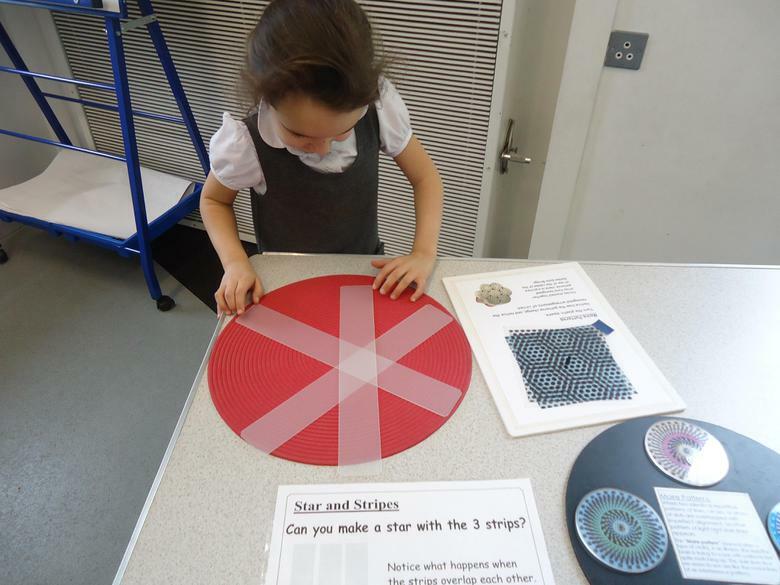 Here are some examples of maths displays in our school. 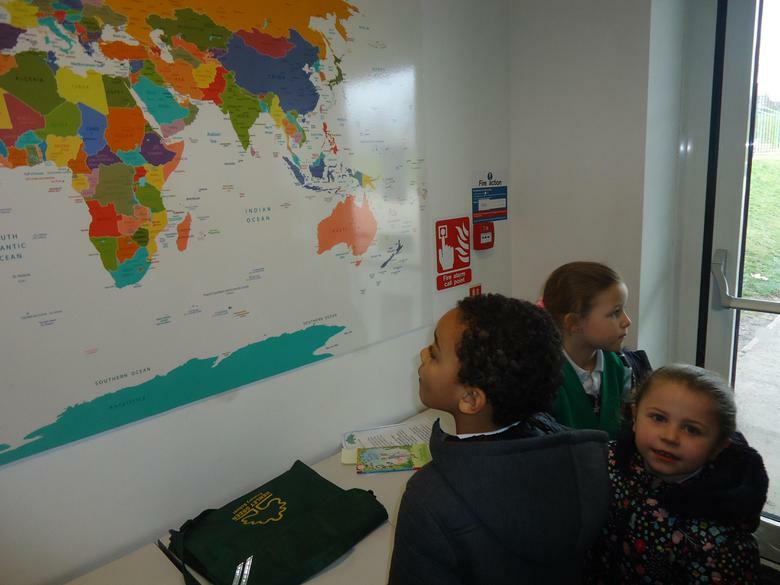 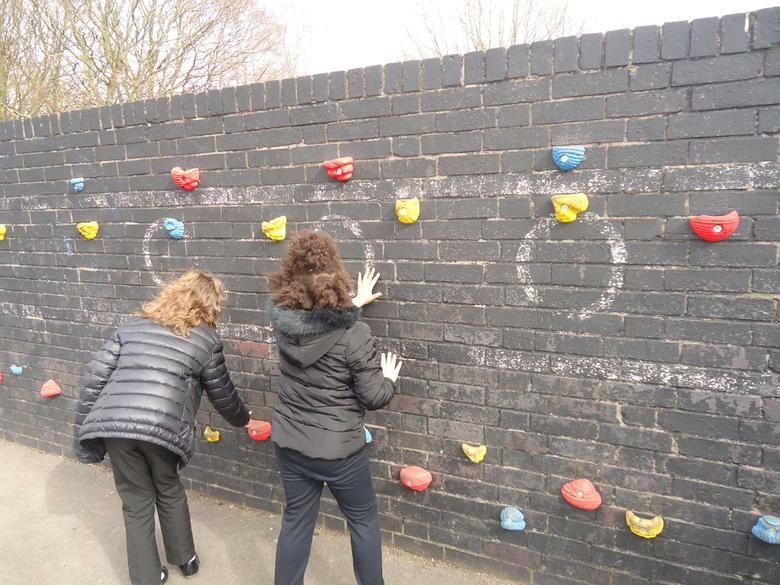 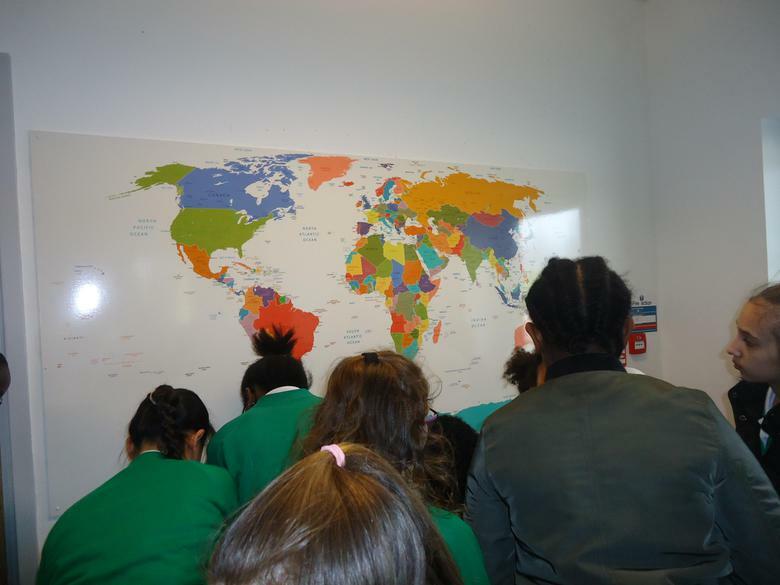 Wherever we can, we link our maths learning to other subjects and the wider world. 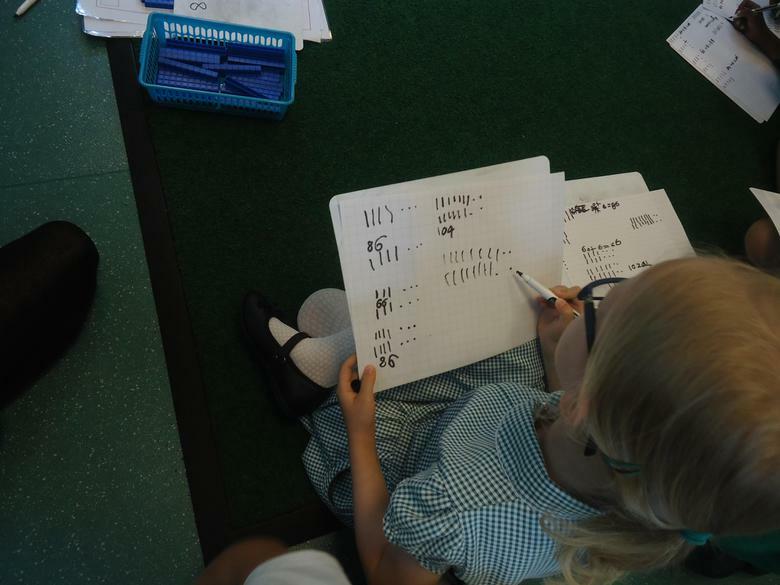 Children in Years 3 to 6 have access to Times Tables Rock Stars. 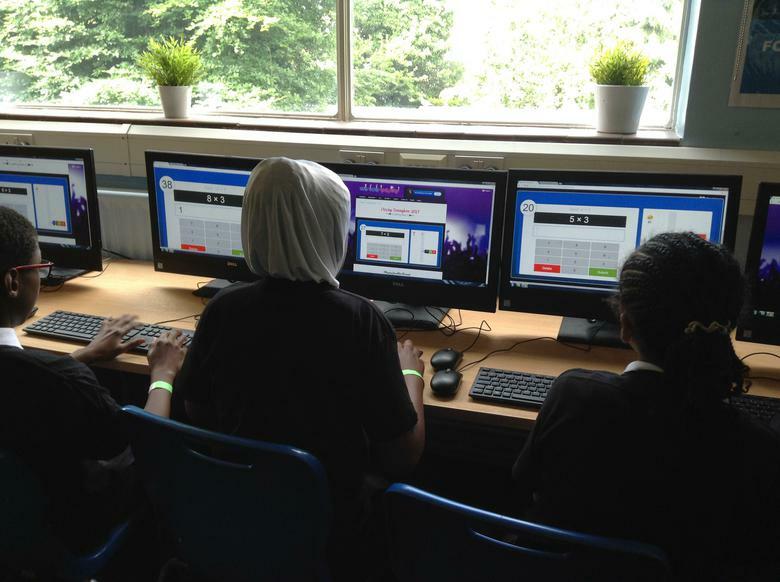 This website helps them to improve their knowledge and speed of times tables facts up to 12 x 12. 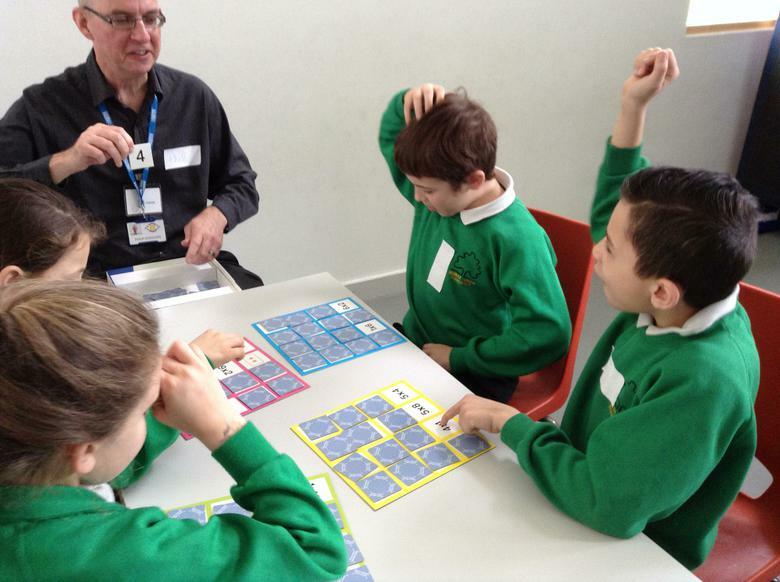 Can you become a Times Tables Rock Legend?